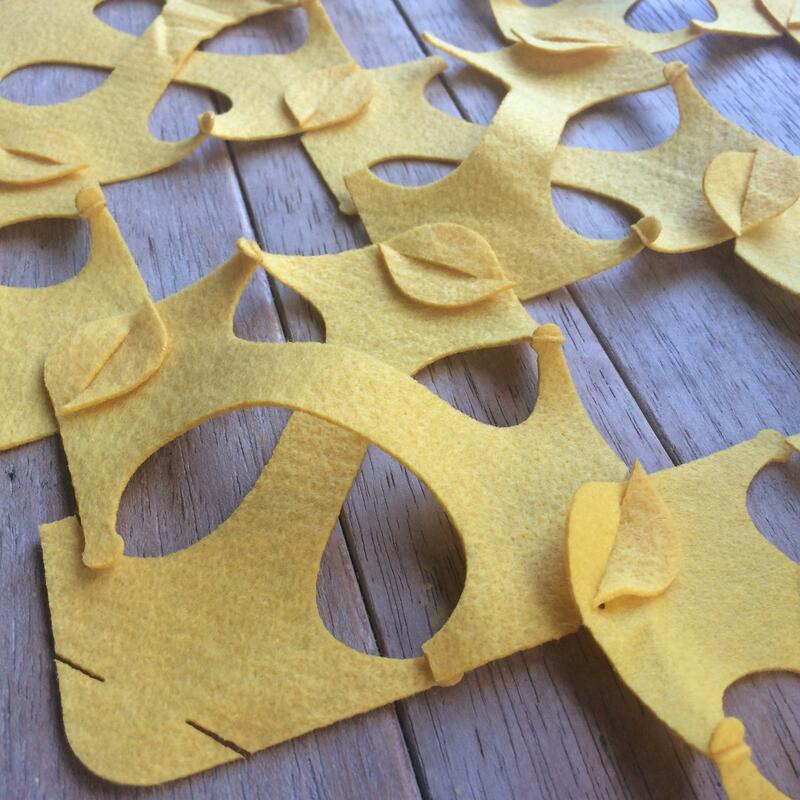 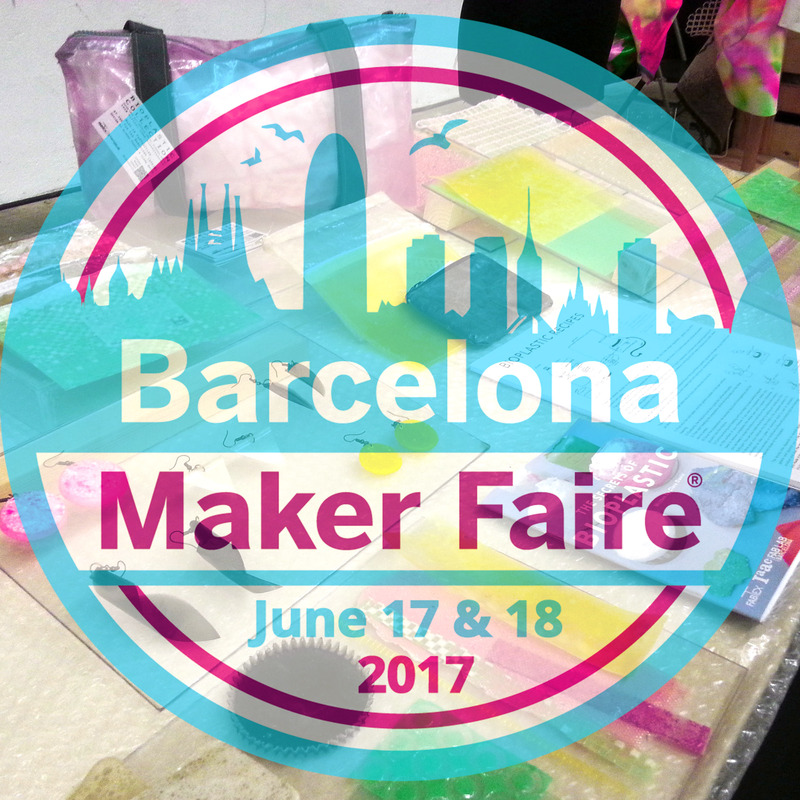 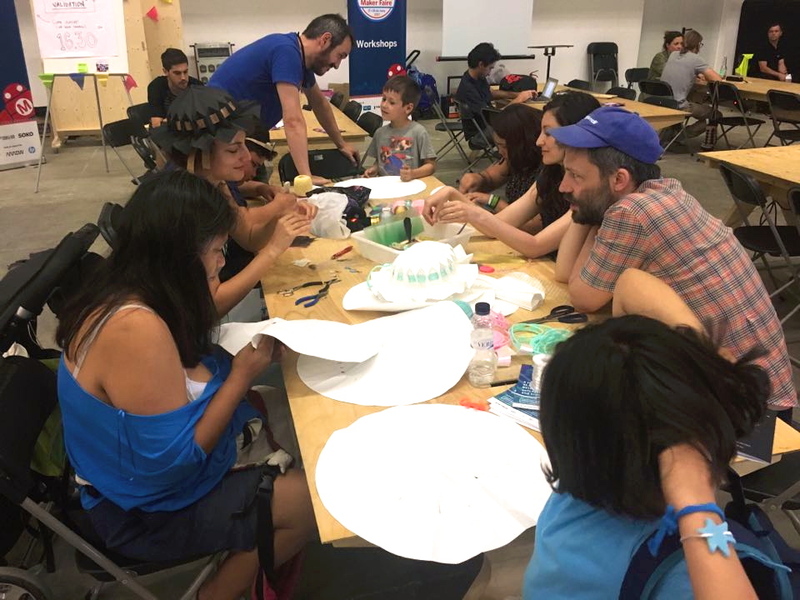 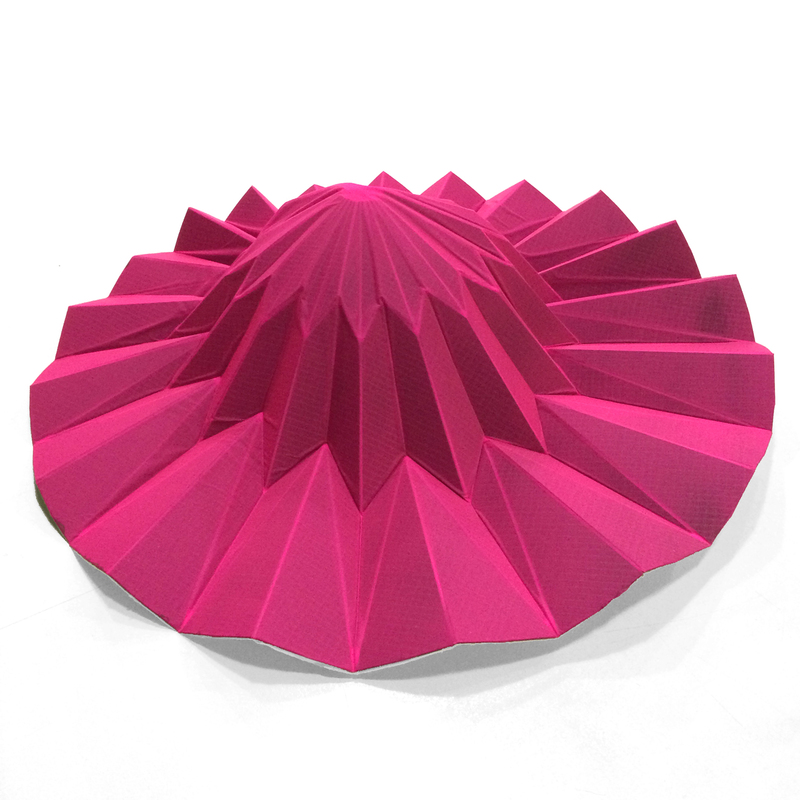 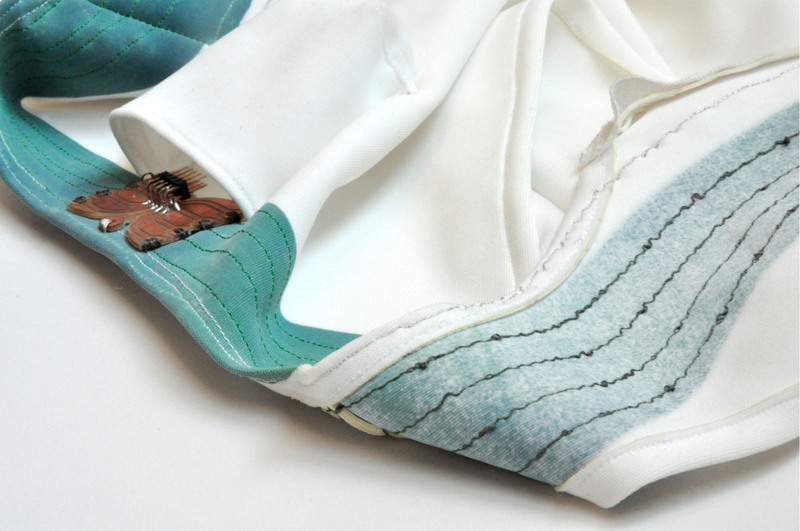 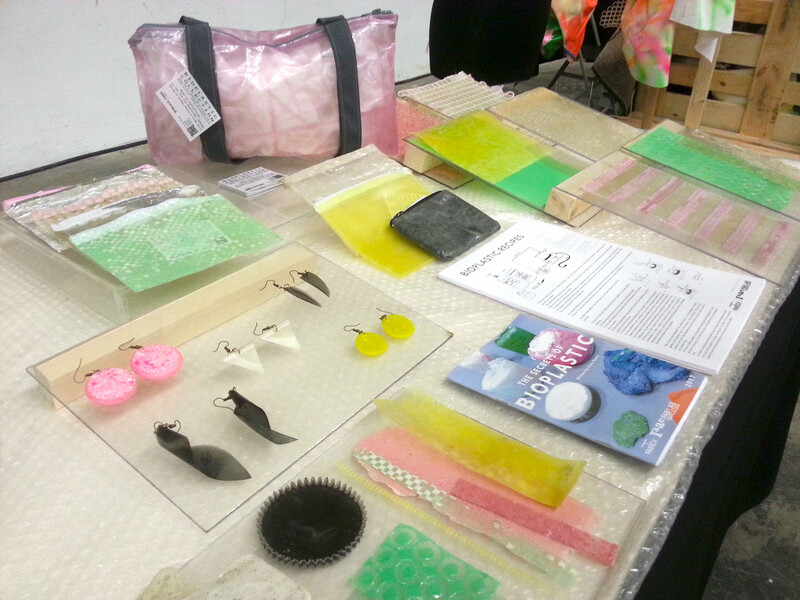 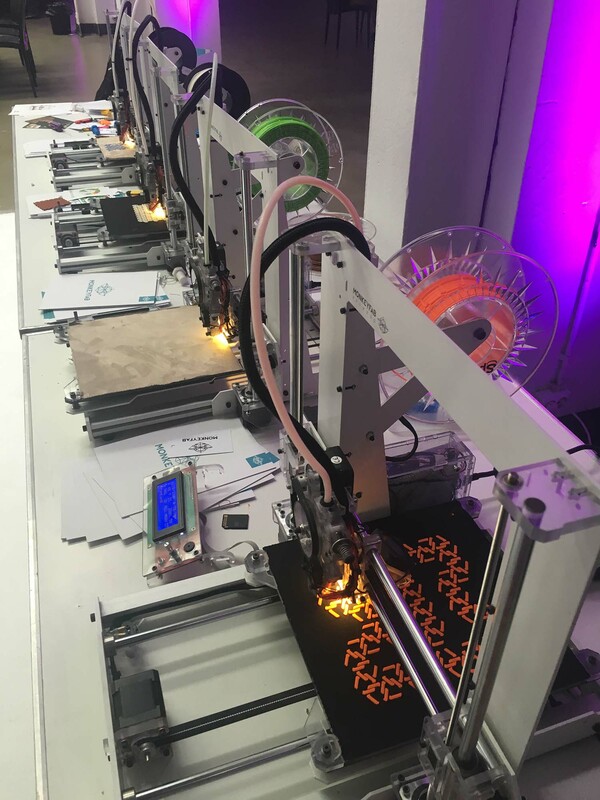 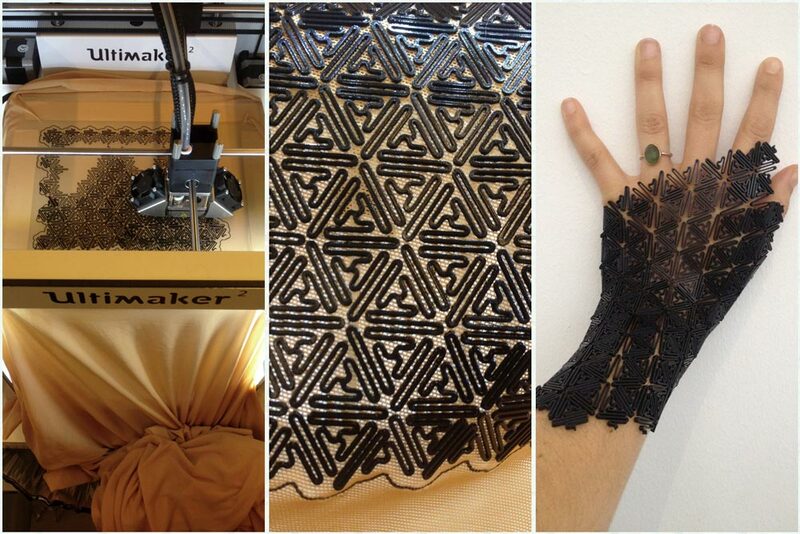 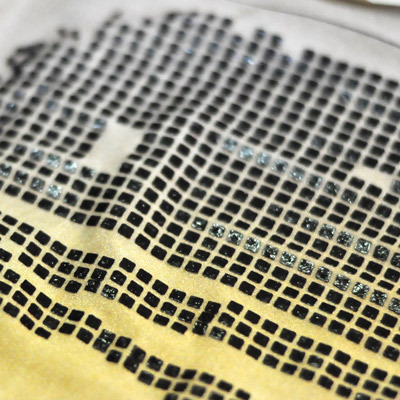 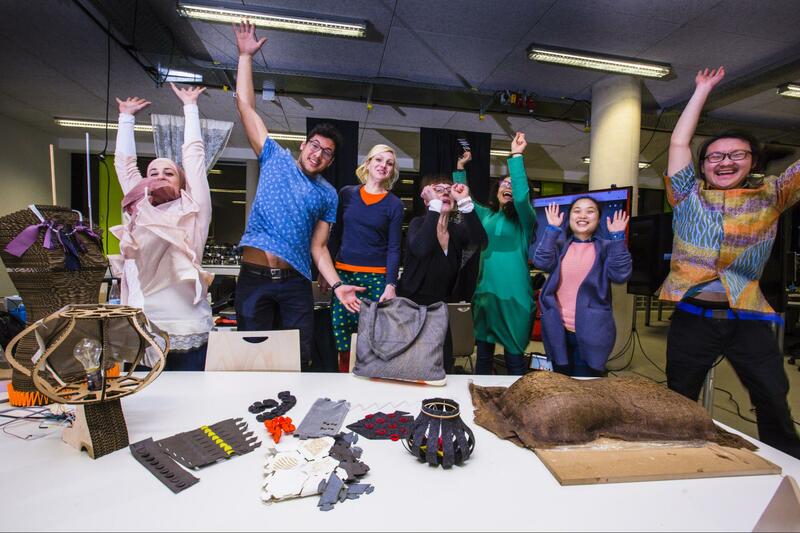 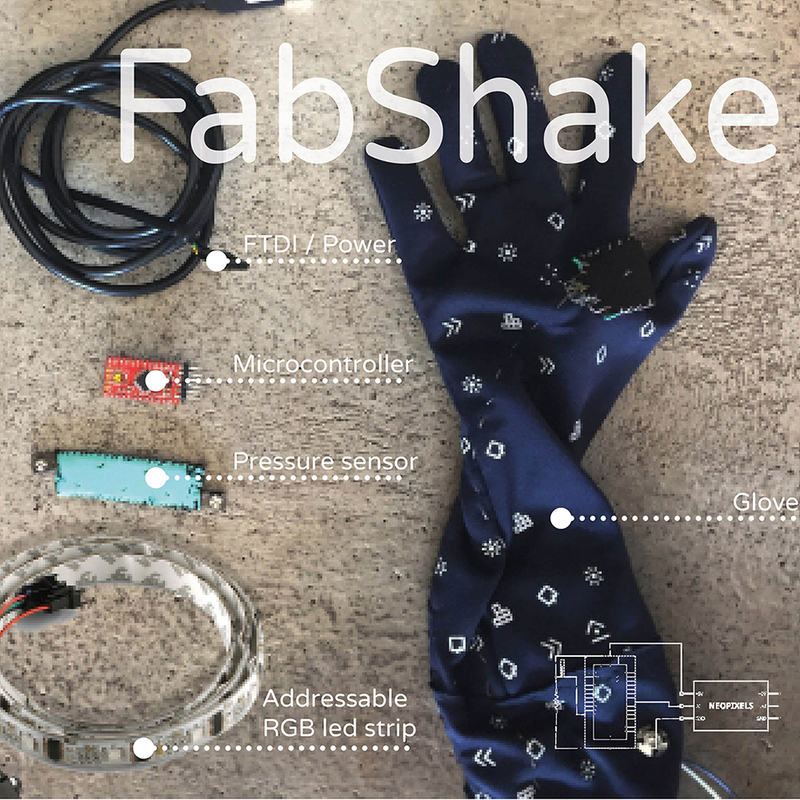 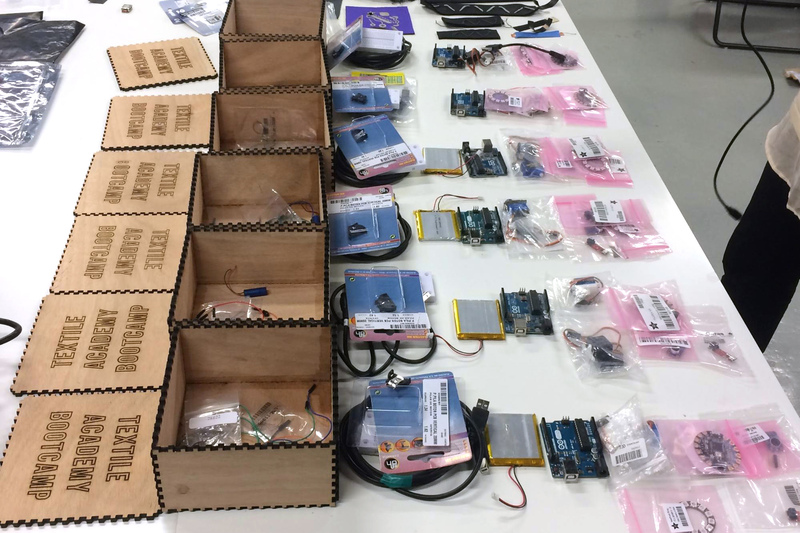 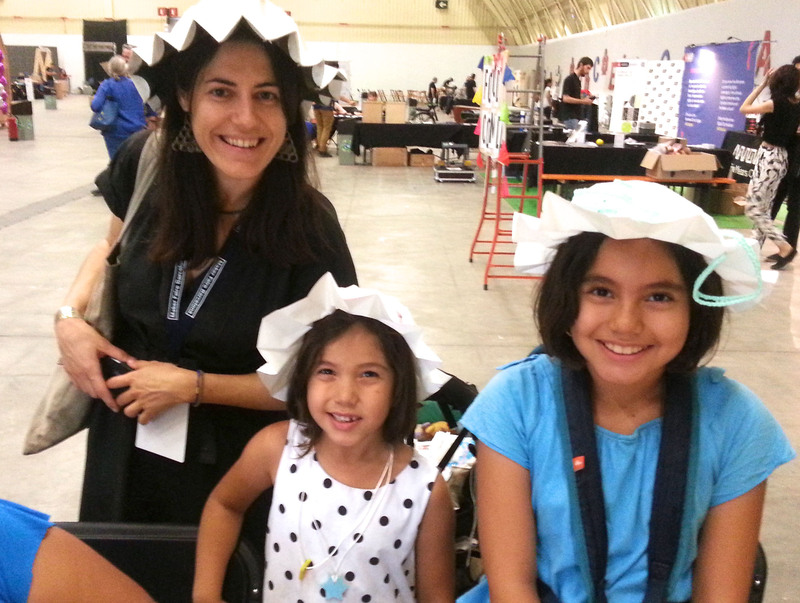 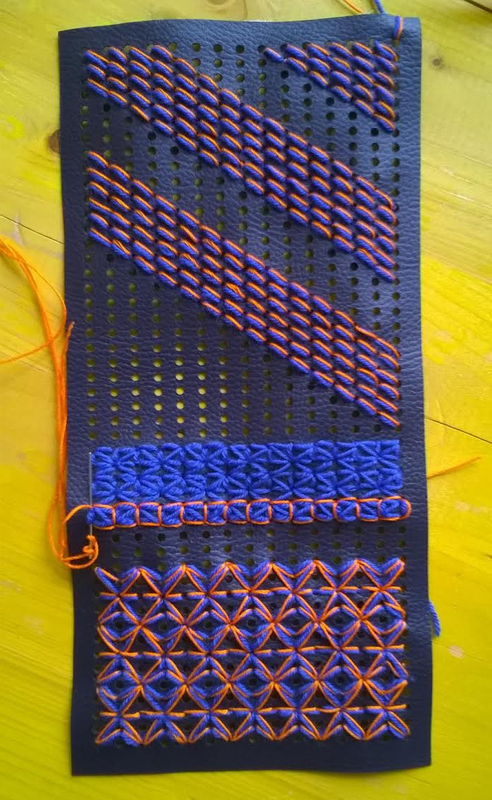 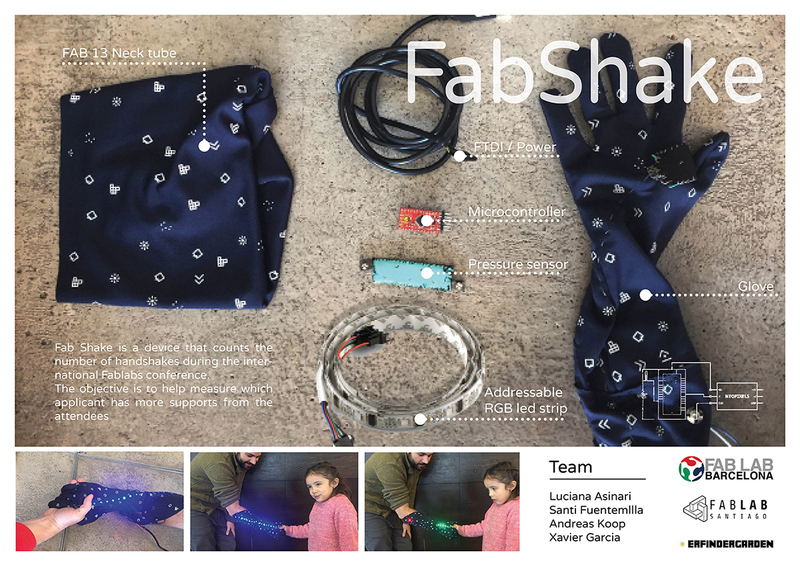 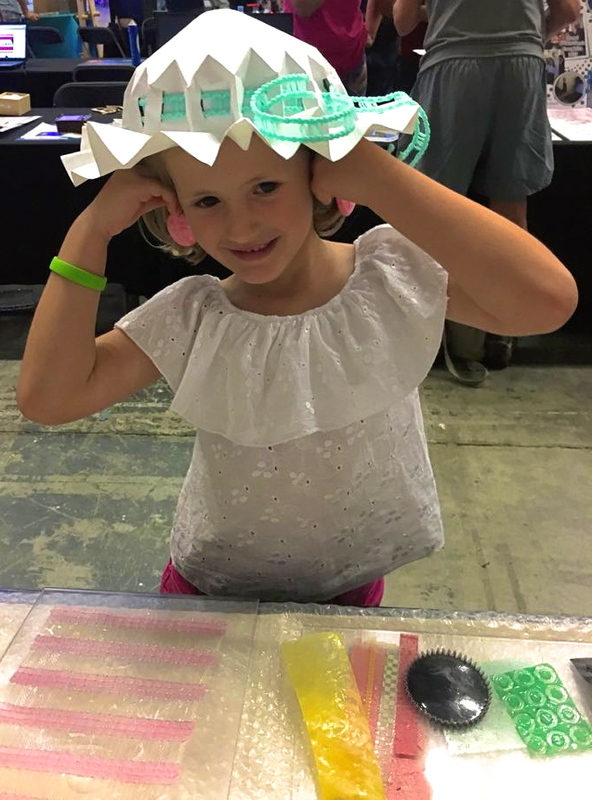 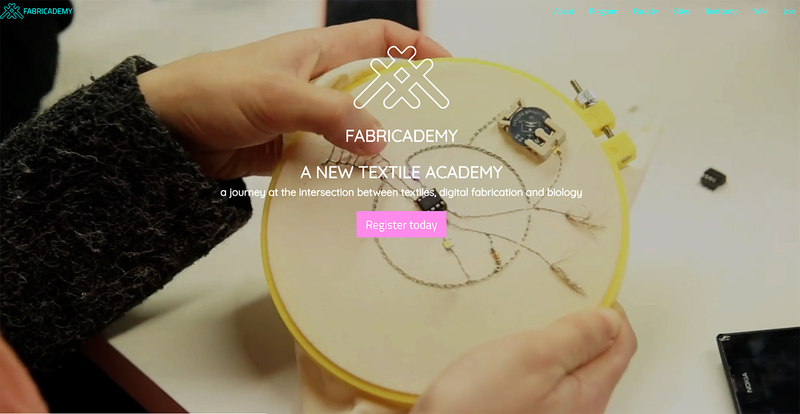 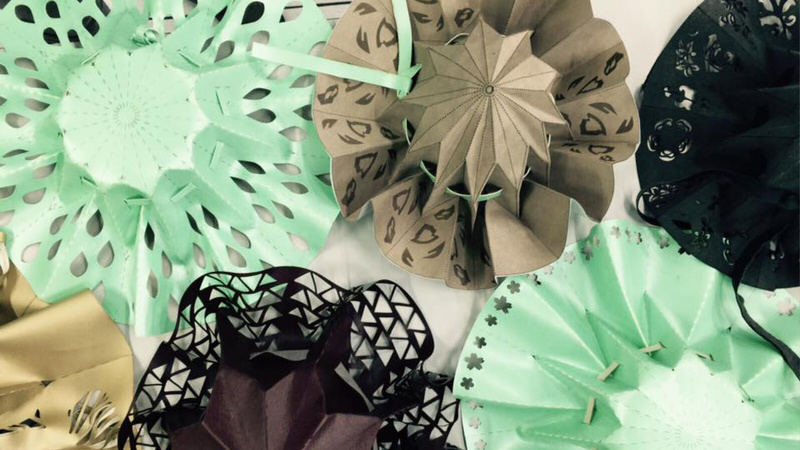 This year FabTextiles participated in the FAB14, the annual gathering of Fab Labs globally. 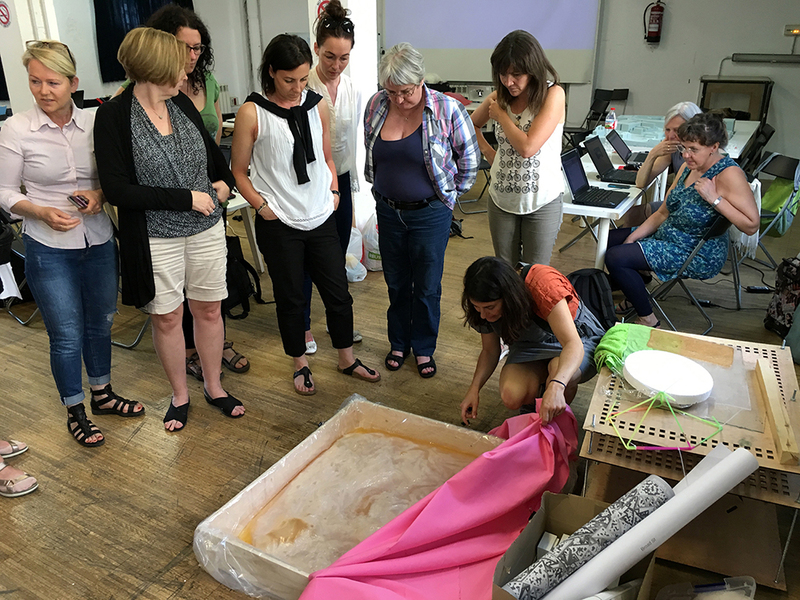 The event took place in different locations across France from the 11th to the 22th of July. 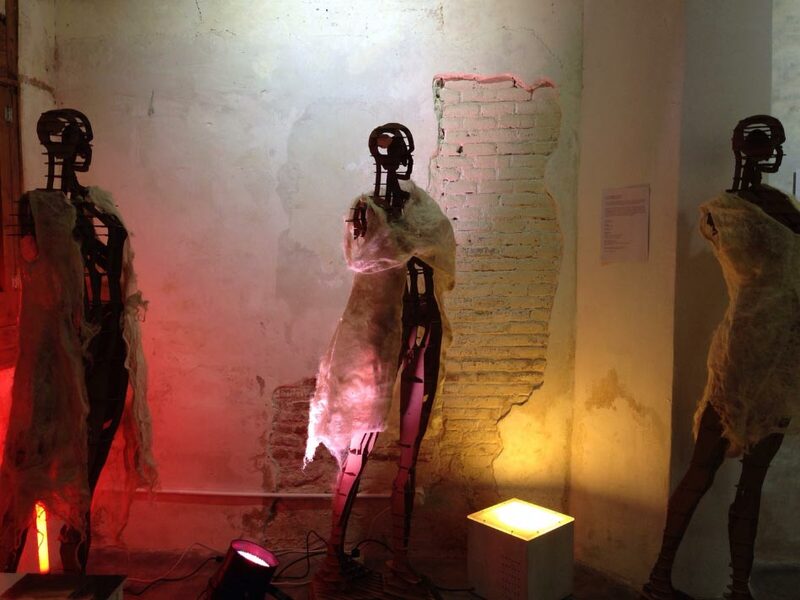 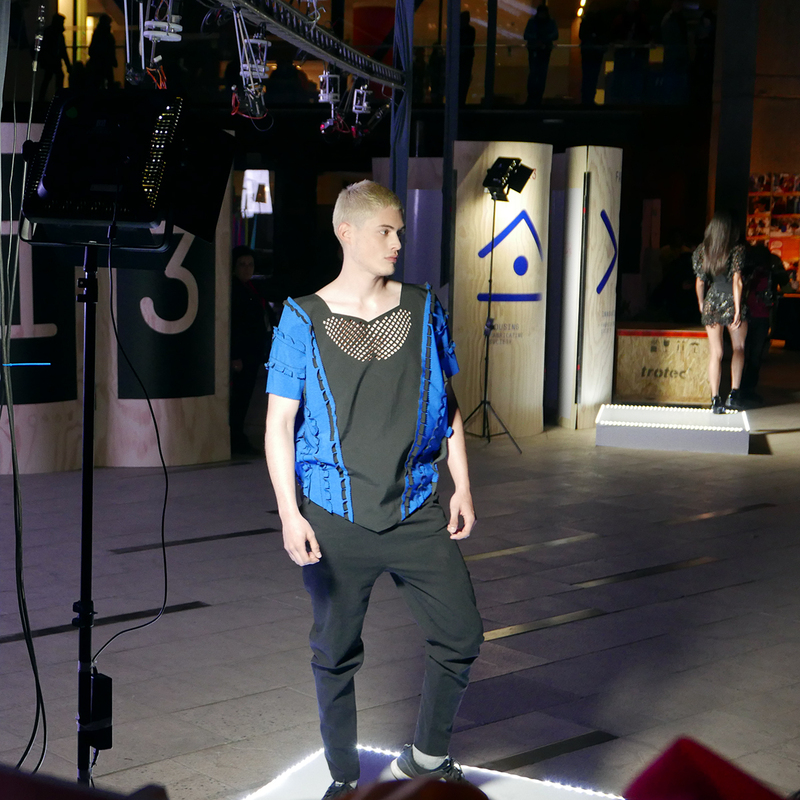 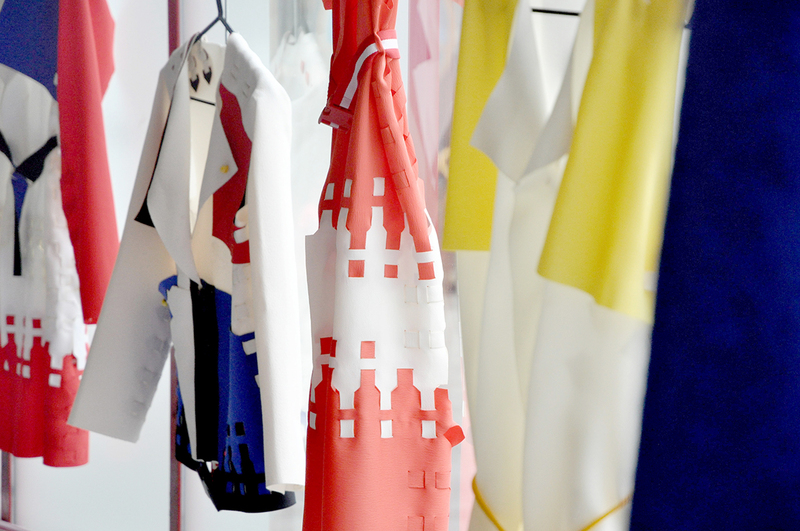 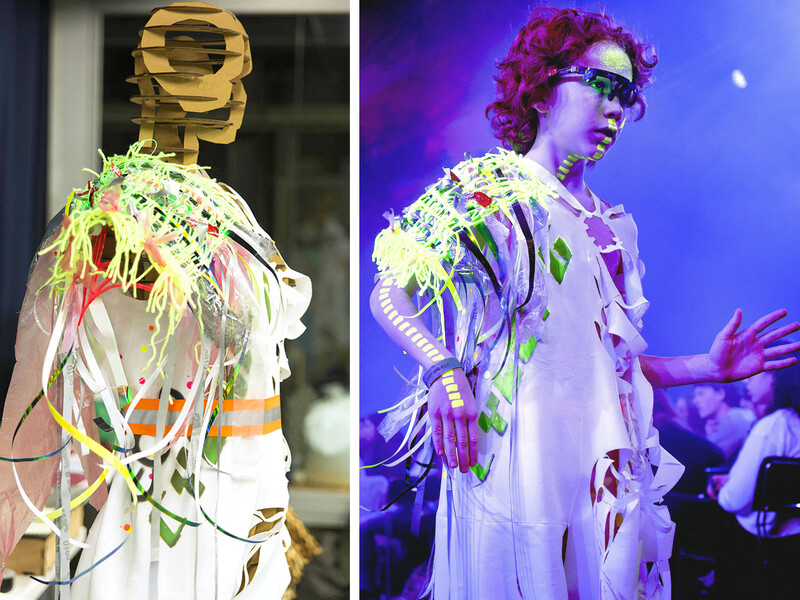 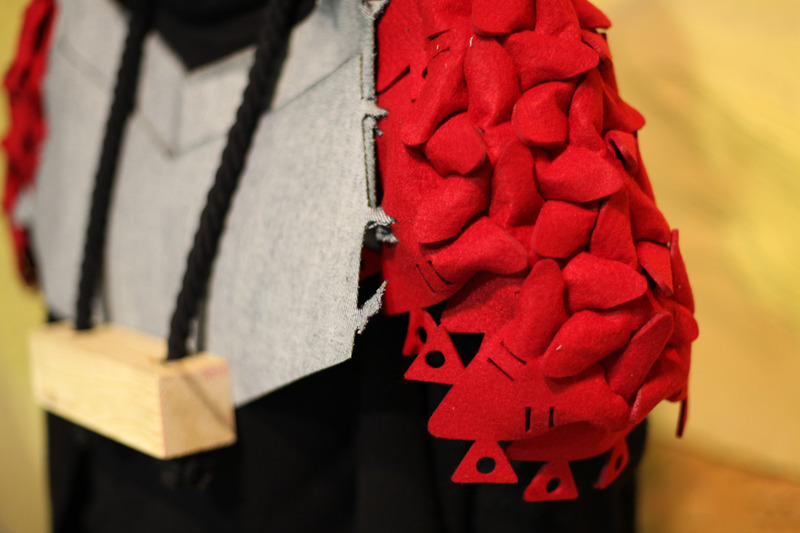 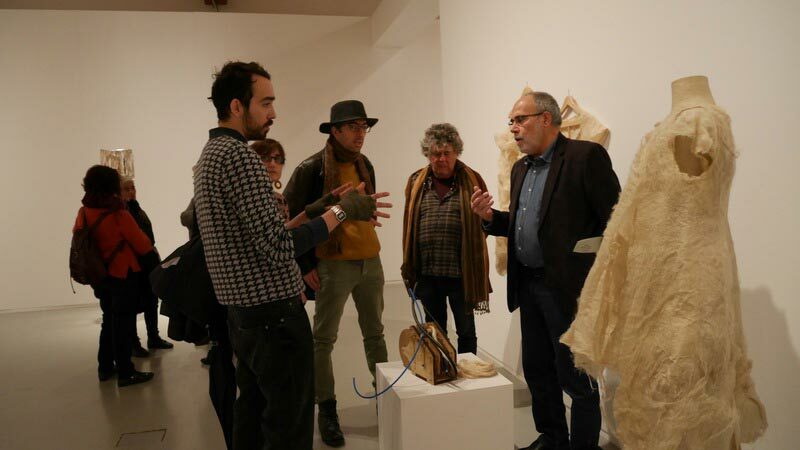 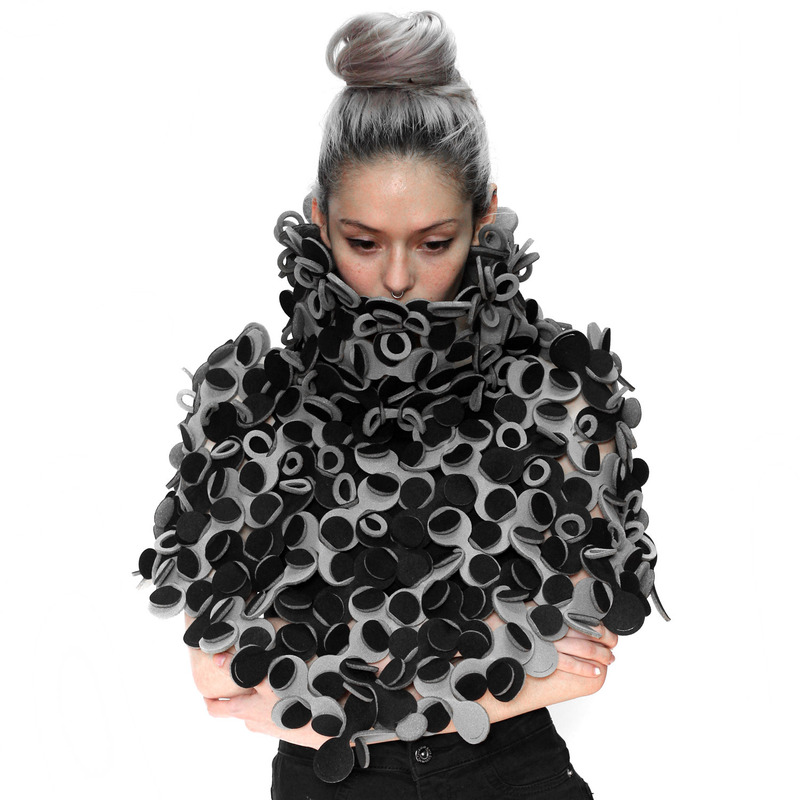 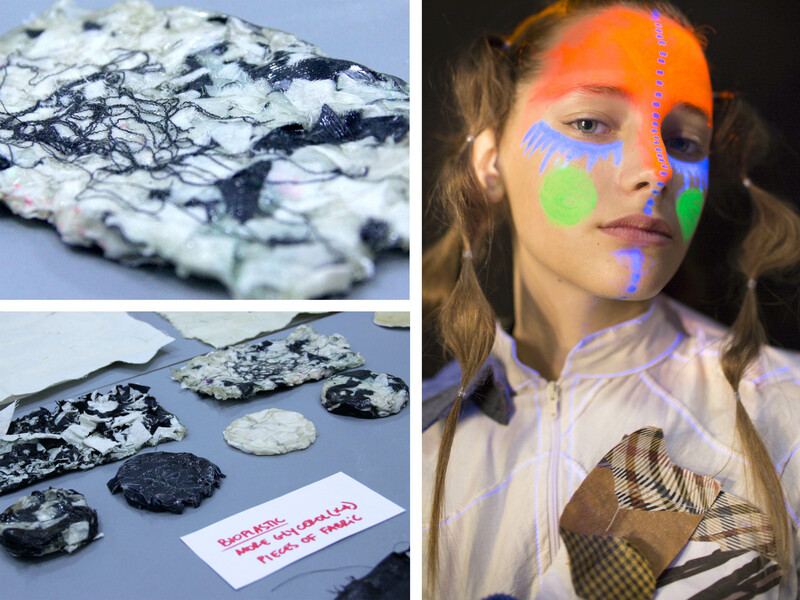 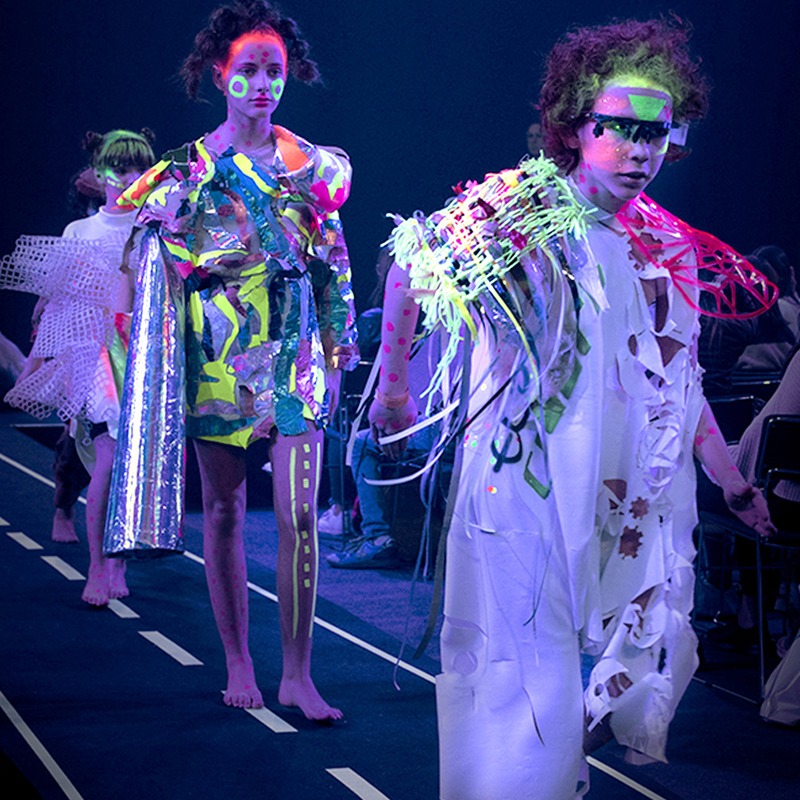 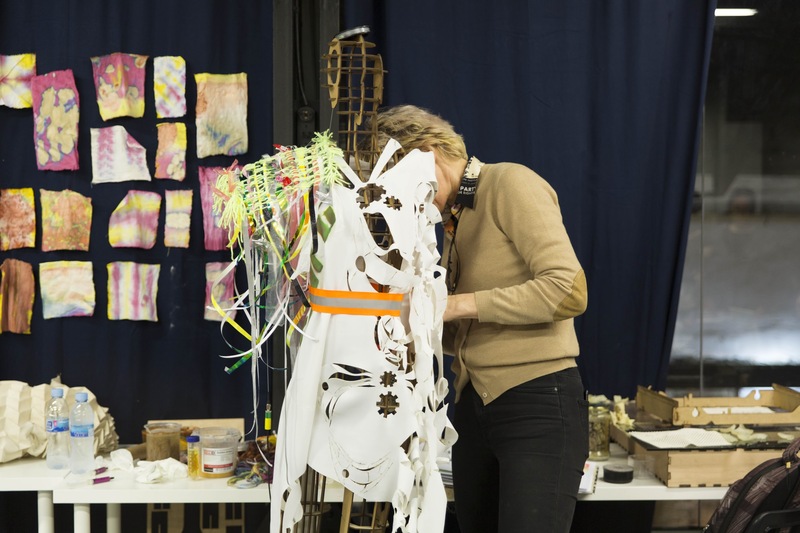 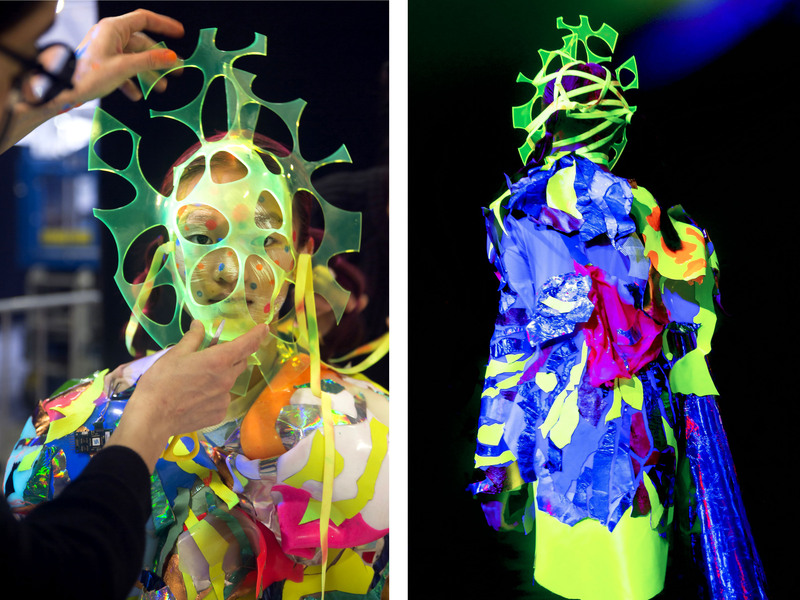 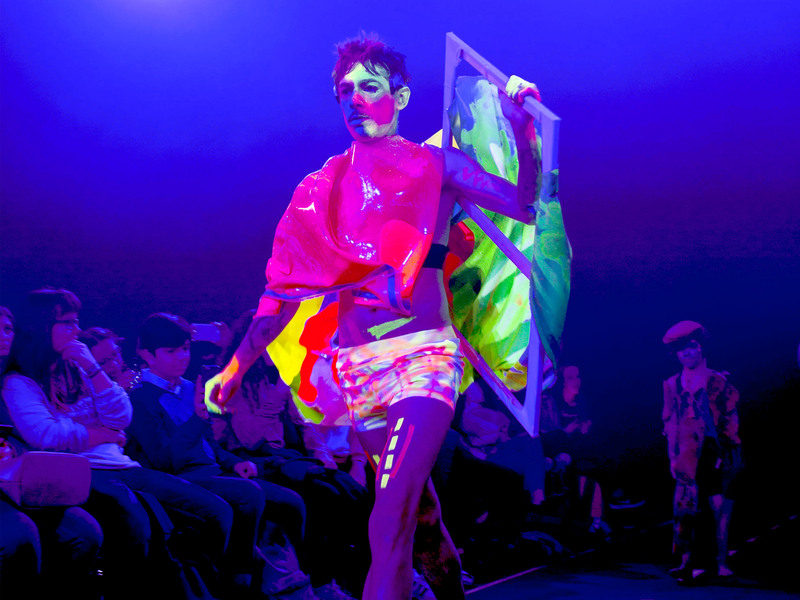 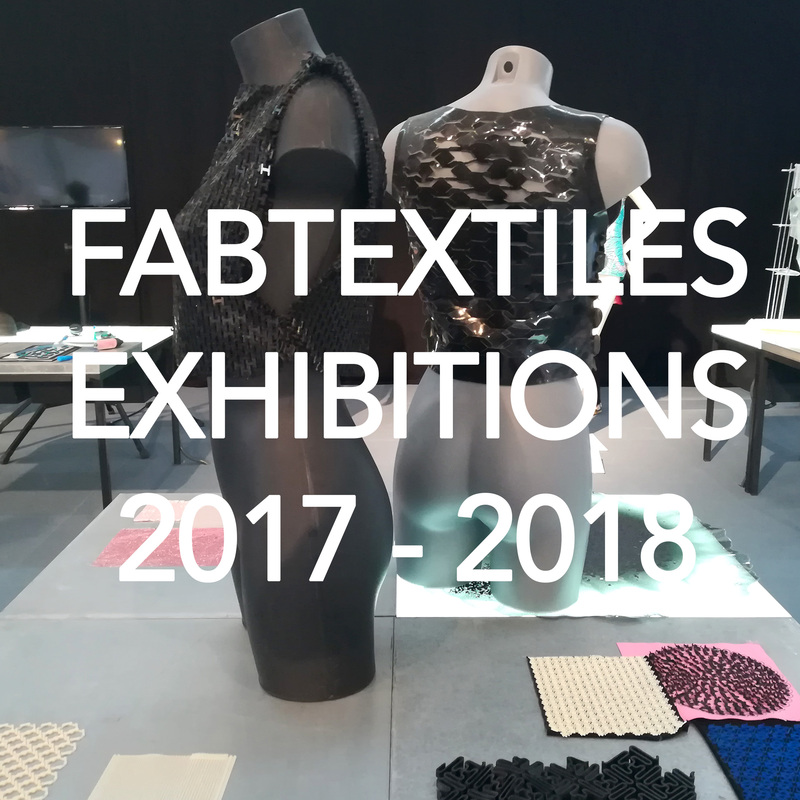 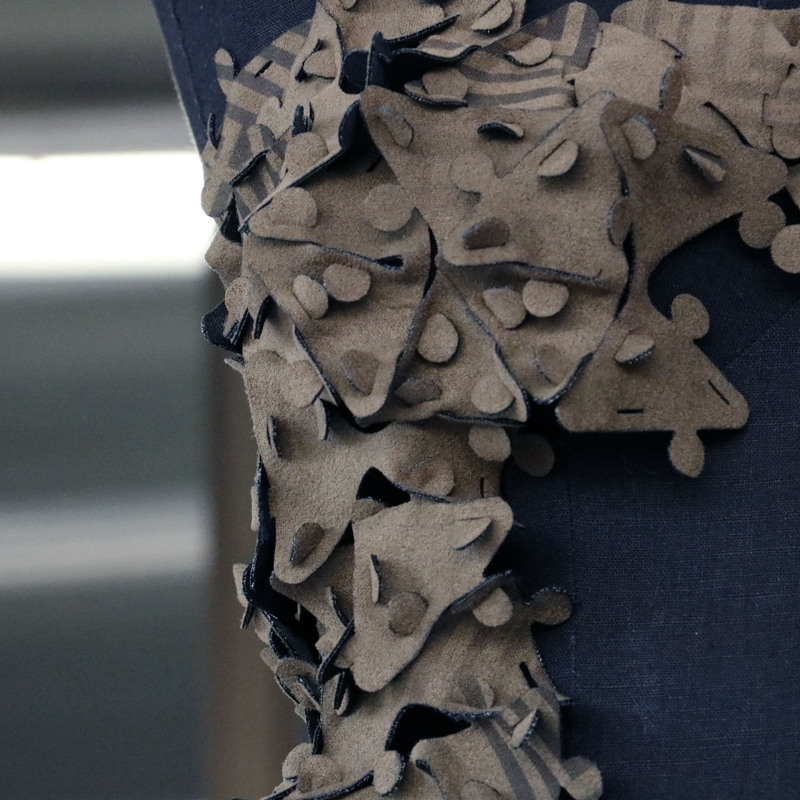 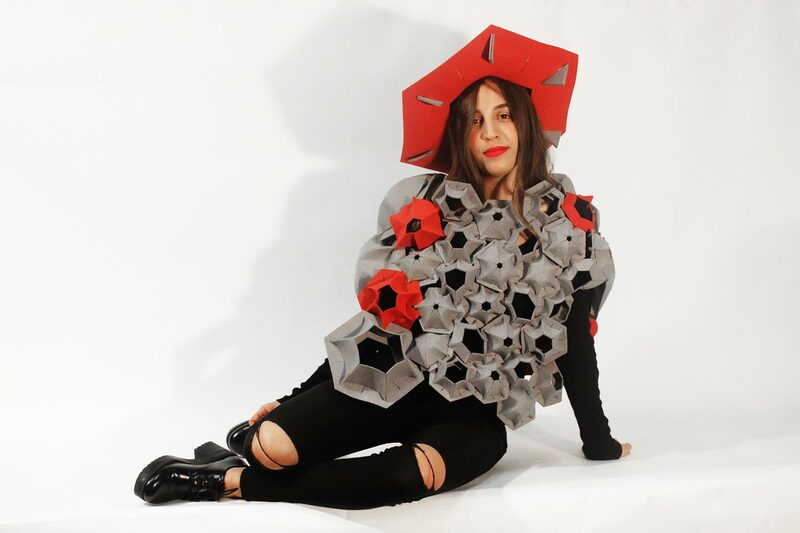 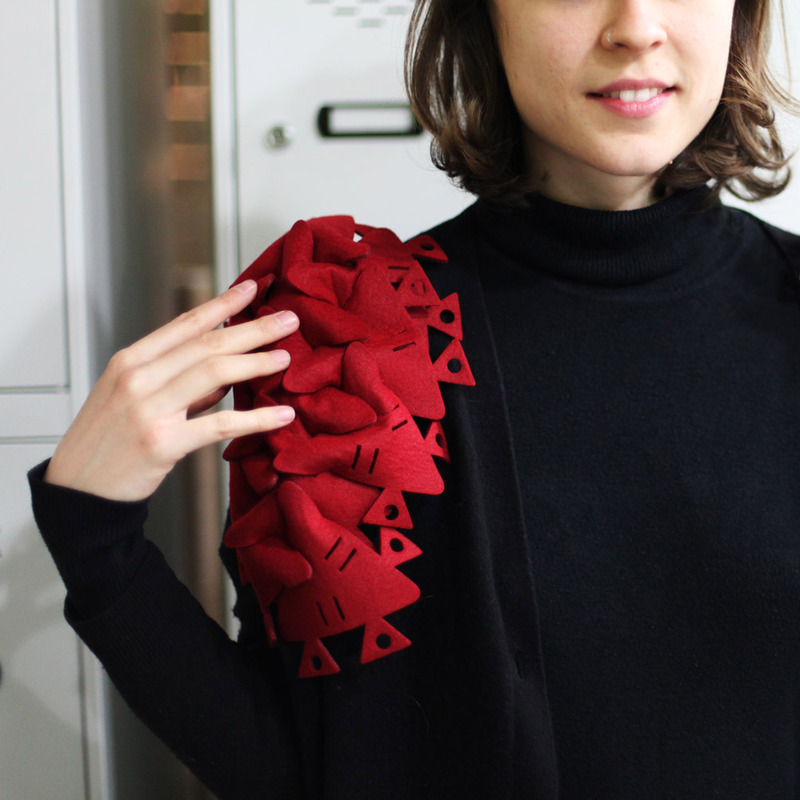 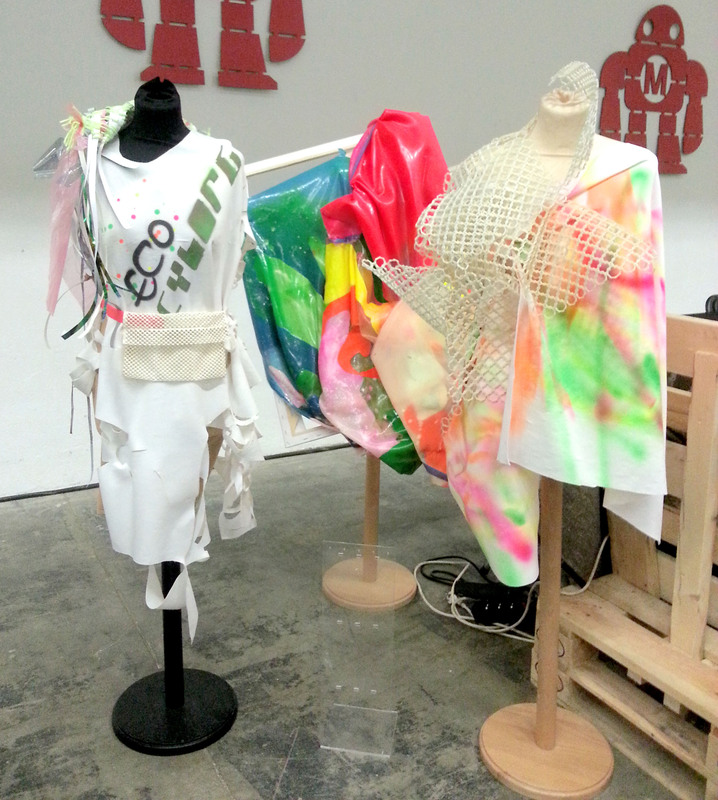 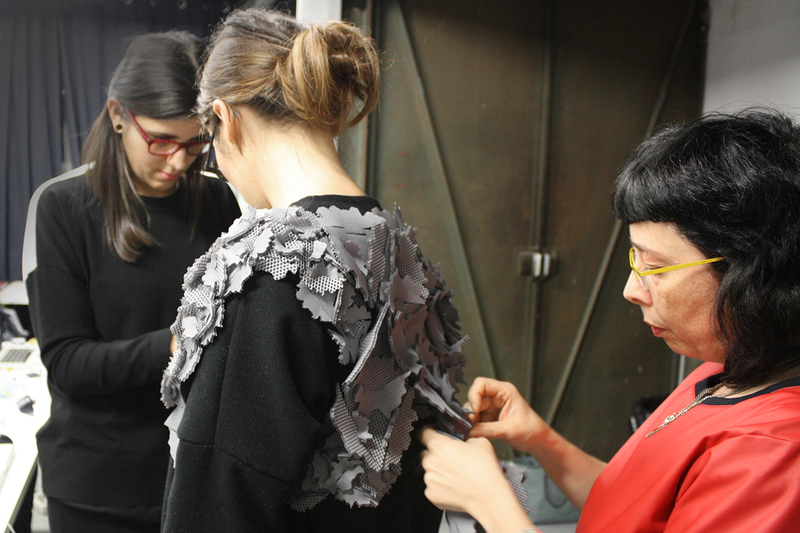 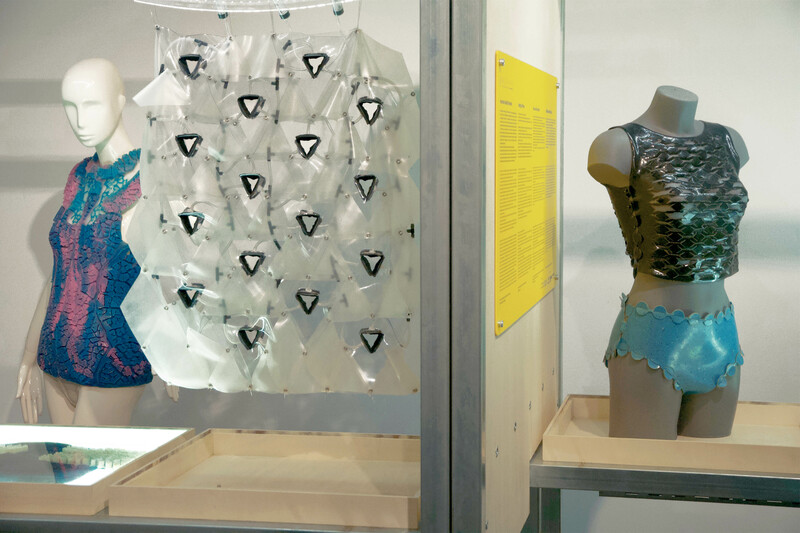 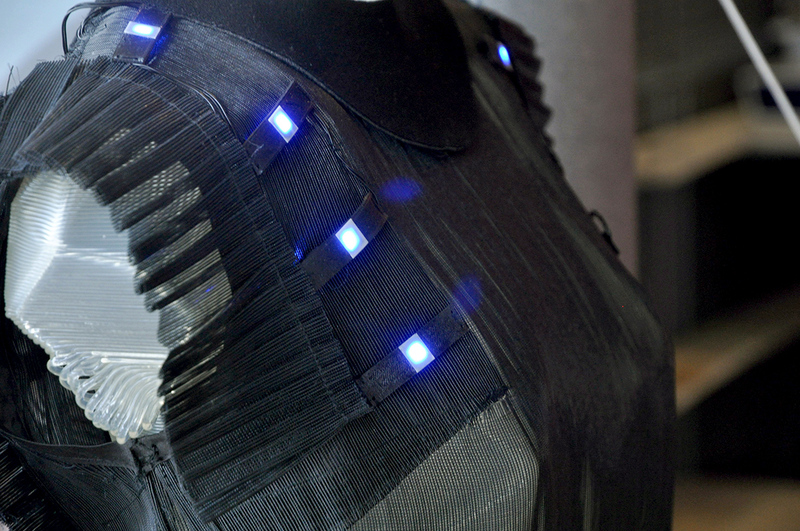 First, FabTextiles exhibited the 5th Digital Fashion & Wearables in Paris at Villette Makerz. 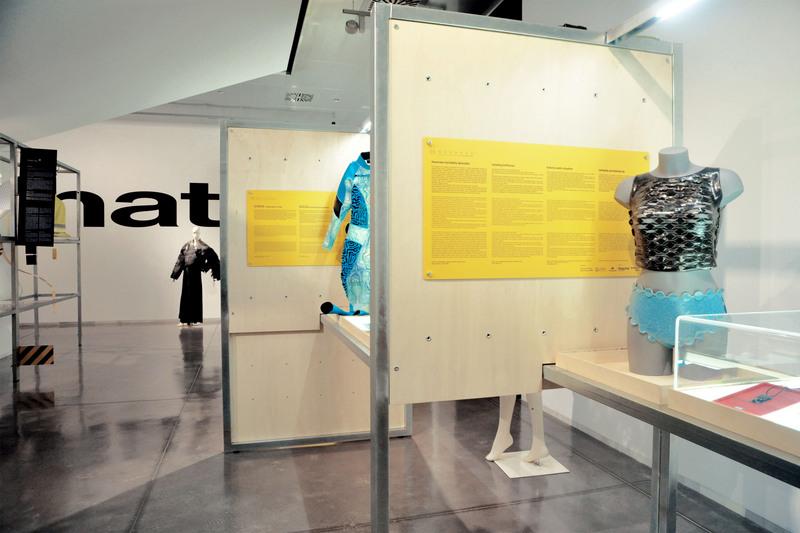 This exhibition was an open invitation to all curious minds that aspire to redesign our society with shared ethical and visionary values. 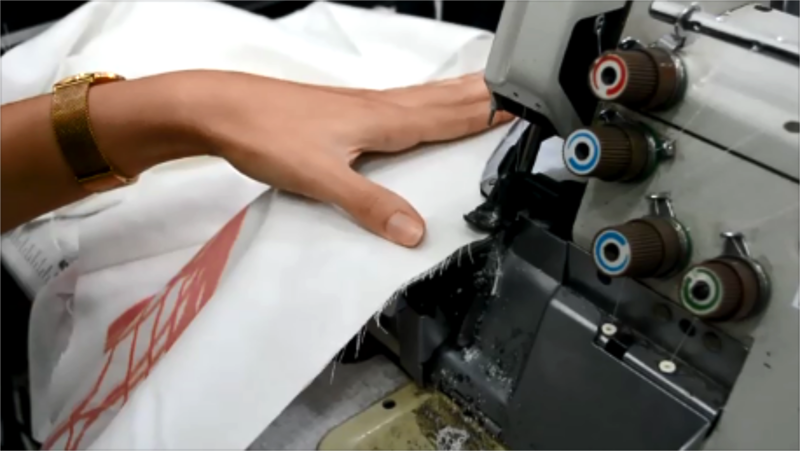 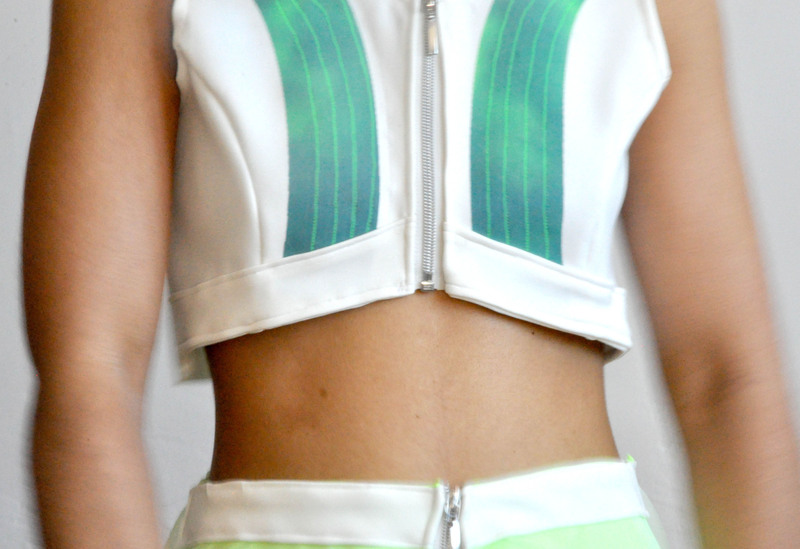 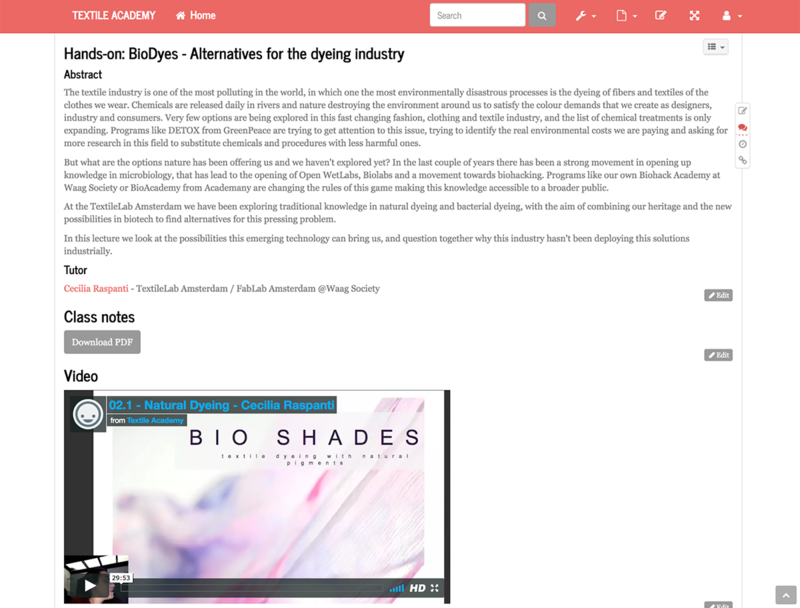 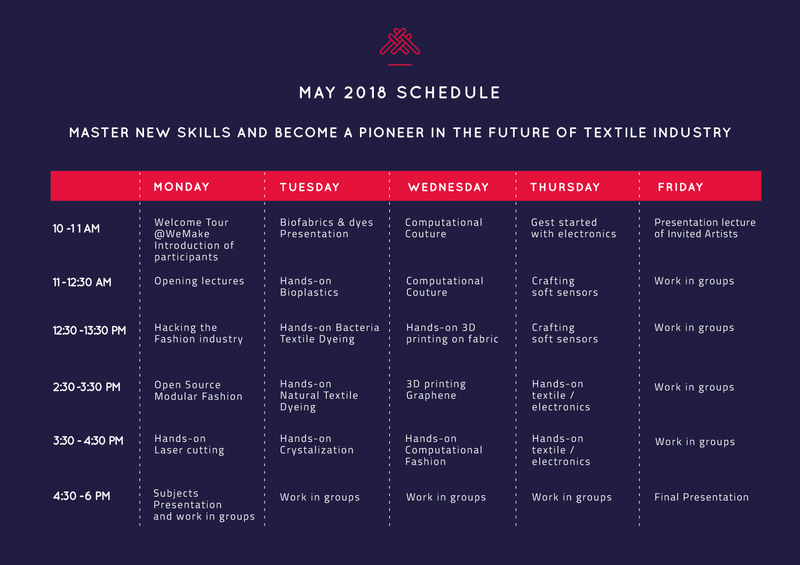 It is a group of creators that design concepts, techniques and materials and offer strategies relevant to merging technology with fashion and sustainability. 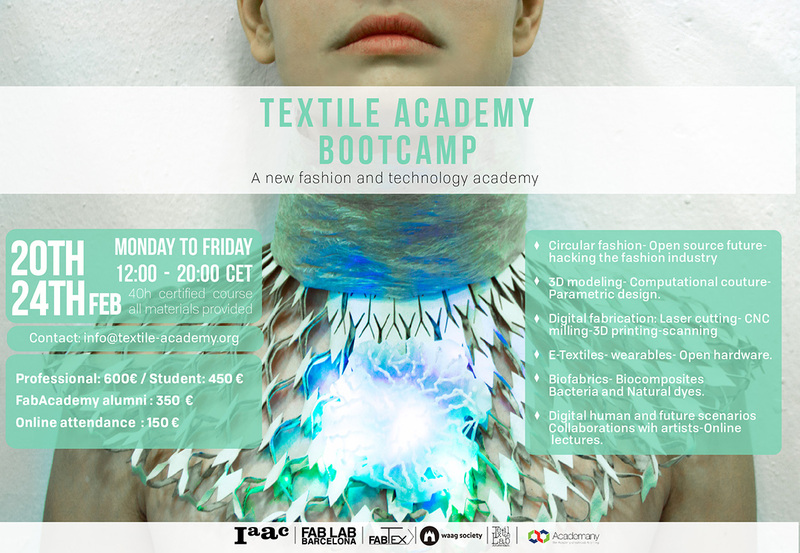 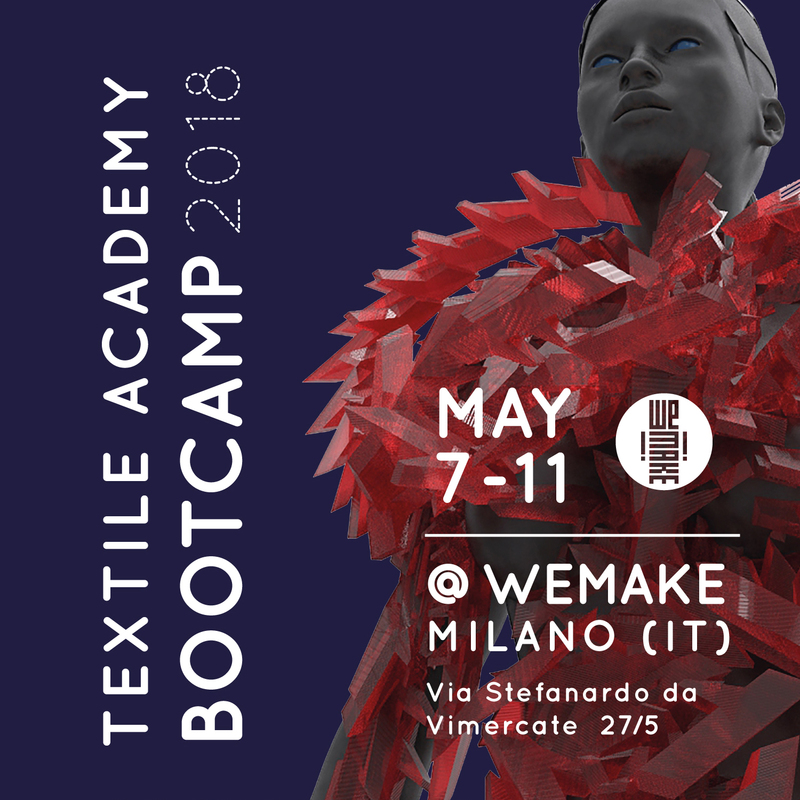 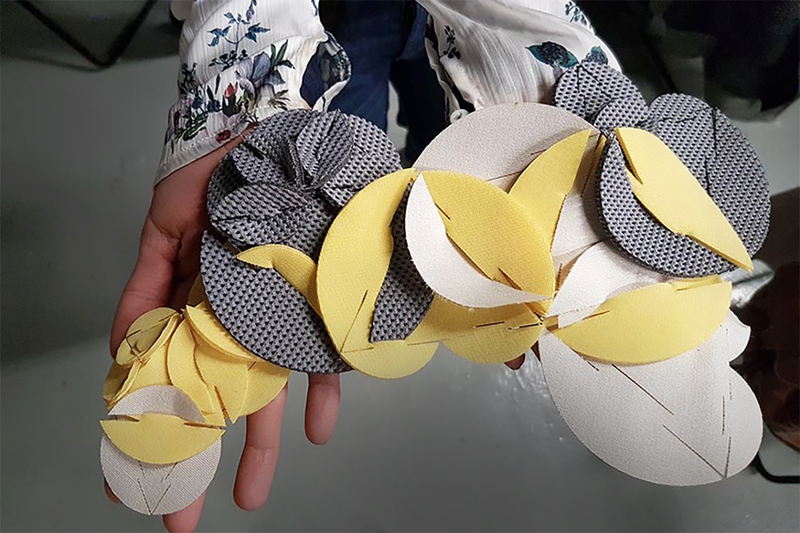 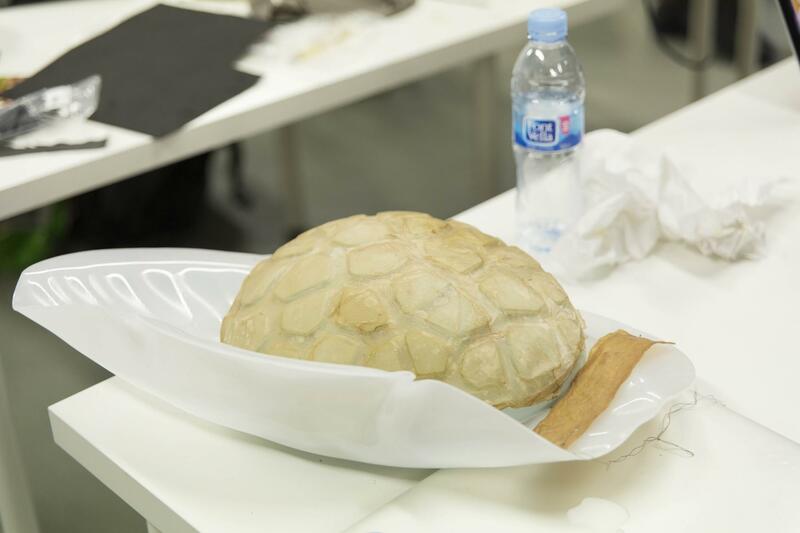 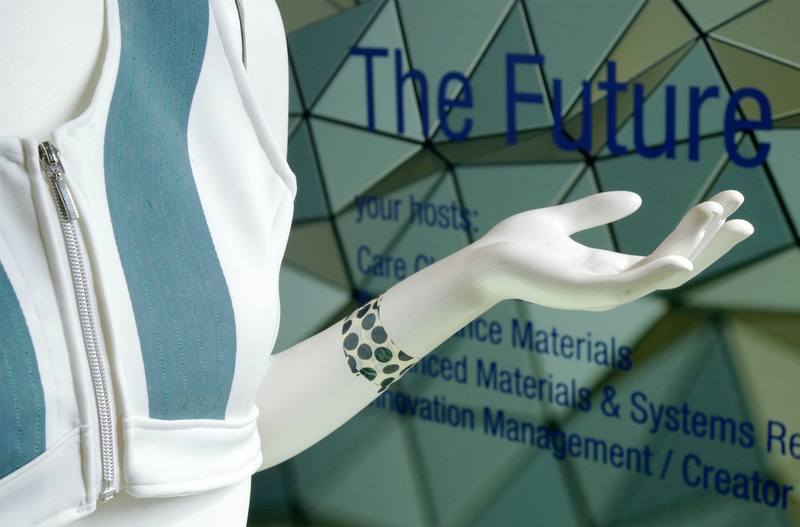 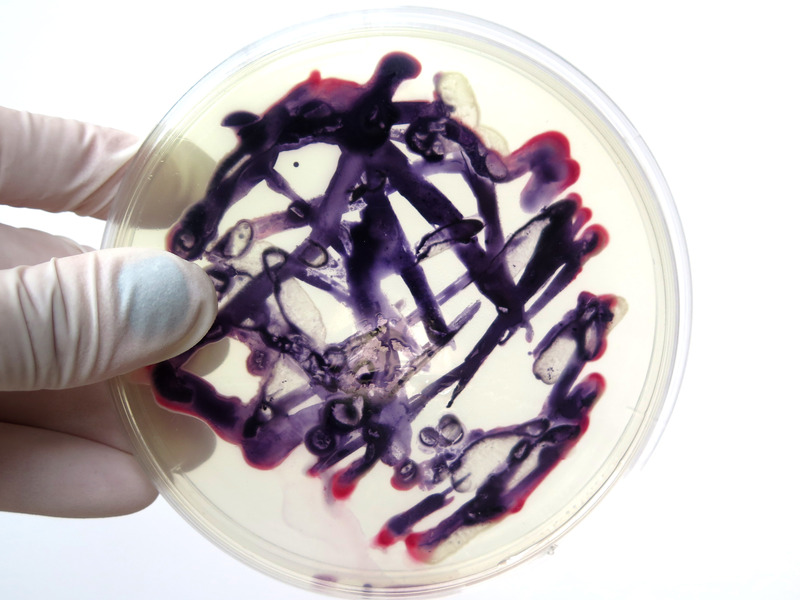 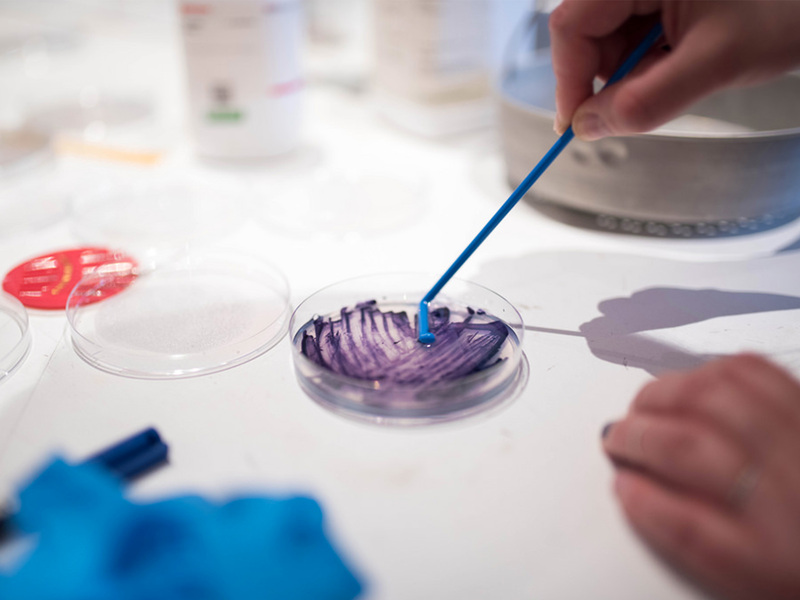 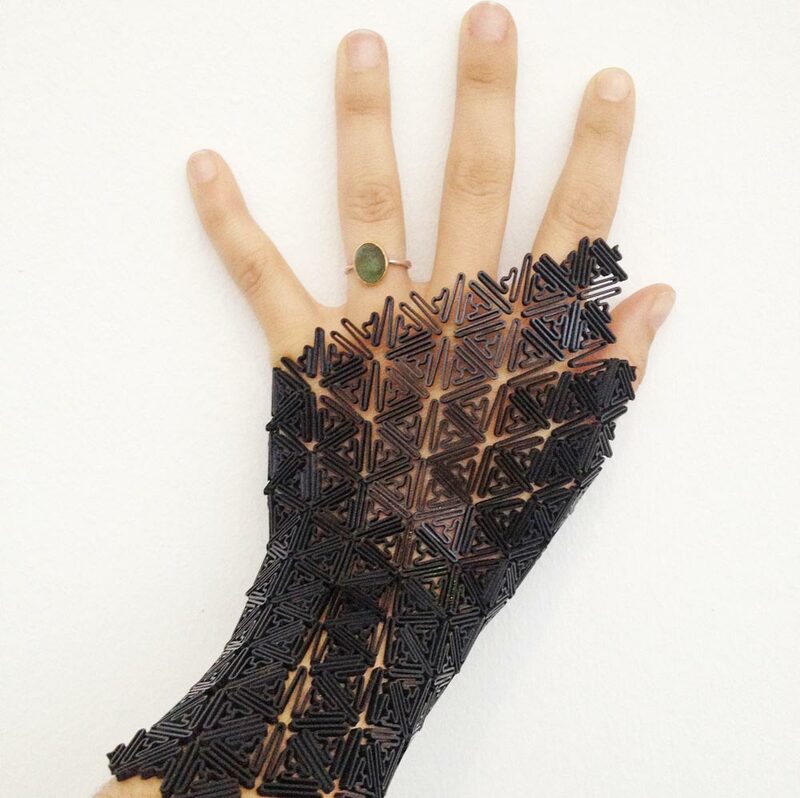 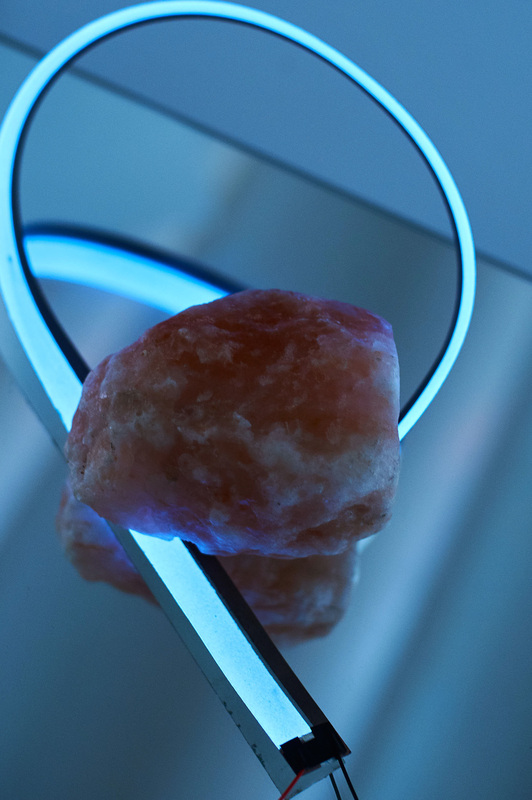 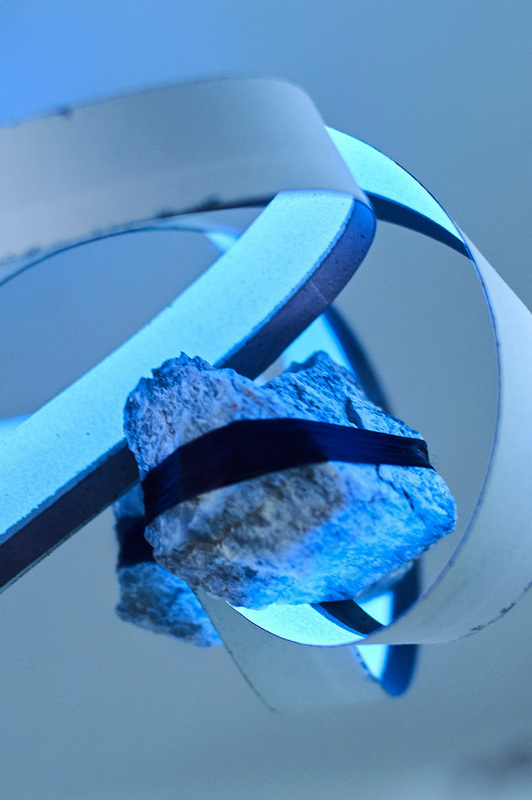 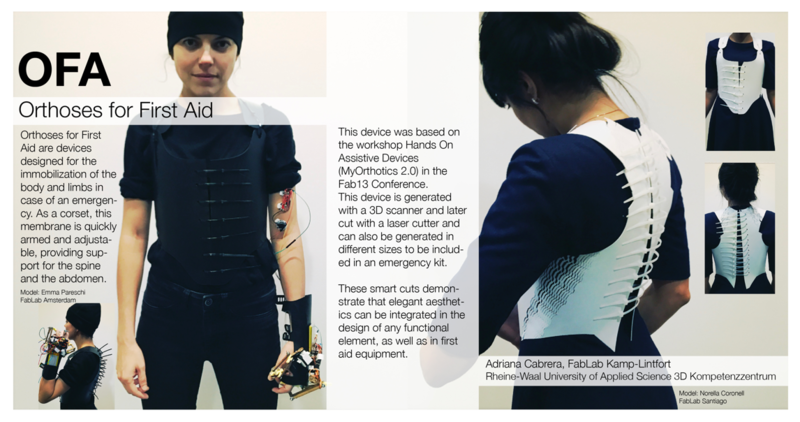 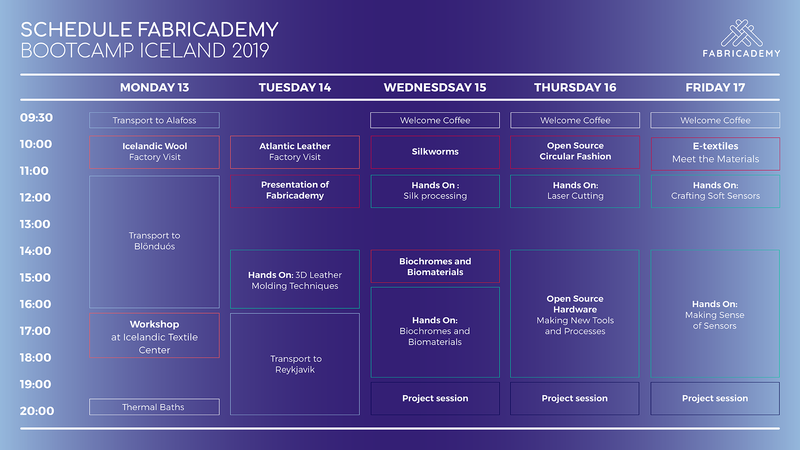 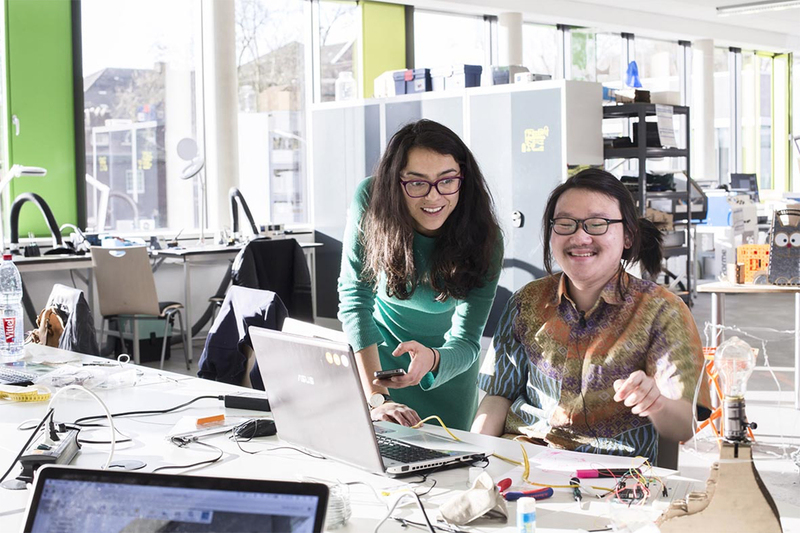 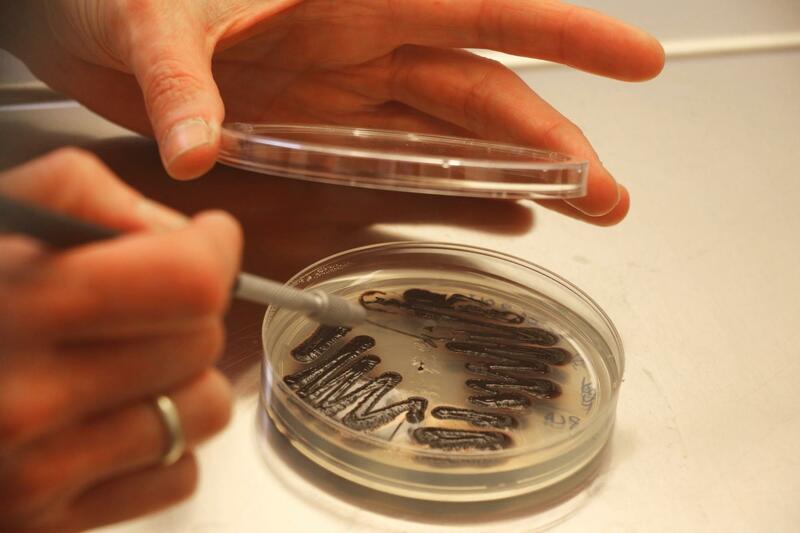 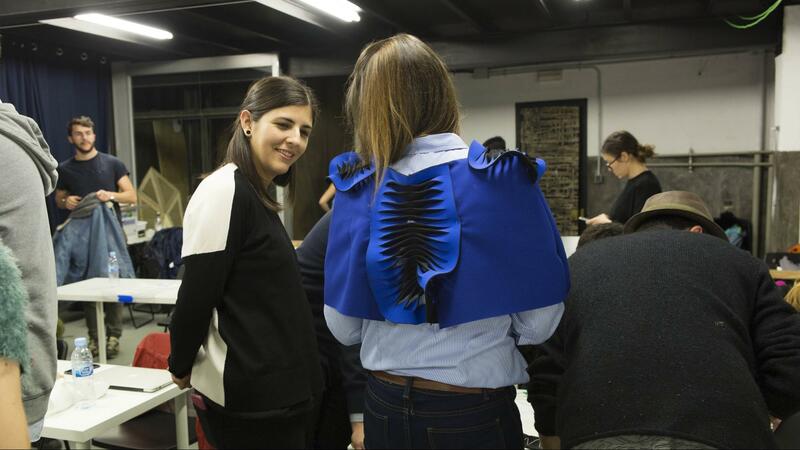 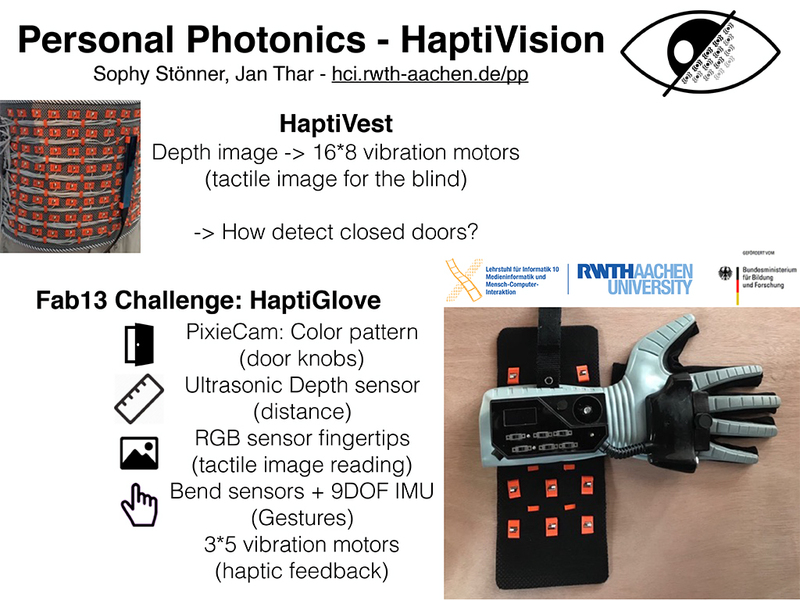 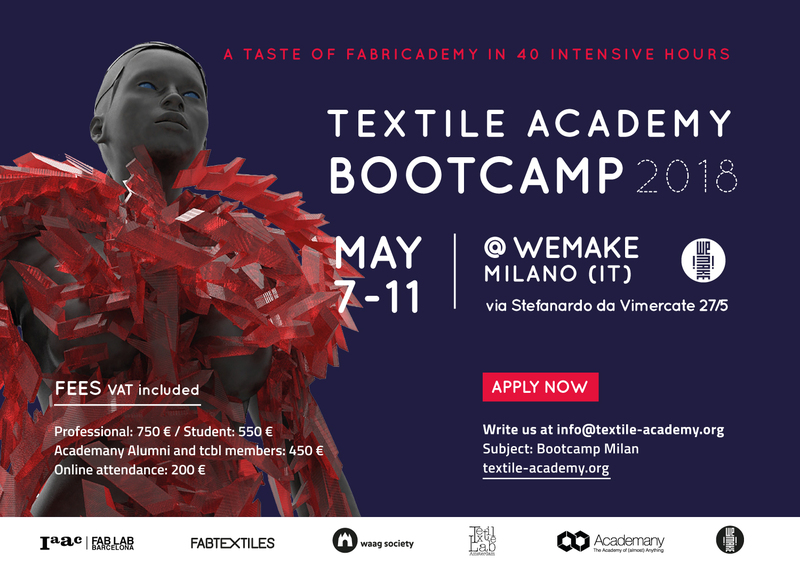 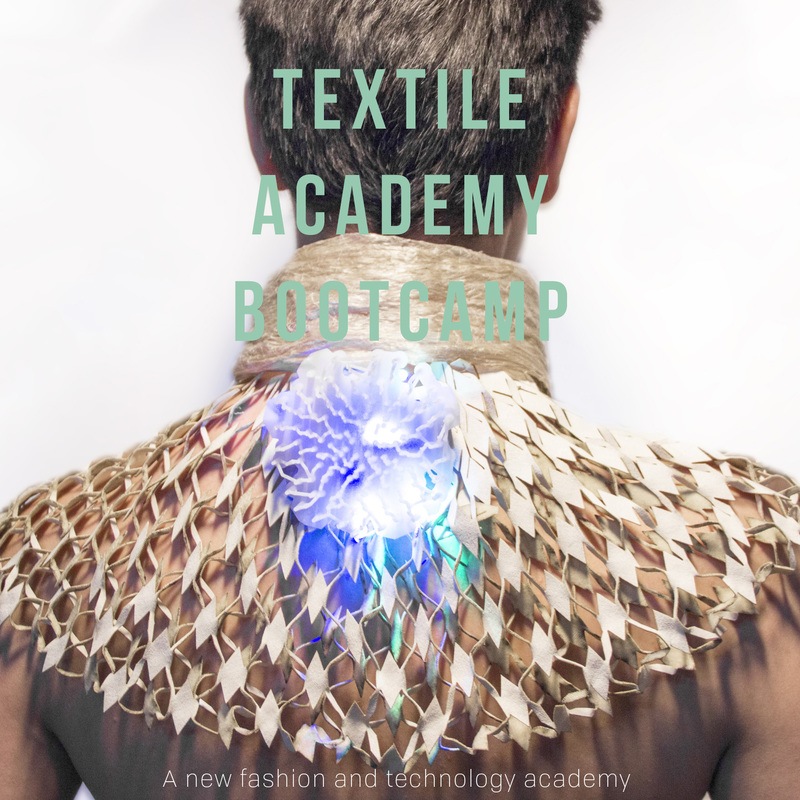 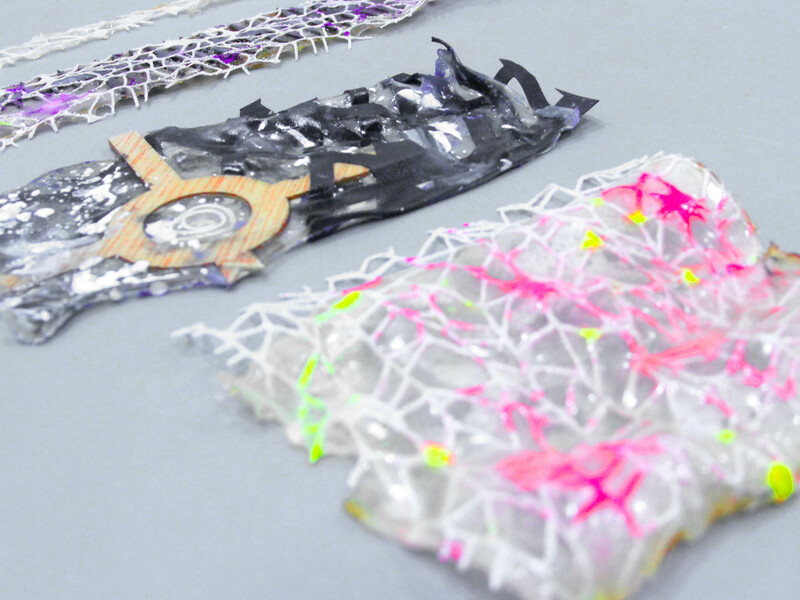 They envision a future of synergies between disciplines, combining textiles, biology, materials, science, digital fabrication and embedded electronics. 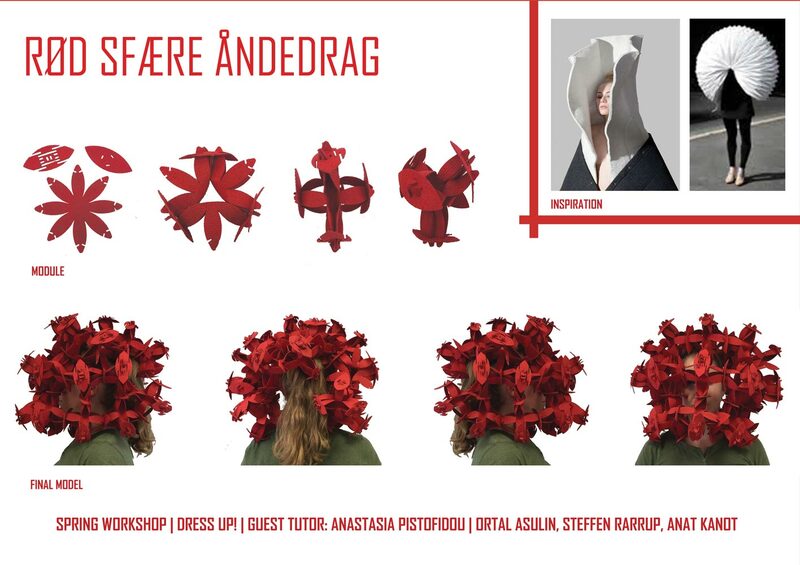 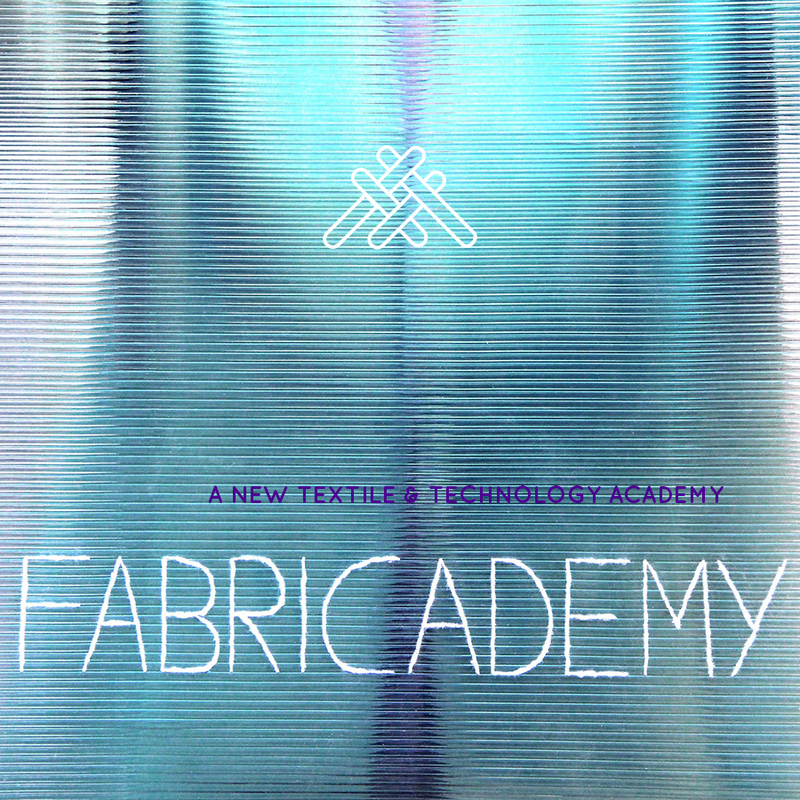 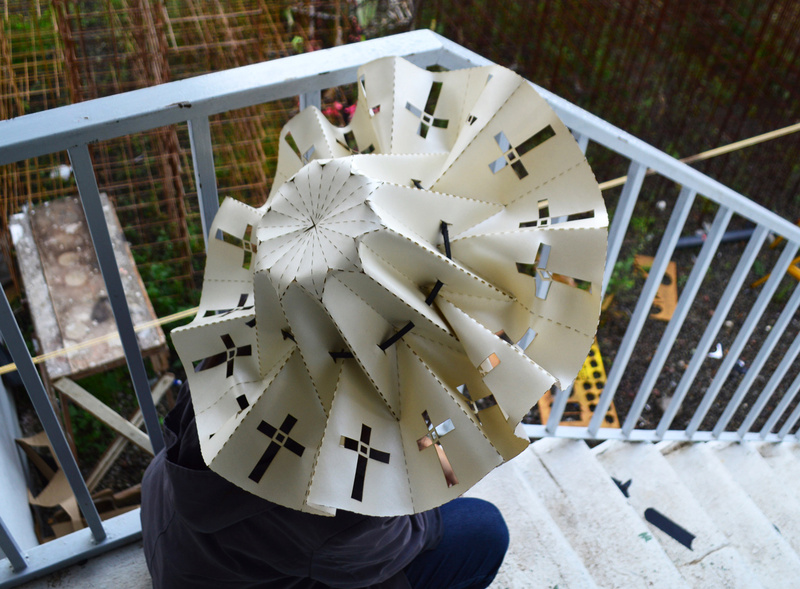 Featured works included projects from Fabricademy labs (Fab Lab Barcelona, Textile Lab Amsterdam, Fab Lab Kamp-Lintfort), final projects of Fabricademy graduated students (Brigitte Kock, Clara Davis, Fanny Trivero, Laura Civetti, Pauline Bianchi, Sofia Guridi Sotomayor, Sophie Akihbi and Wei Chung), and invited artists (Claire Eliot, Elisabeth Jayot and Jeanne Vicerial,) all exhibited on 3d printed mannequins by WASP. 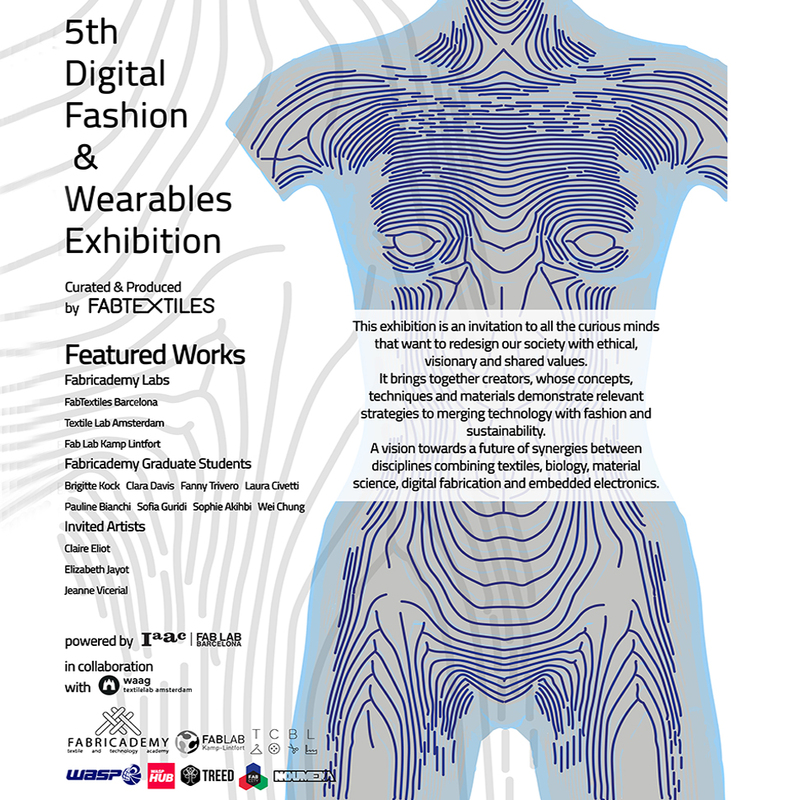 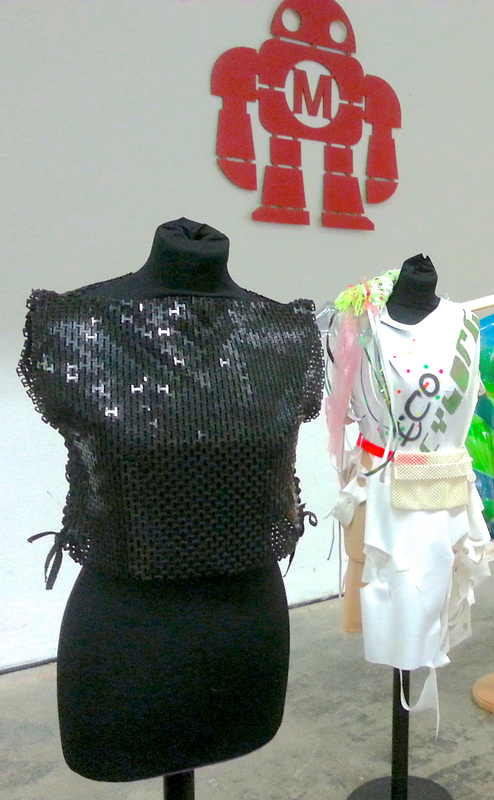 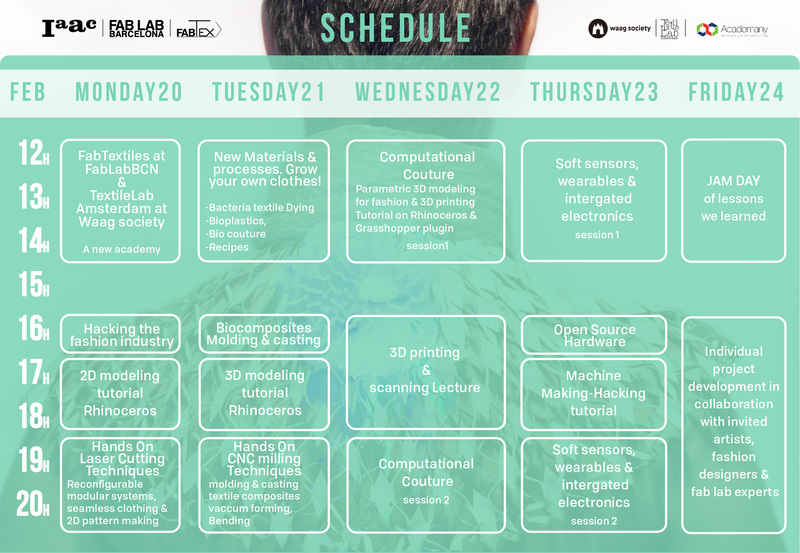 The 5th Digital Fashion & Wearables exhibition continued in Toulouse with other activities, conferences and workshops. 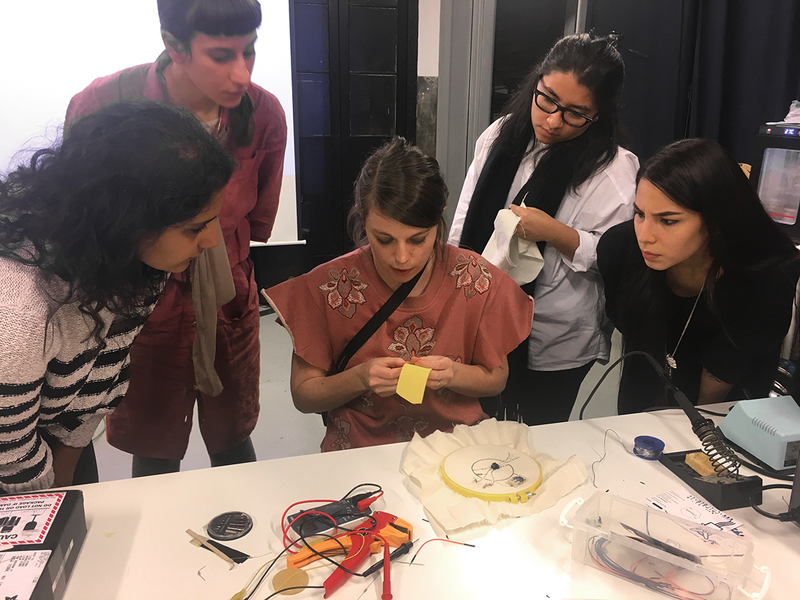 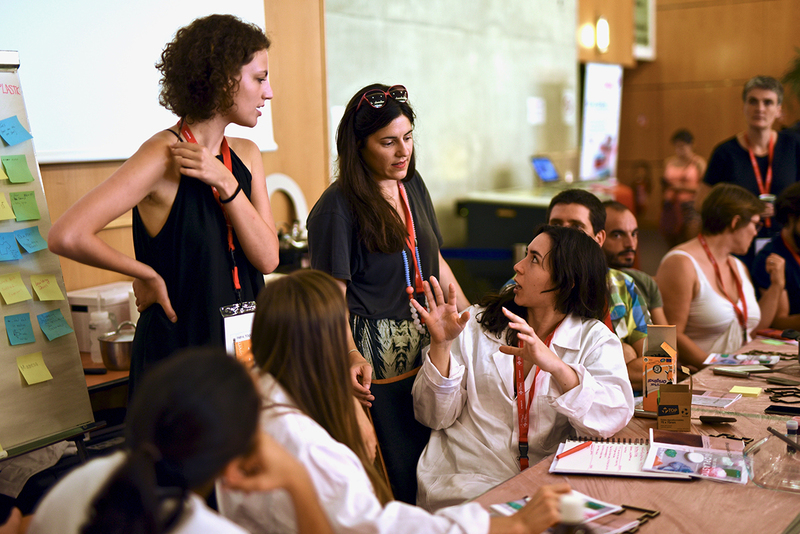 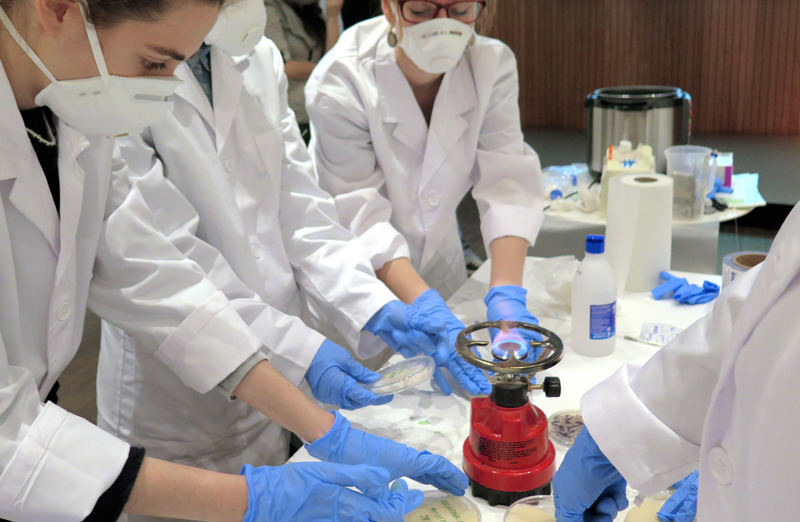 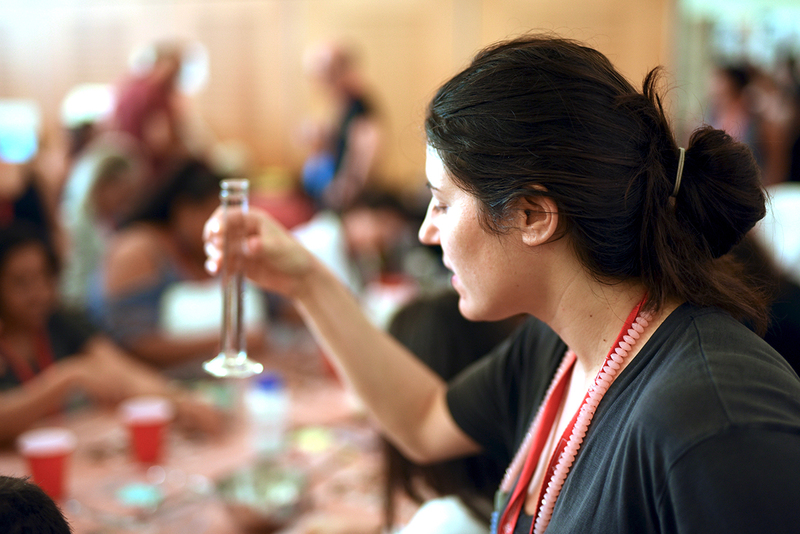 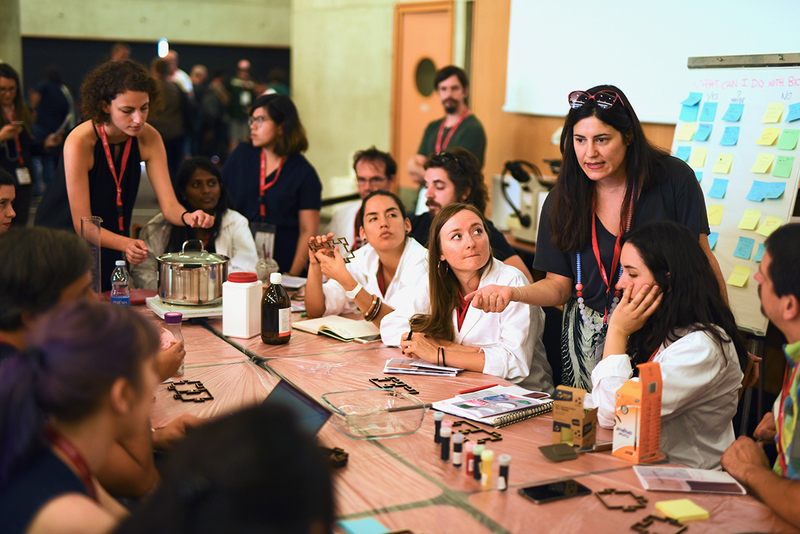 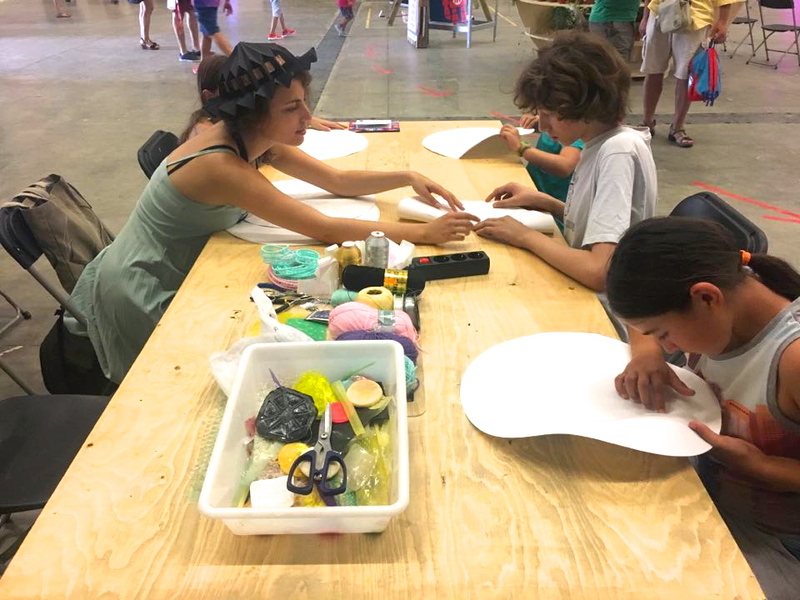 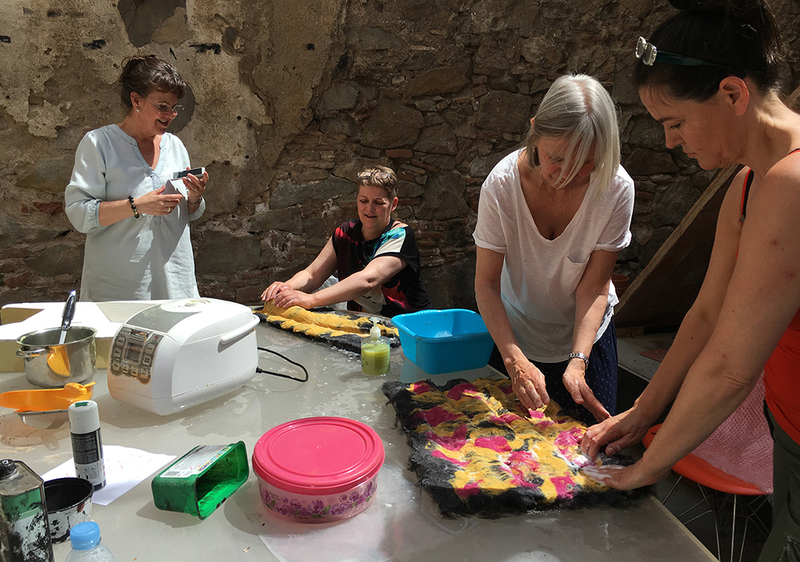 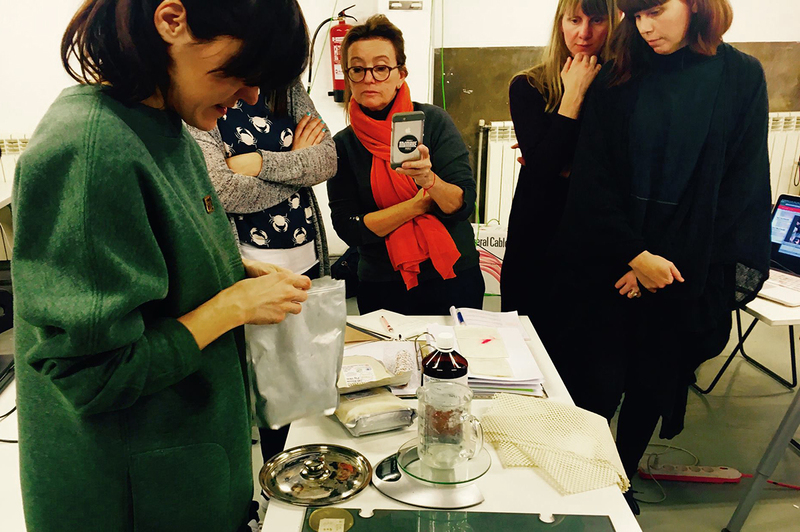 Anastasia Pistofidou and Clara Davis, from the FabTextiles team, gave a workshop on how to make bioplastics, starting with an interactive analysis of the many possibilities of bioplastics in order to inspire participants to think about potential bioplastic design applications. 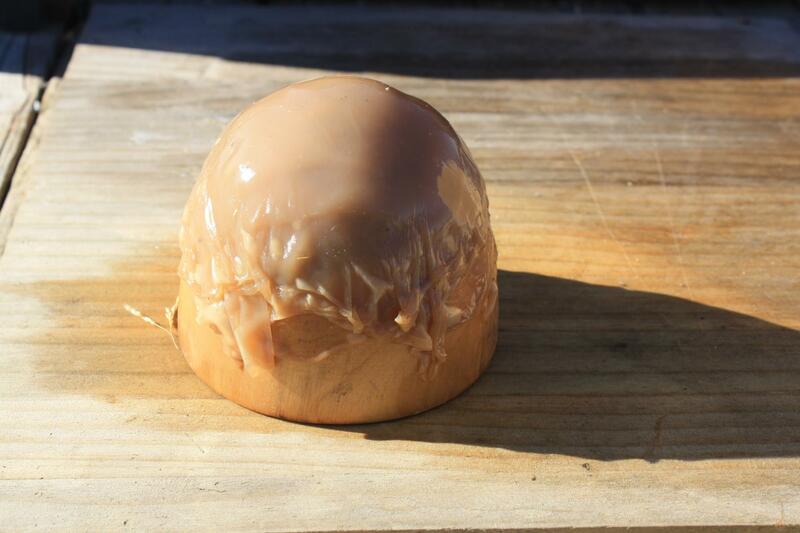 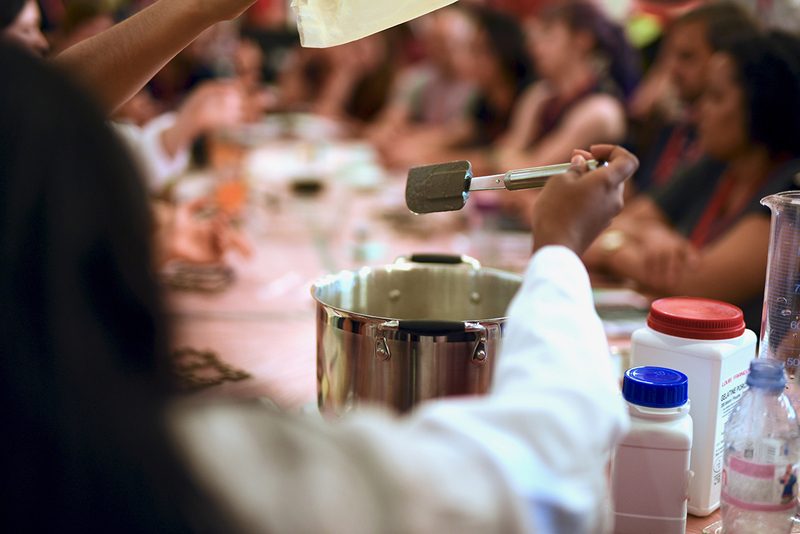 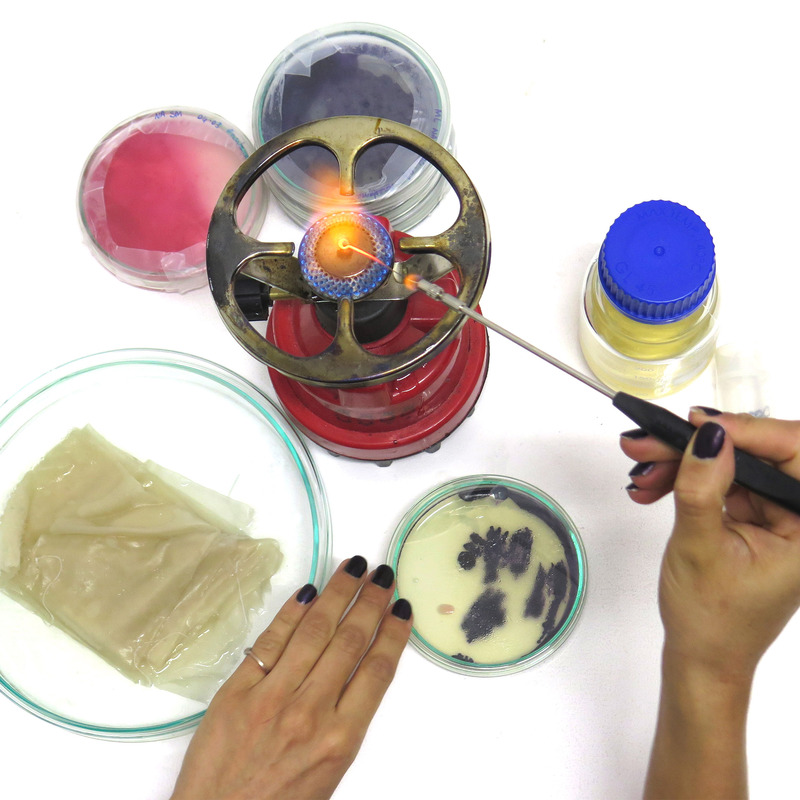 Then participants had the opportunity to play with two bioplastic recipes : gelatine-based and agar-based. 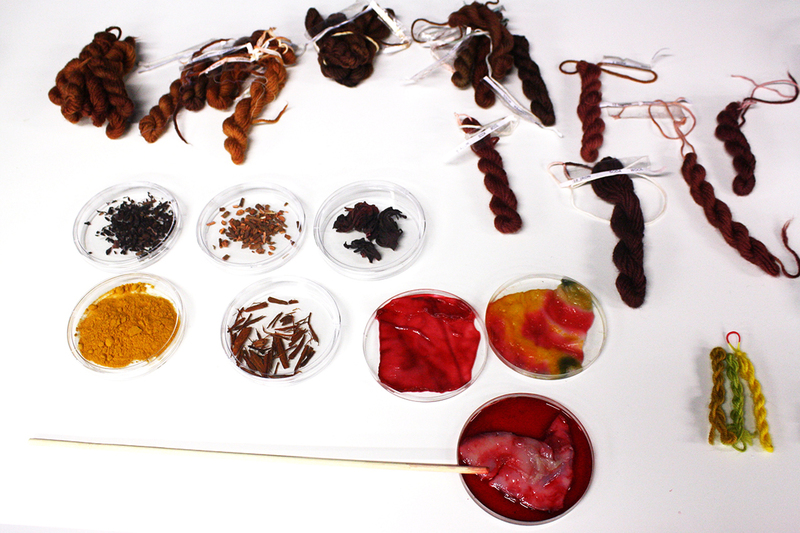 Several additives were available for the participants like natural color pigments, food waste, fibers. 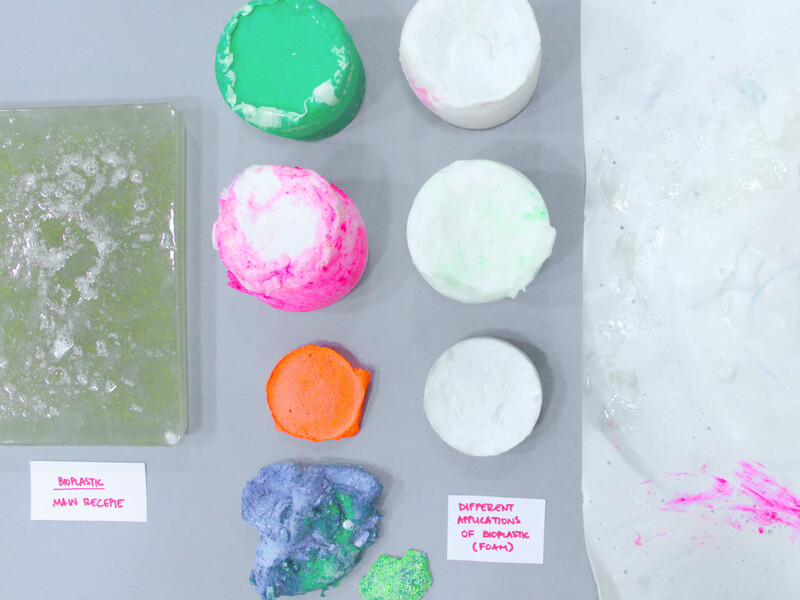 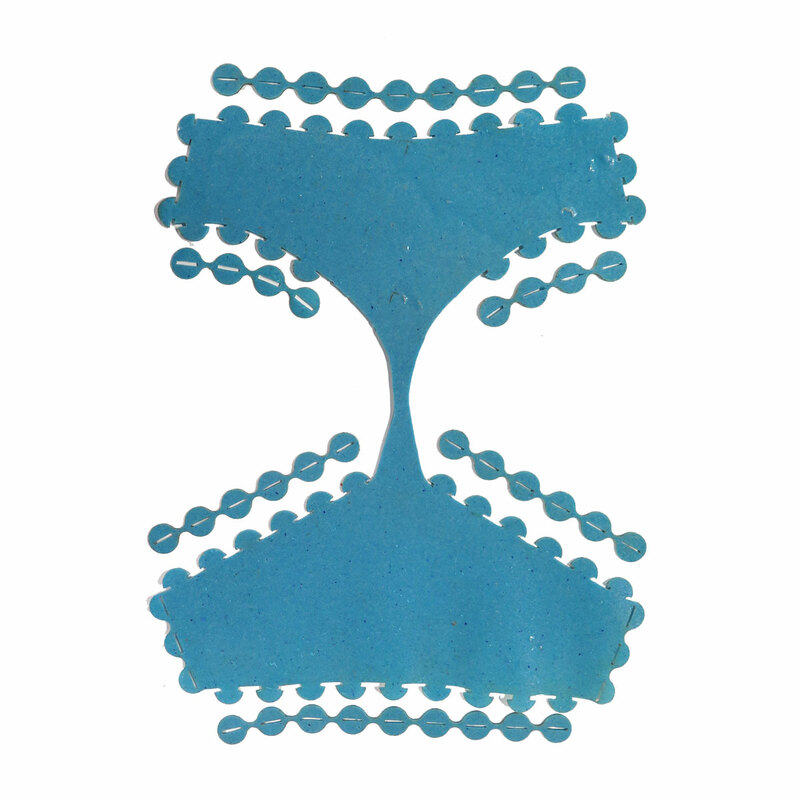 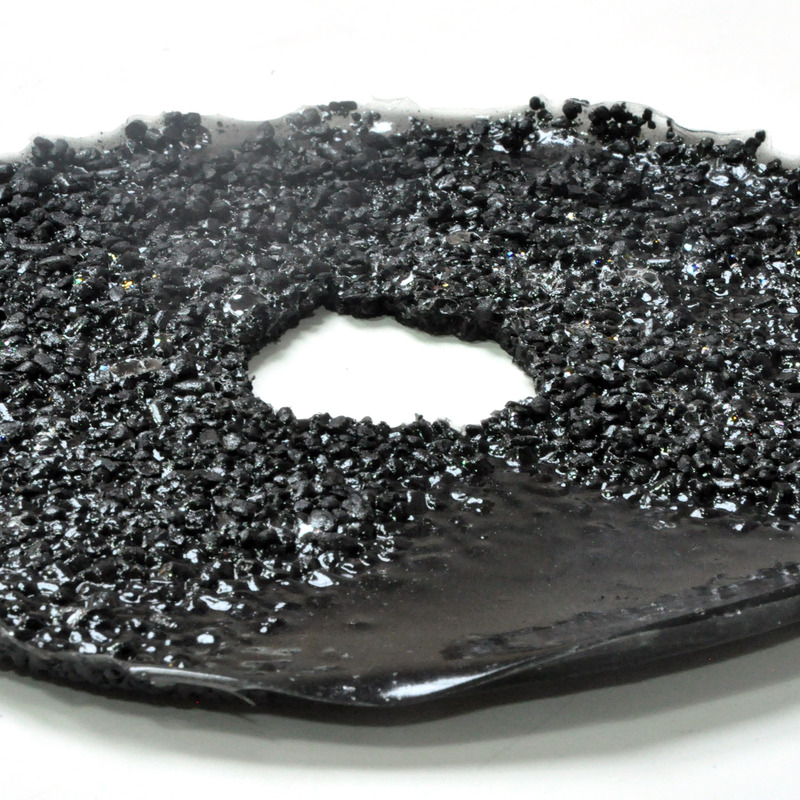 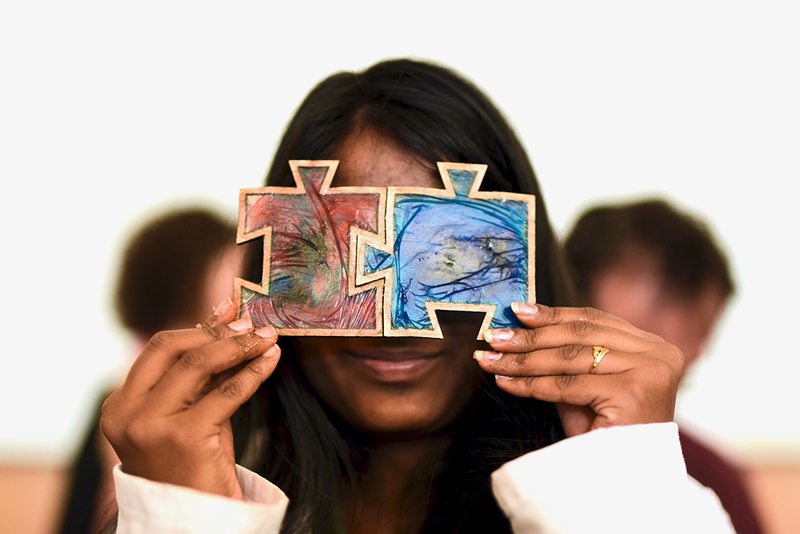 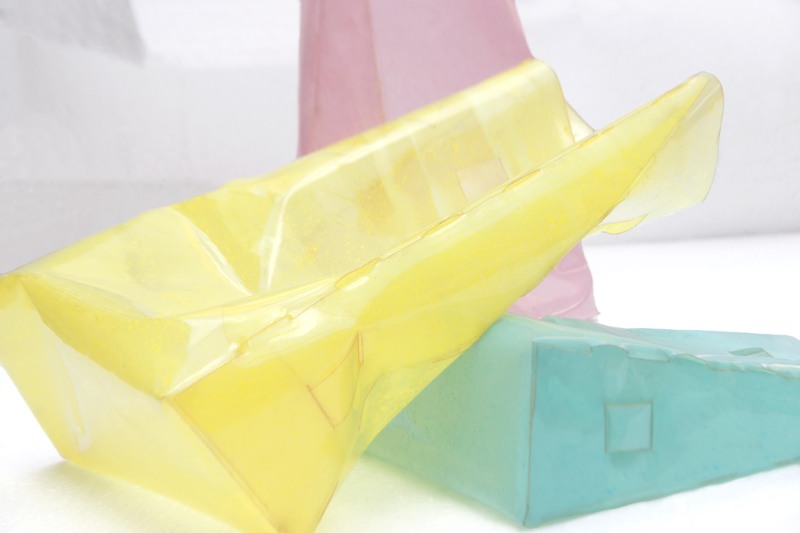 Each piece of bioplastic was cast inside a puzzle mold, which, by the end of the workshop, formed a collective experimental bioplastic pattern. 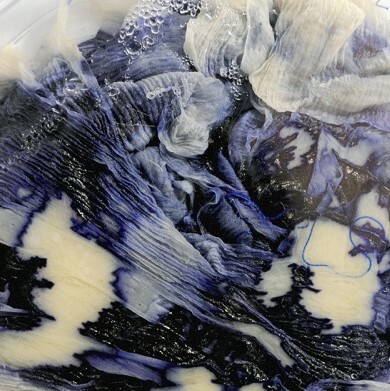 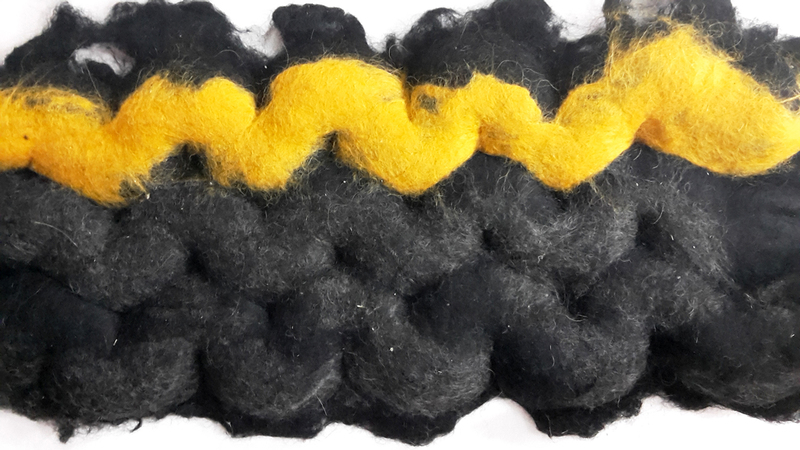 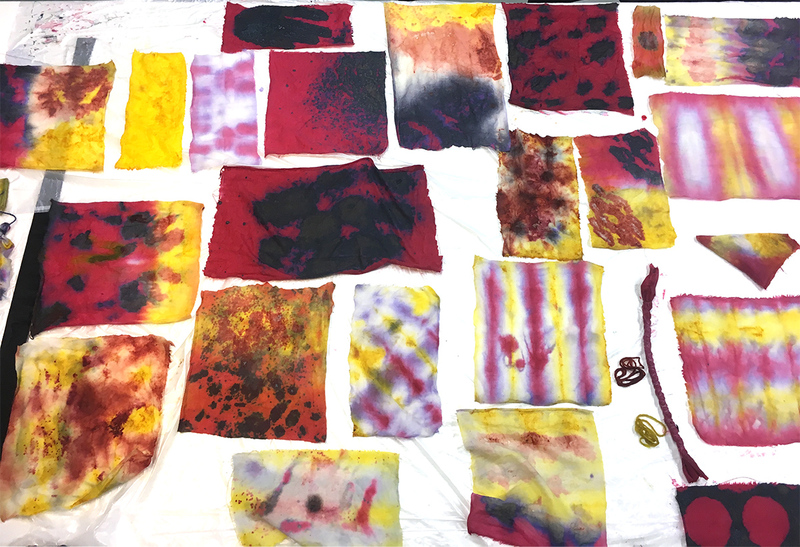 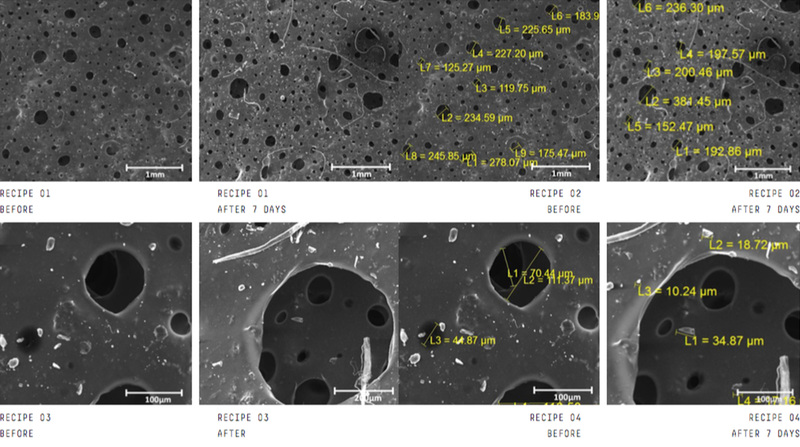 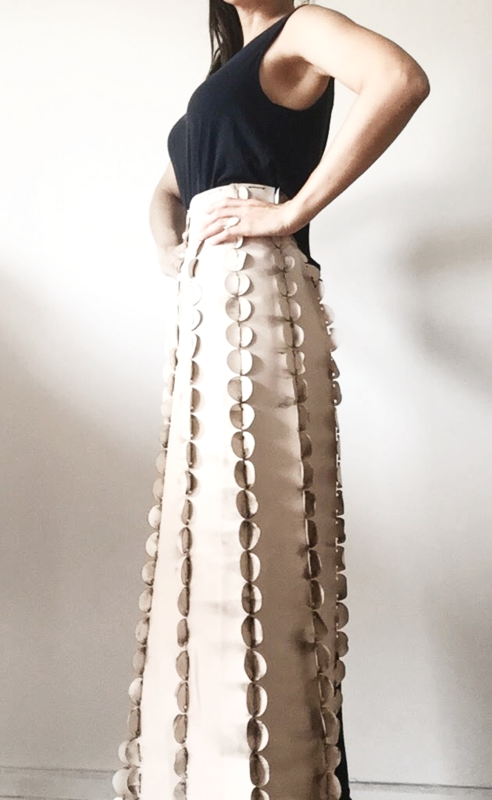 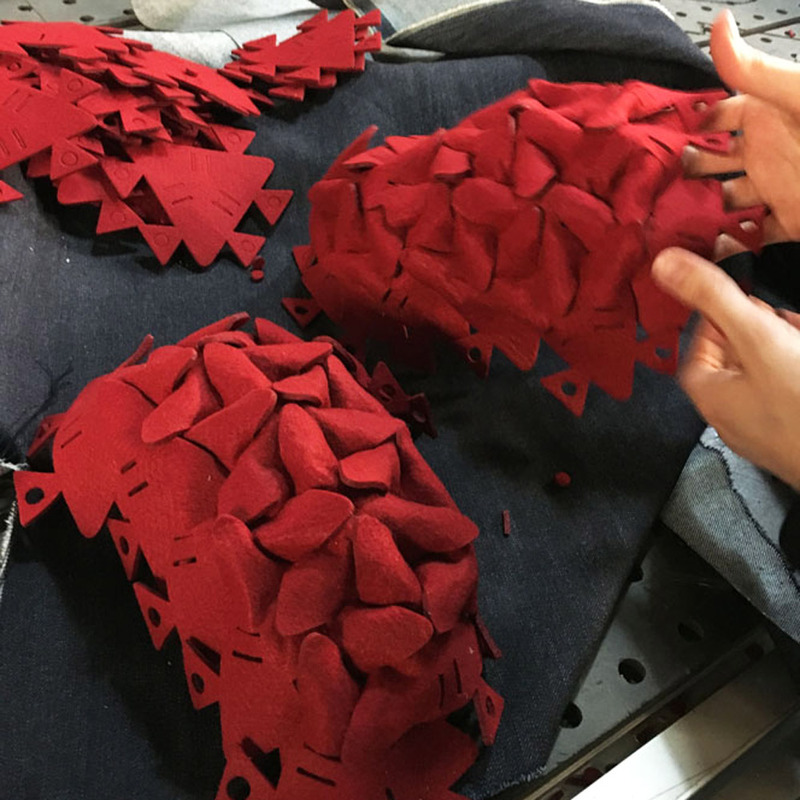 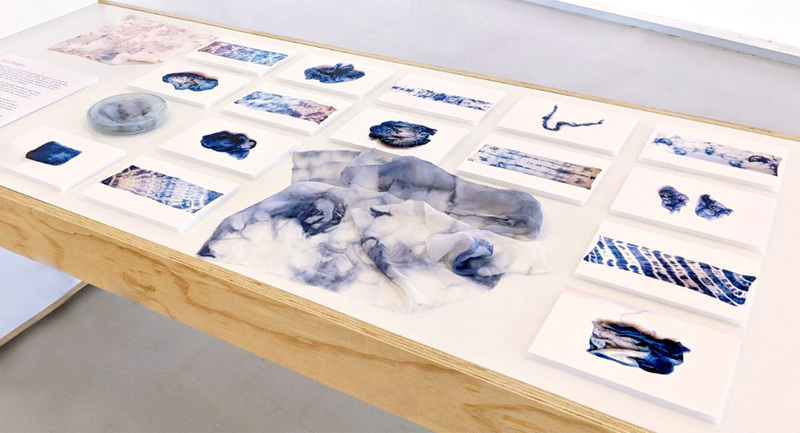 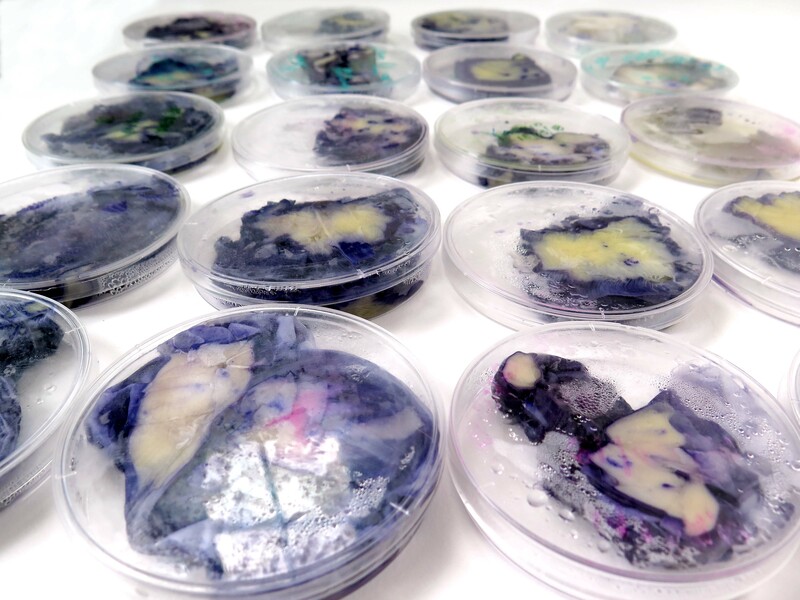 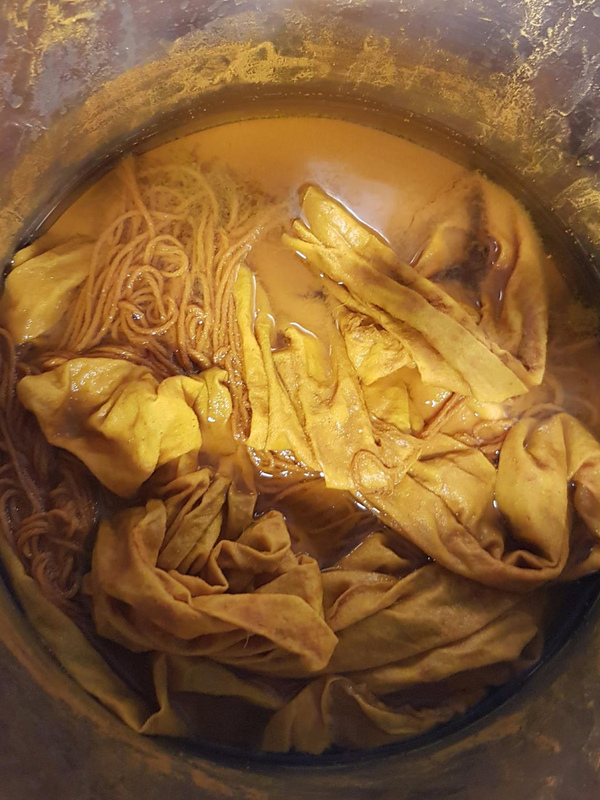 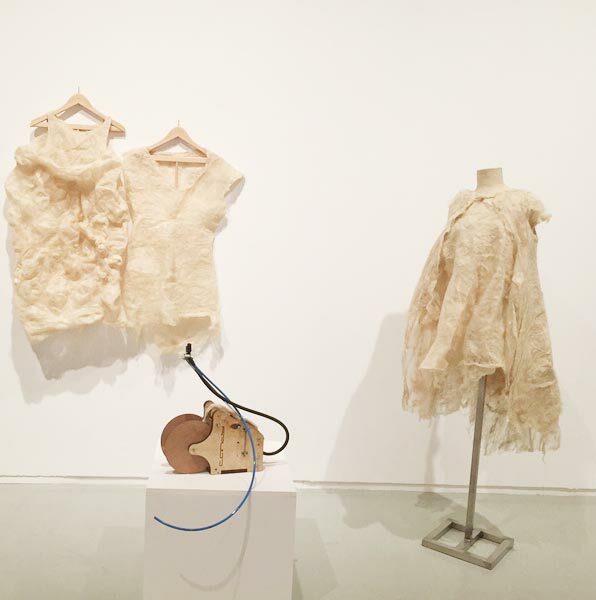 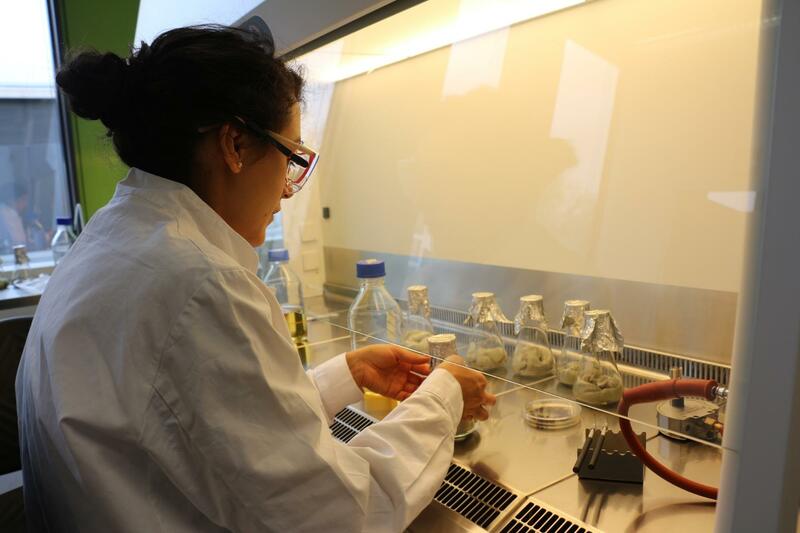 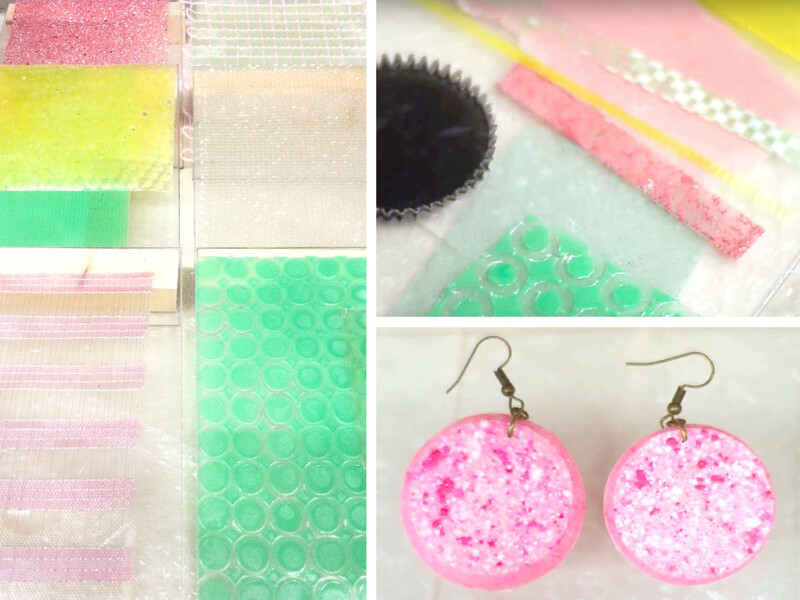 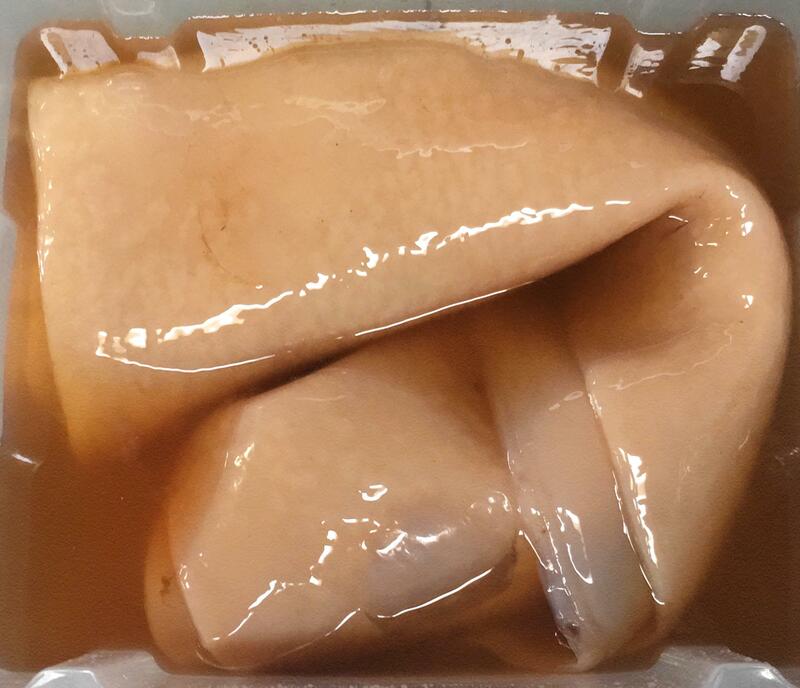 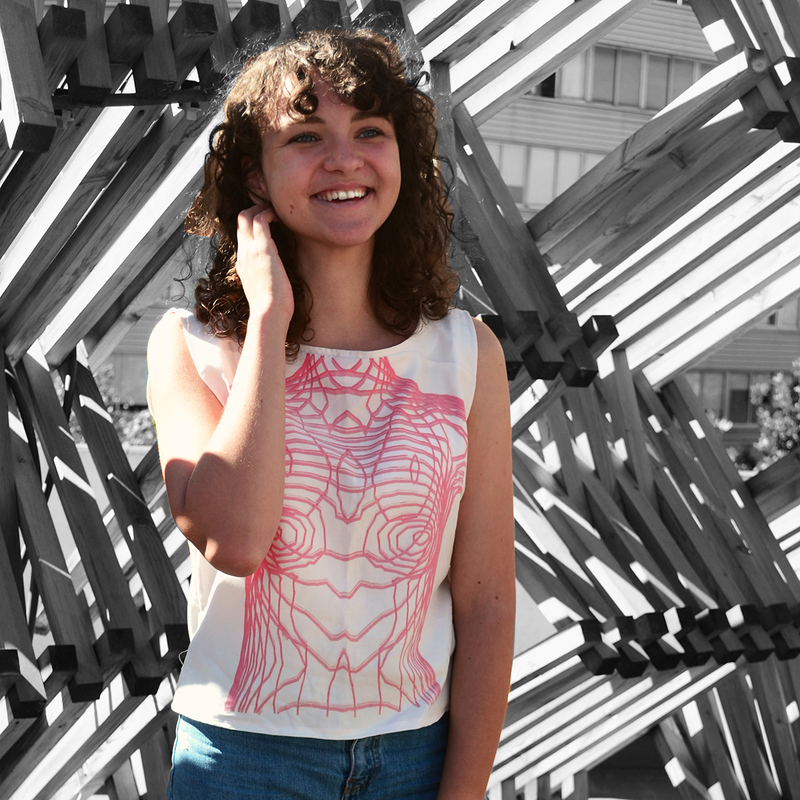 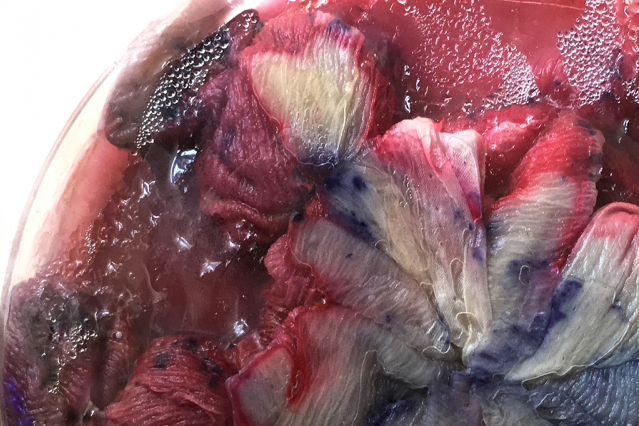 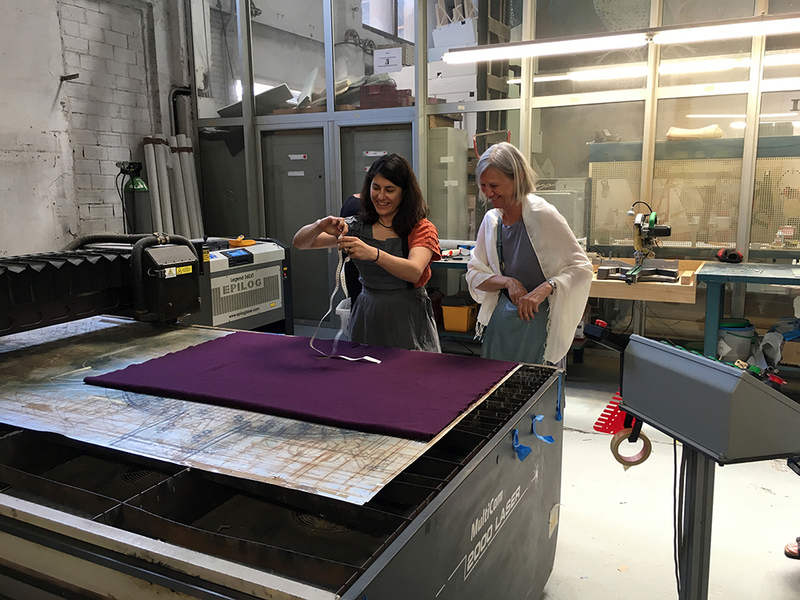 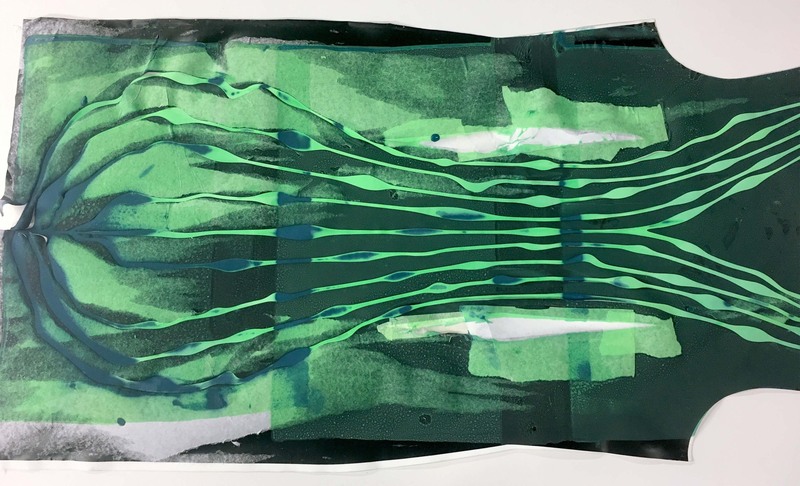 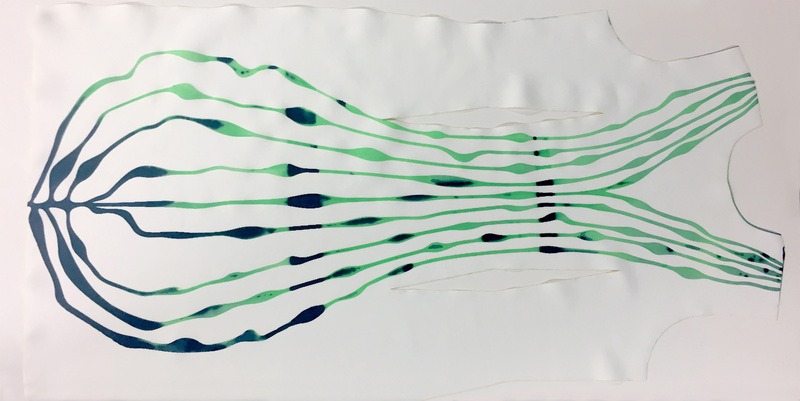 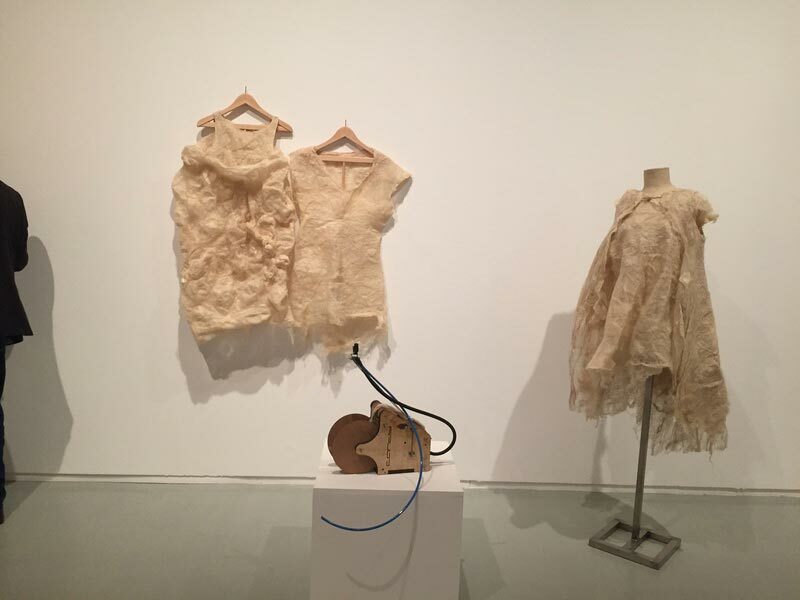 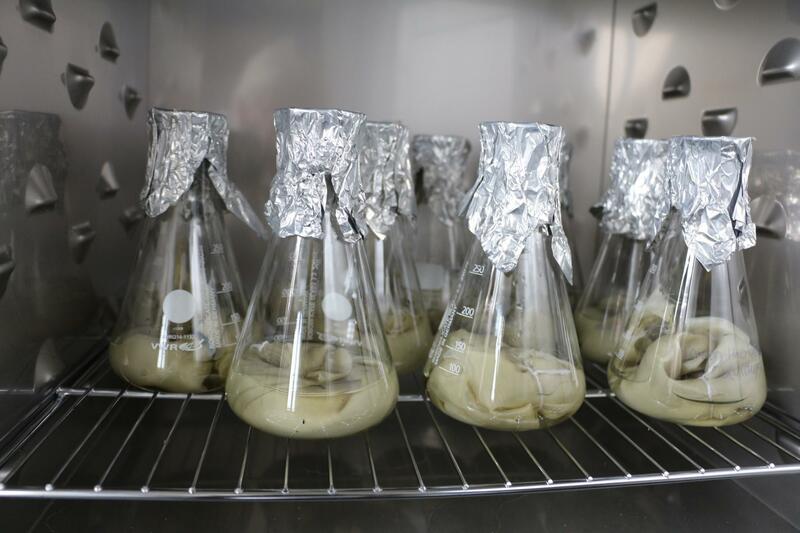 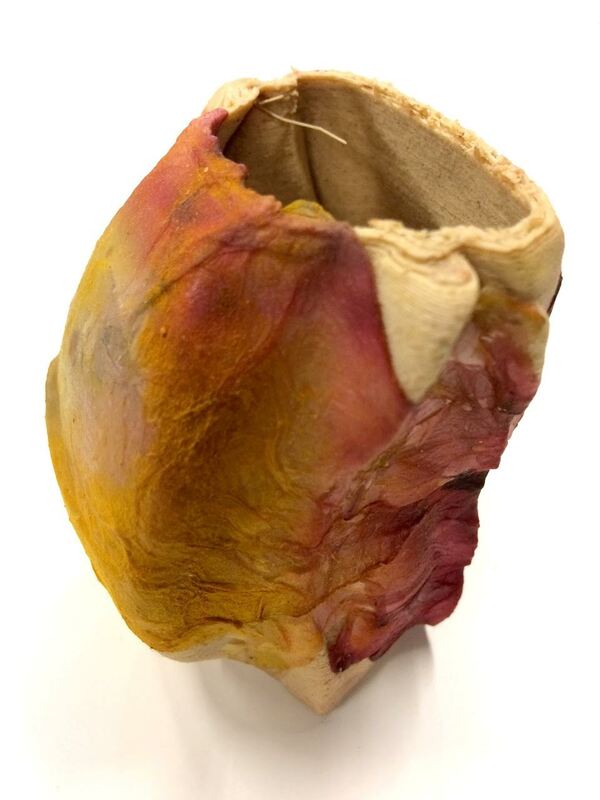 During her two month internship at FabTextiles and Materials lab, Margaret Dunne, a fiber scientist researcher studying at the College of Human Ecology at Cornell University, contributed to the research and development bioplastic experimentation. 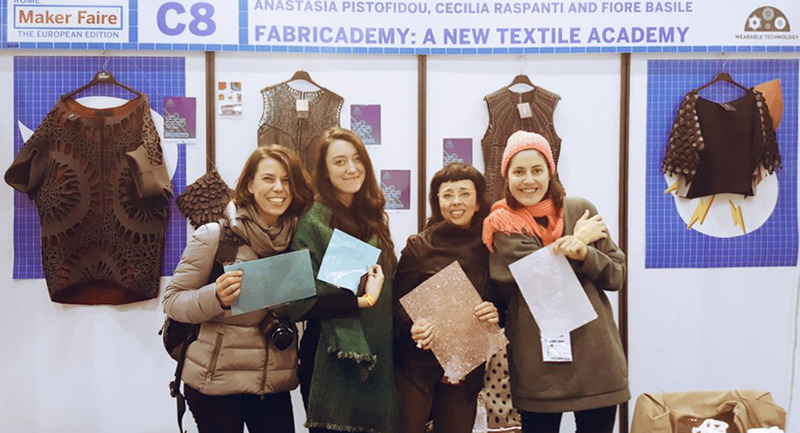 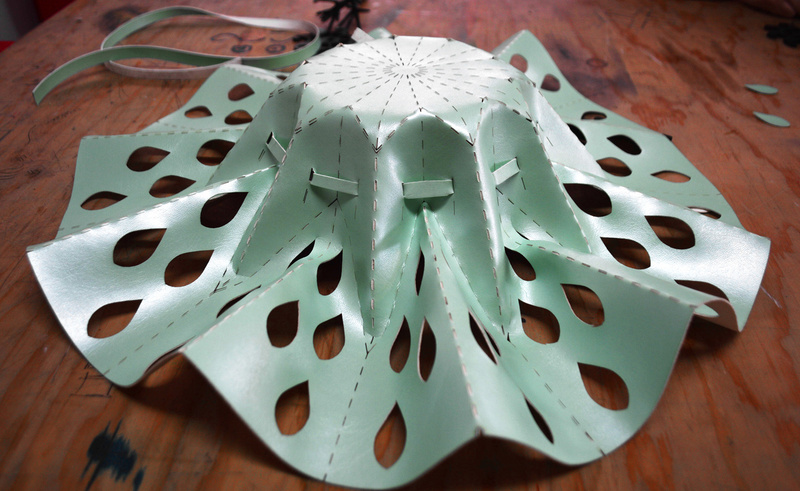 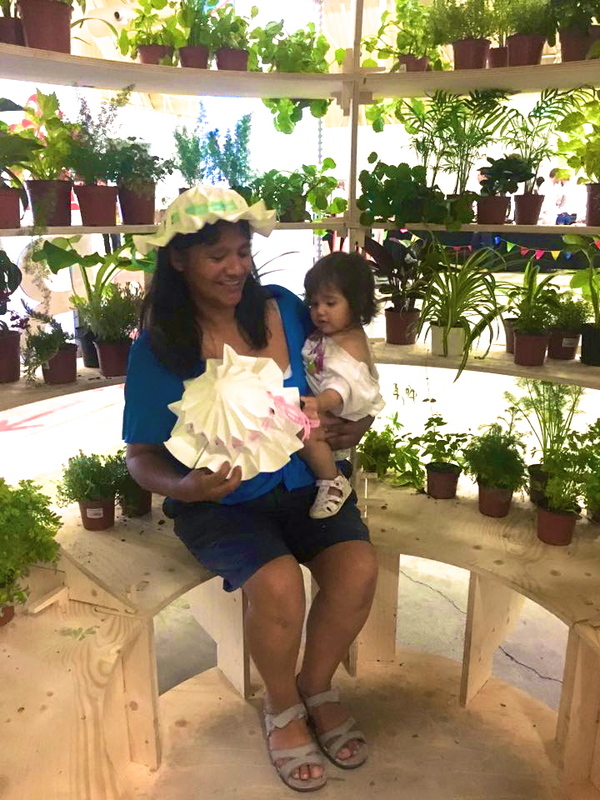 Her task during the internship was to master Bioplastic recipes, experiment and amplify the materials catalogue and publish the second open source book of FabTextiles lab called The Bioplastic Cook Book. 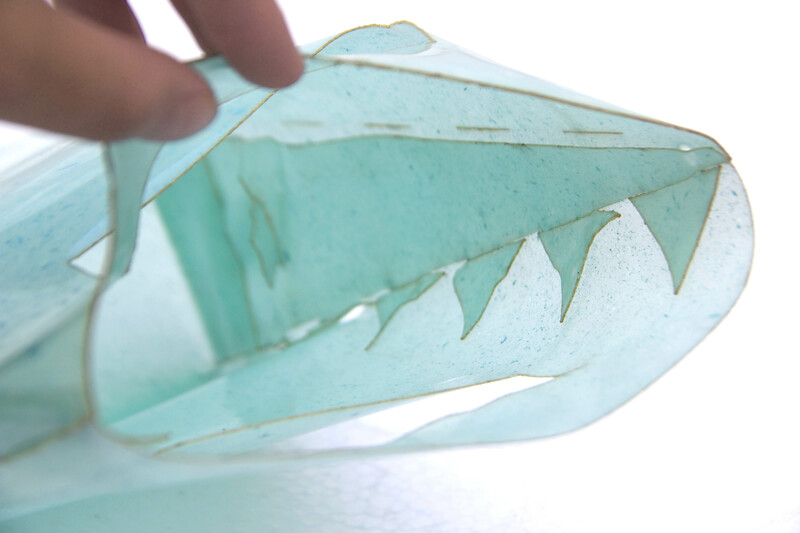 After The Secret of Bioplastics, written by Clara Davis in 2017, which explained the history of bioplastics, The Bioplastic Cook Book focuses on recipes for making bioplastics. 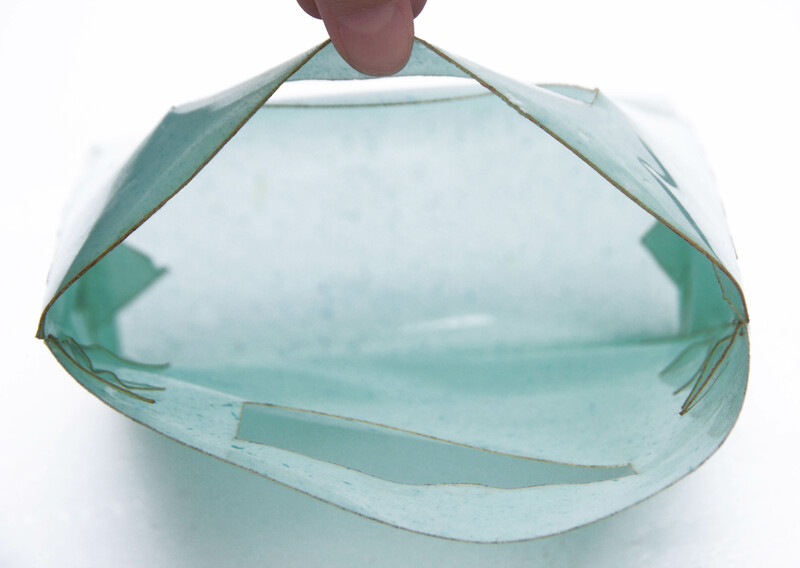 You can find precise instructions for making gelatine, agar-agar and corn-starch-based bioplastics. 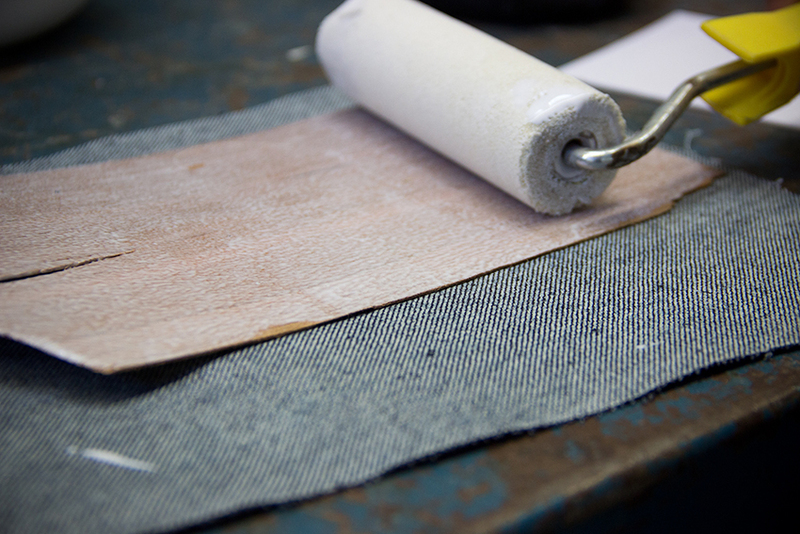 Dunne also offers bio-composite recipes using clay, burlap and hemp. 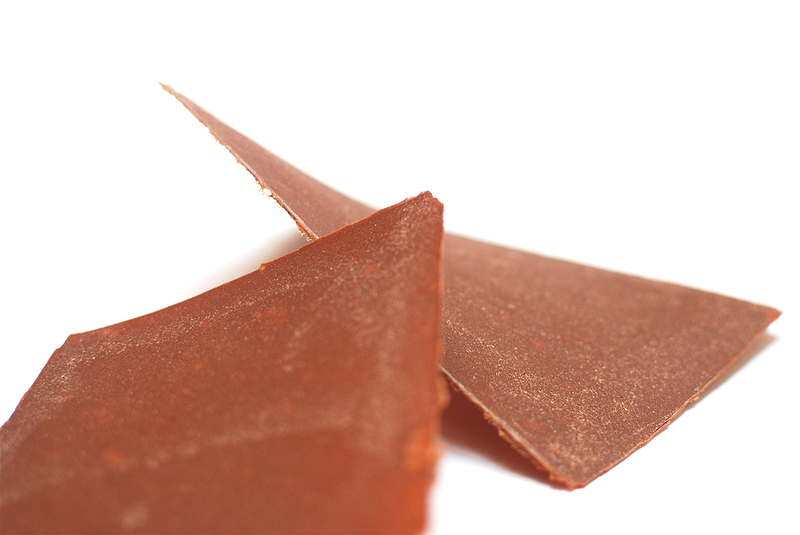 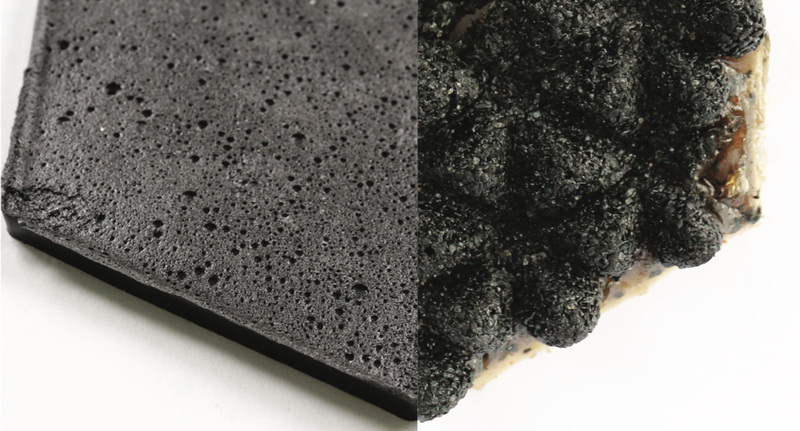 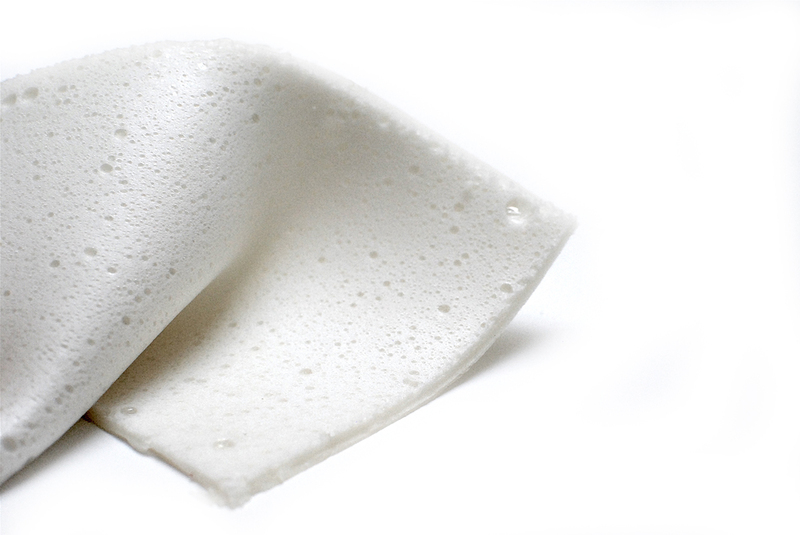 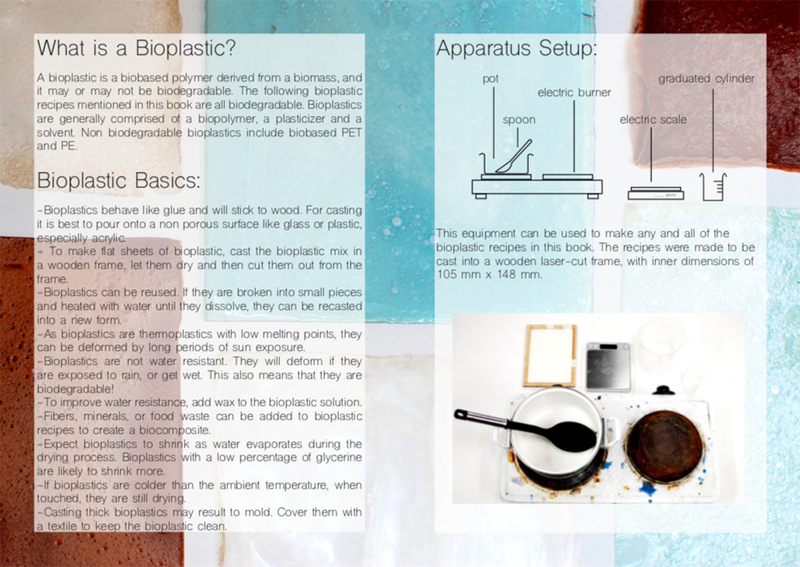 In the Bioplastic Cook Book every single ingredient is biodegradable. 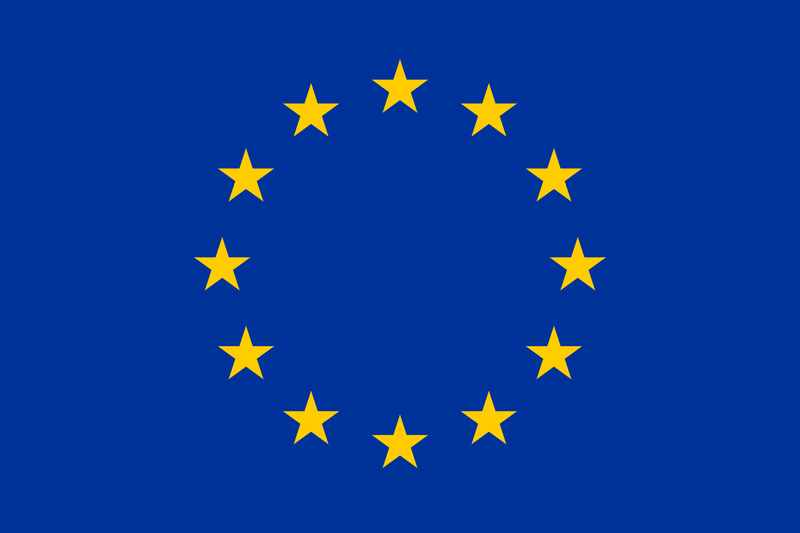 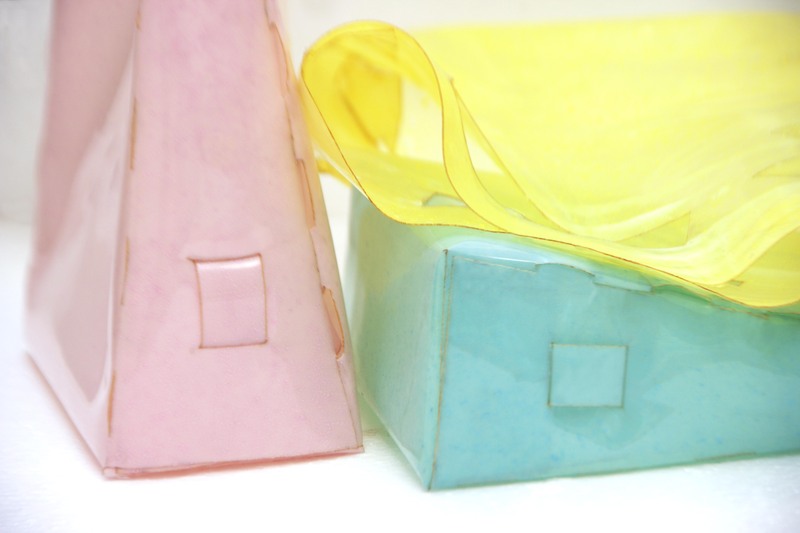 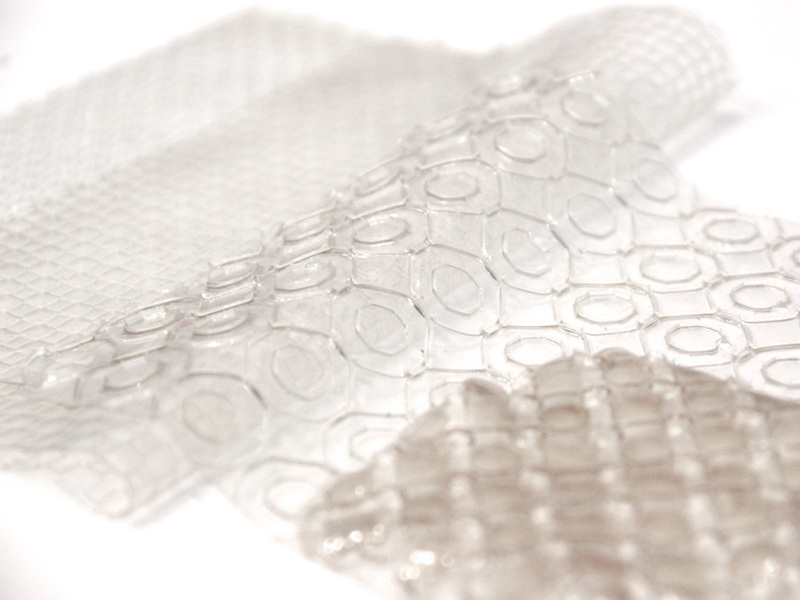 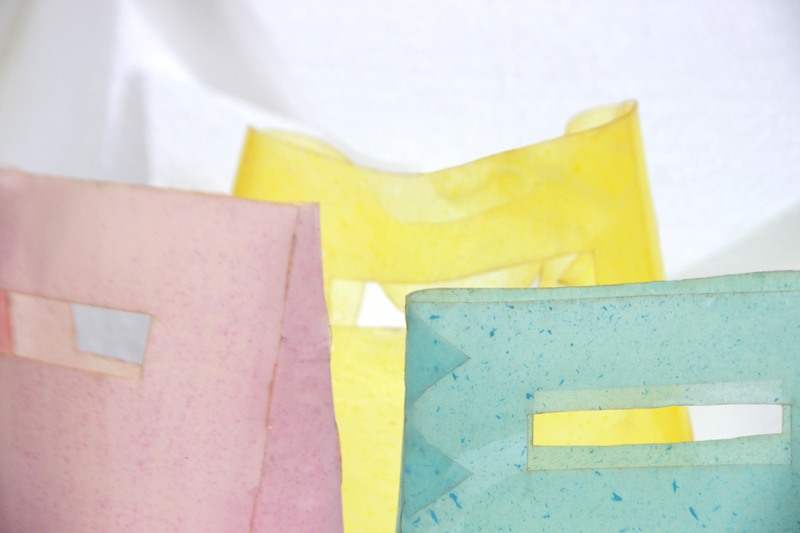 They are made with biopolymers, plasticizers, solvents, and sometimes an additional, additive. 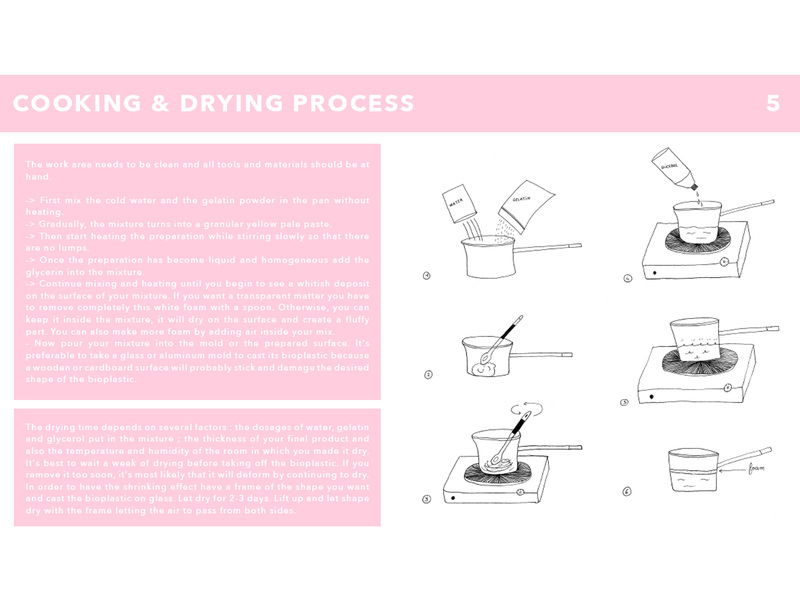 The book opens with the indispensible basics anybody with a passing interest ought to know, required reading before any attempt to make bioplastic. 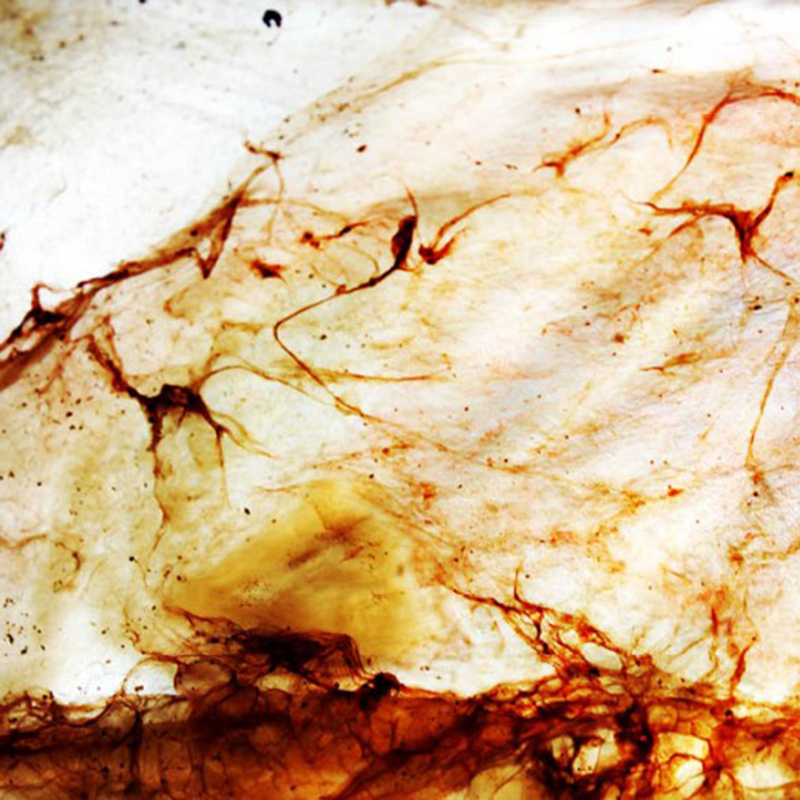 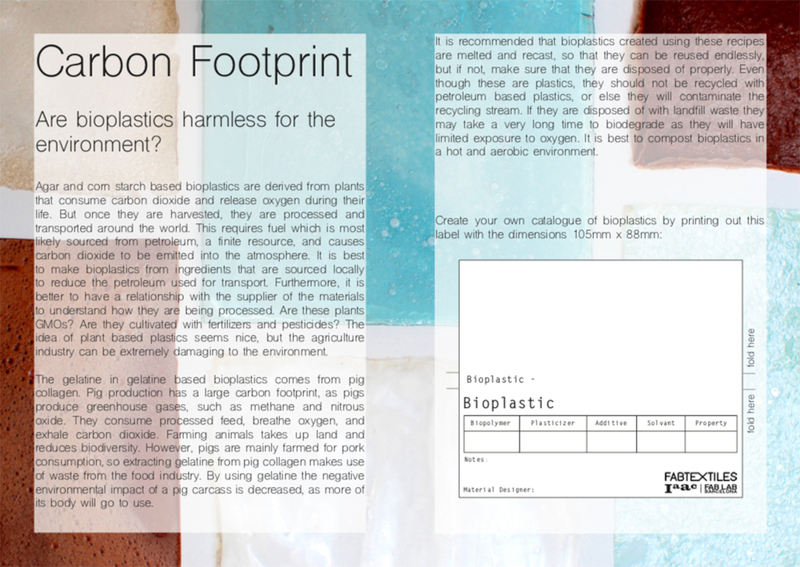 At the end, a question is posed : are bioplastics harmless to the environment ? 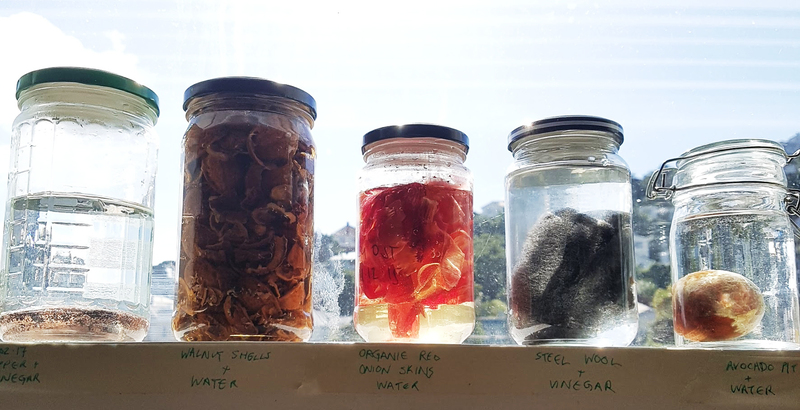 Margaret Dunne atteimpts to address this problem, exploring the carbon footprint that results from bioplastics. 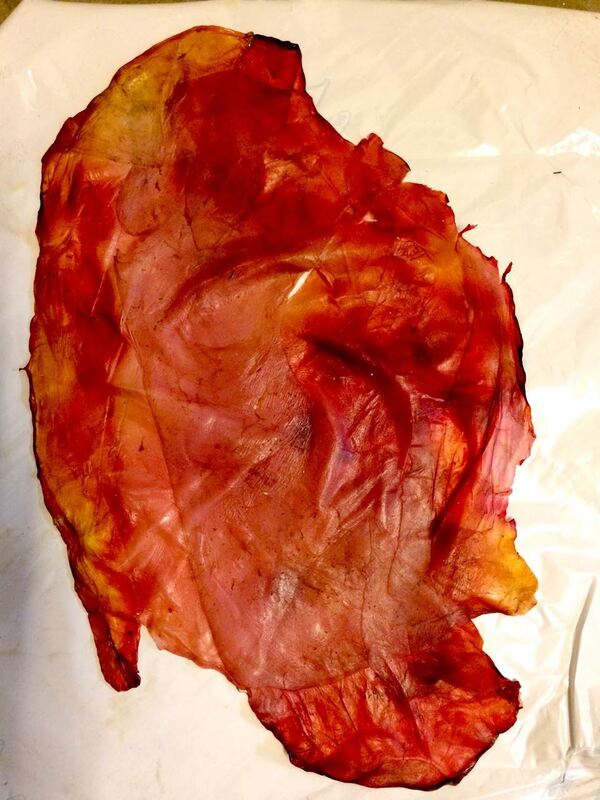 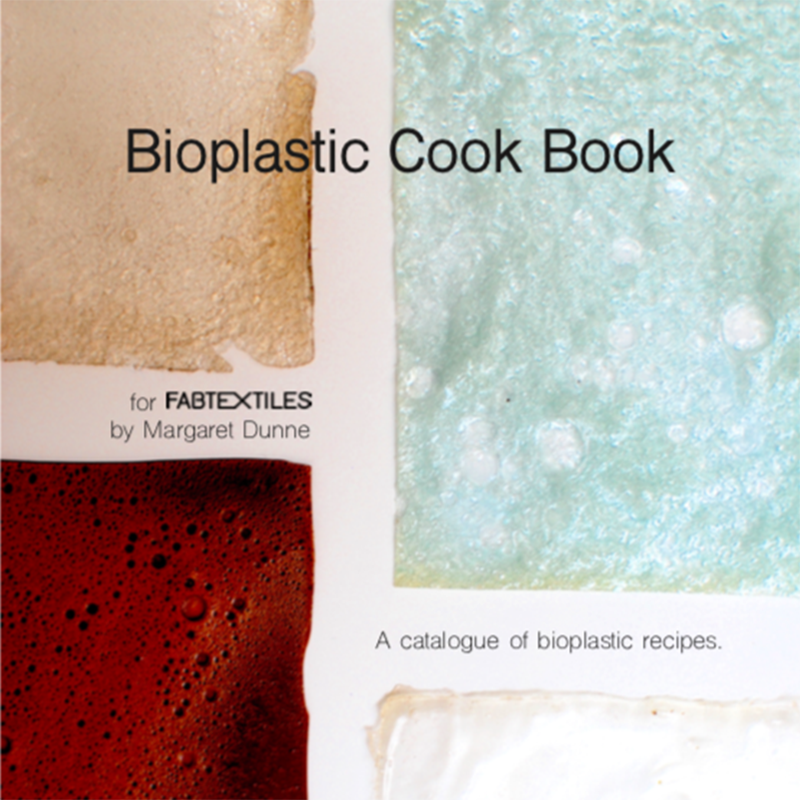 There is a link to the Bioplastic Cook Book at the end of this post. 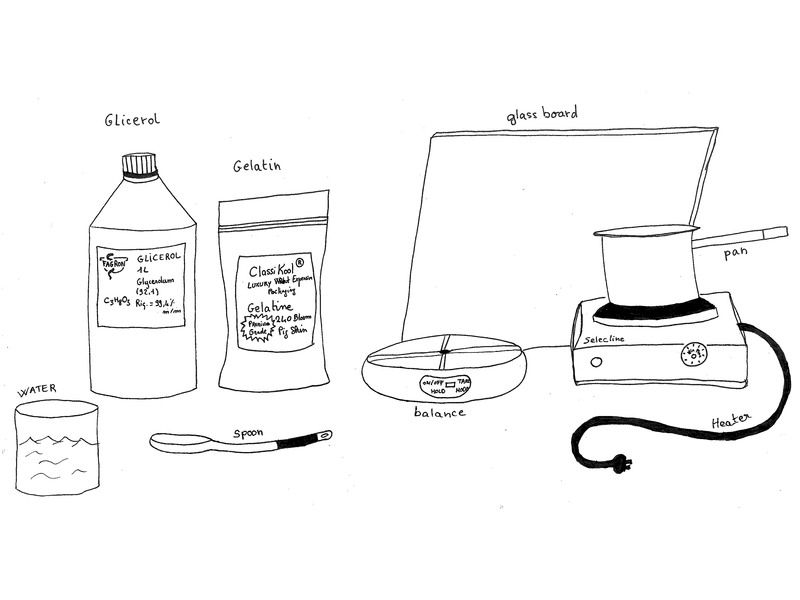 Below, some pictures of Margarette Dunne’s experiments. 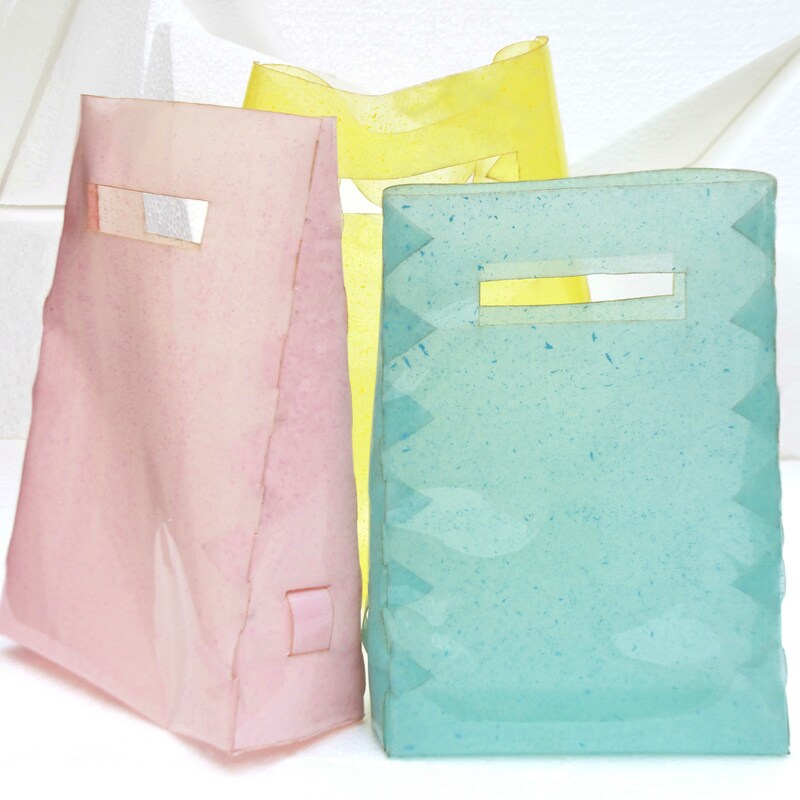 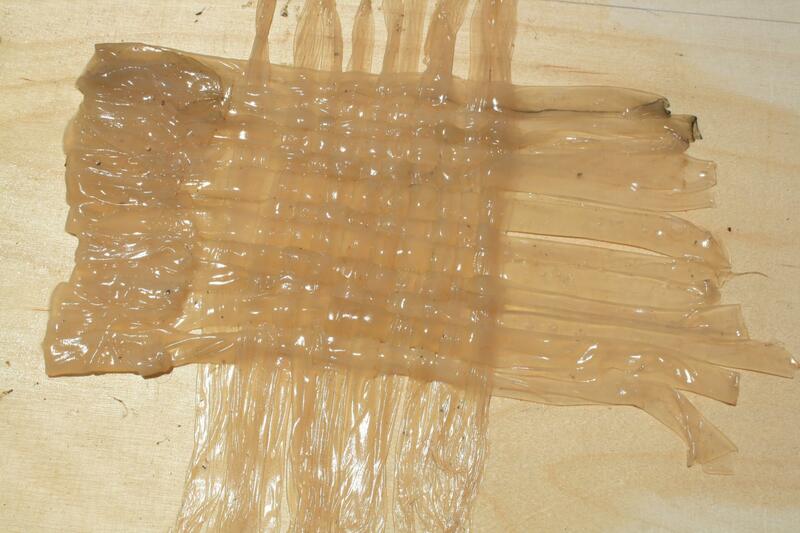 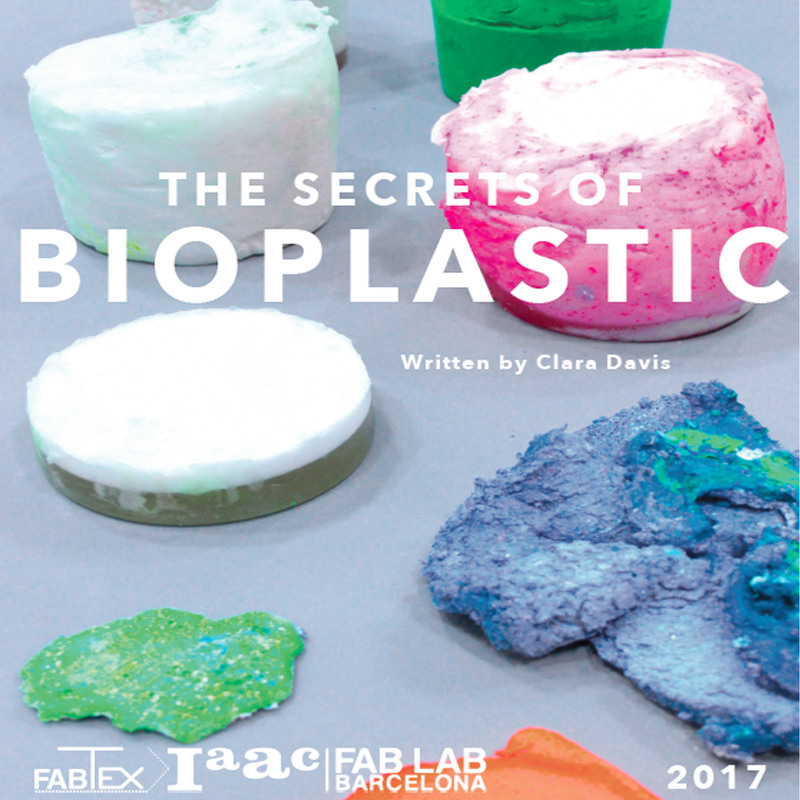 The Secrets of Bioplastics by Clara Davis here. 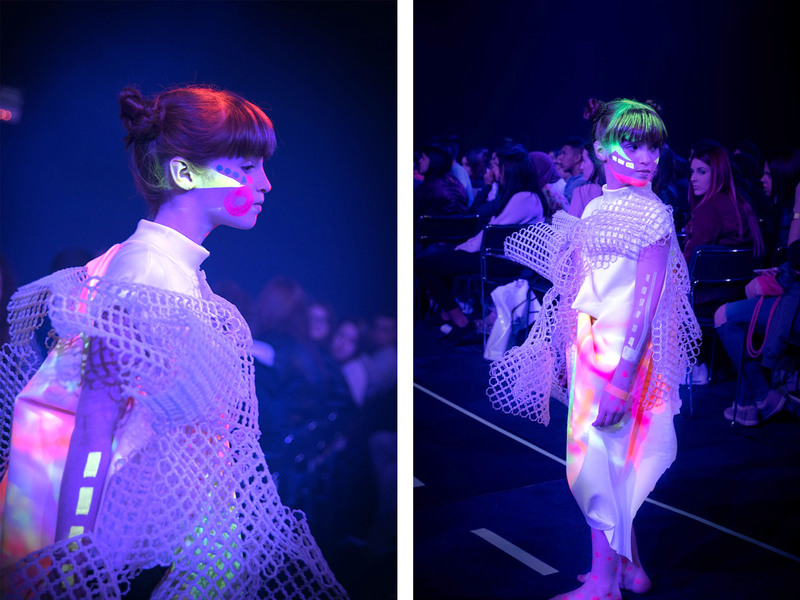 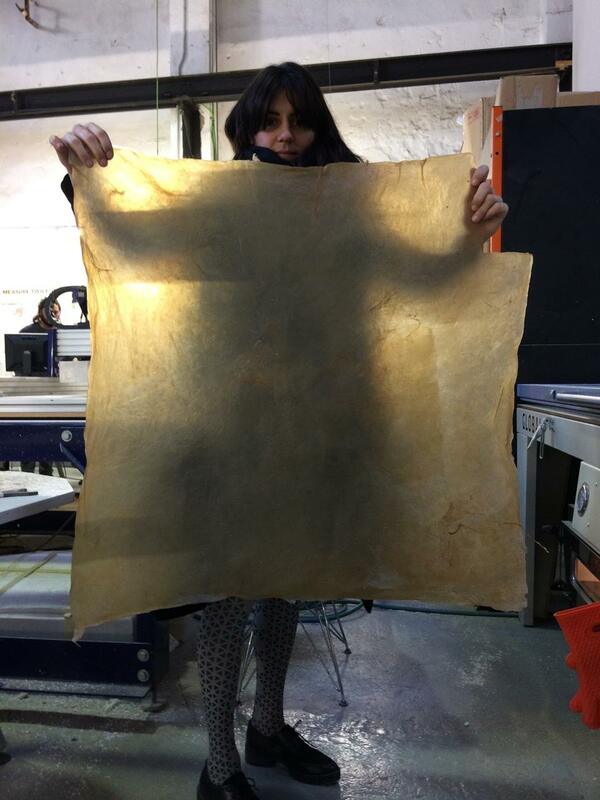 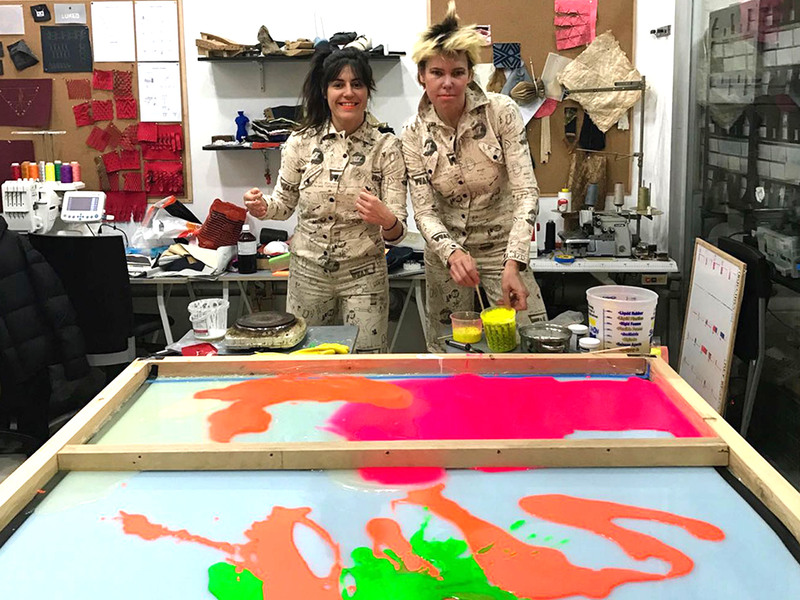 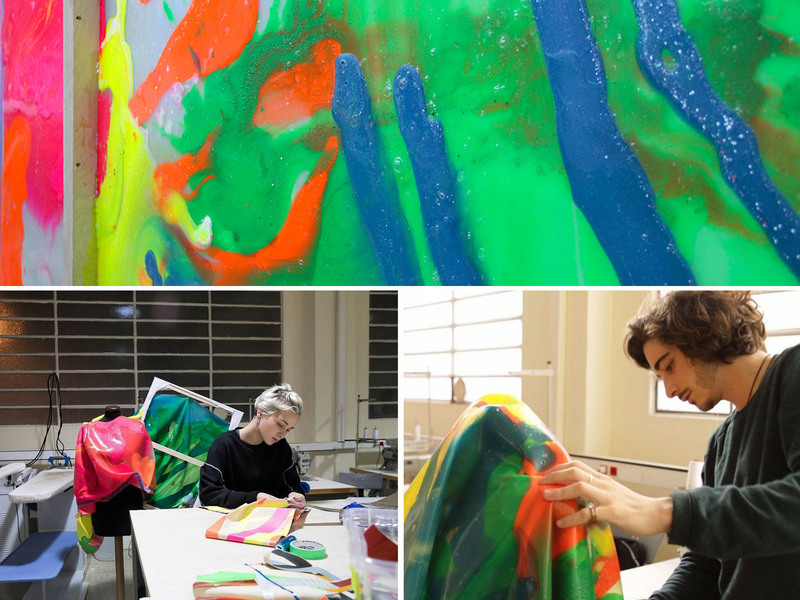 At the Fab Textiles ​​we explored the functioning and application of electroluminescent paint. 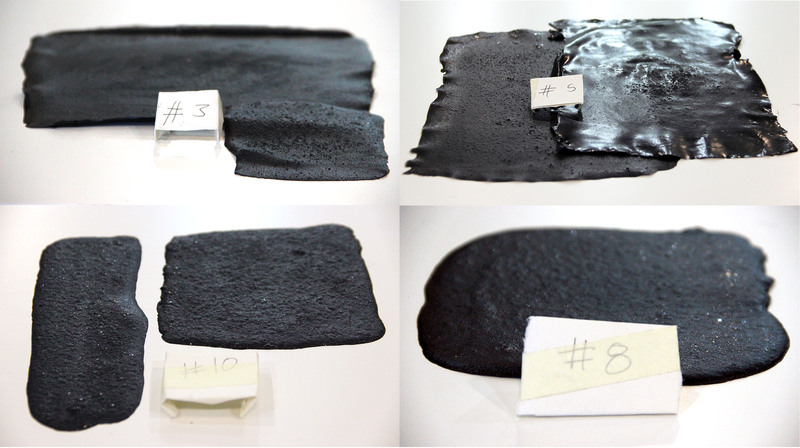 Different tests were developed on different type of  materials. 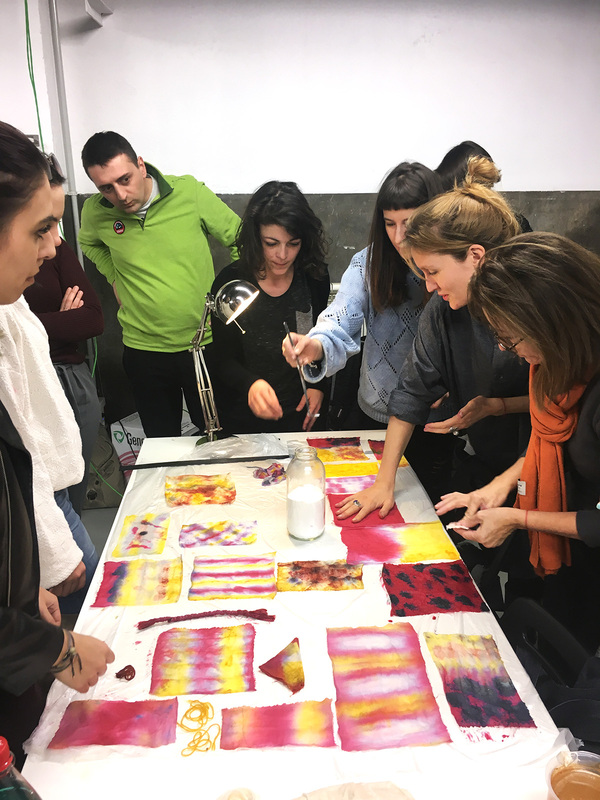 Two final prototypes were generated with the designer Cristina Noguer for her exhibition "Refraccions" at Barcelona Desing Week 2017. 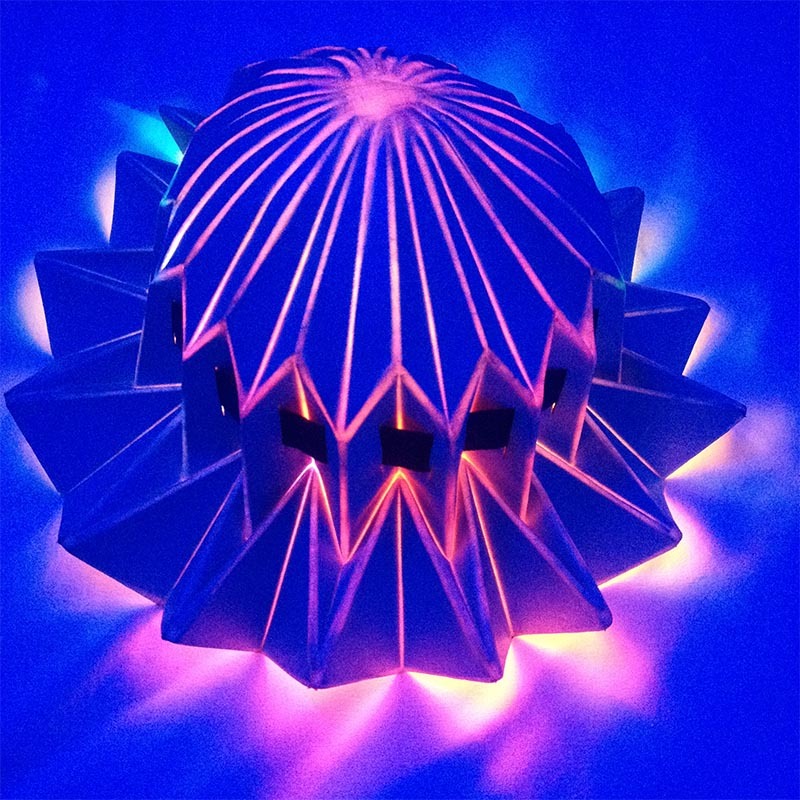 Electroluminescence is an optical and electrical phenomenon in which a phosphorescent material emits light in response to an electric current or to a strong electric field. 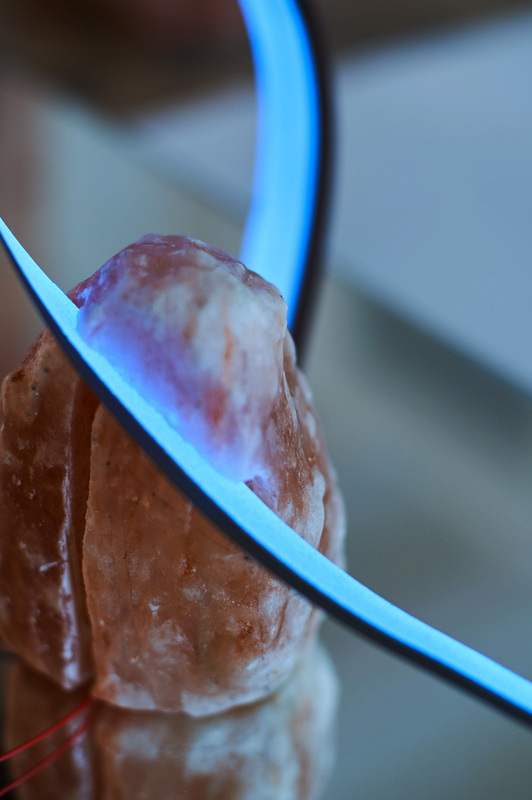 It is different from light emission resulting from heat (incandescence), from a chemical reaction (chemiluminescence) or other mechanical action (mechanoluminescence). 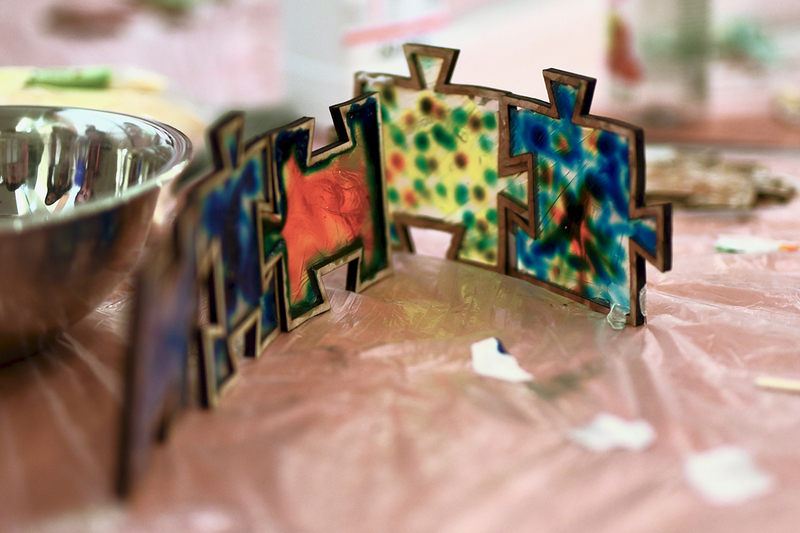 Electroluminescent Paint is essentially a painted circuit. 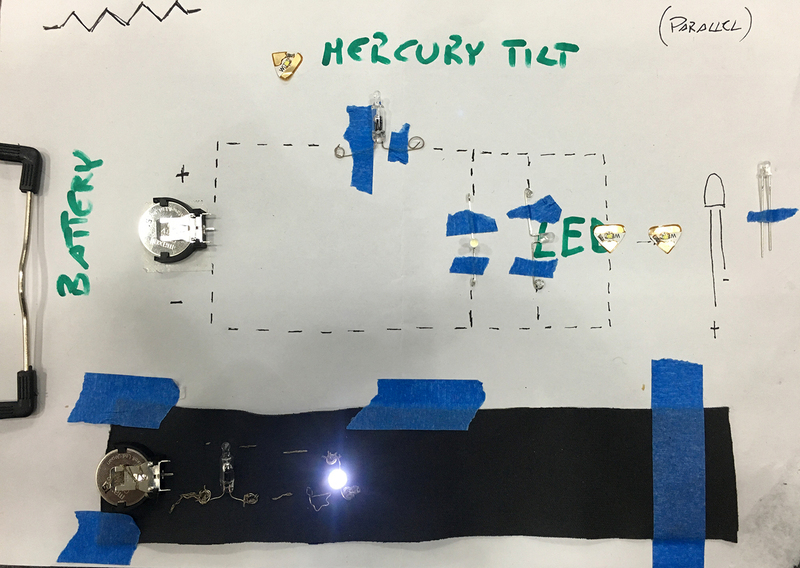 A multi-layered system which uses an alternating current (A.C) power source in order to emit light. 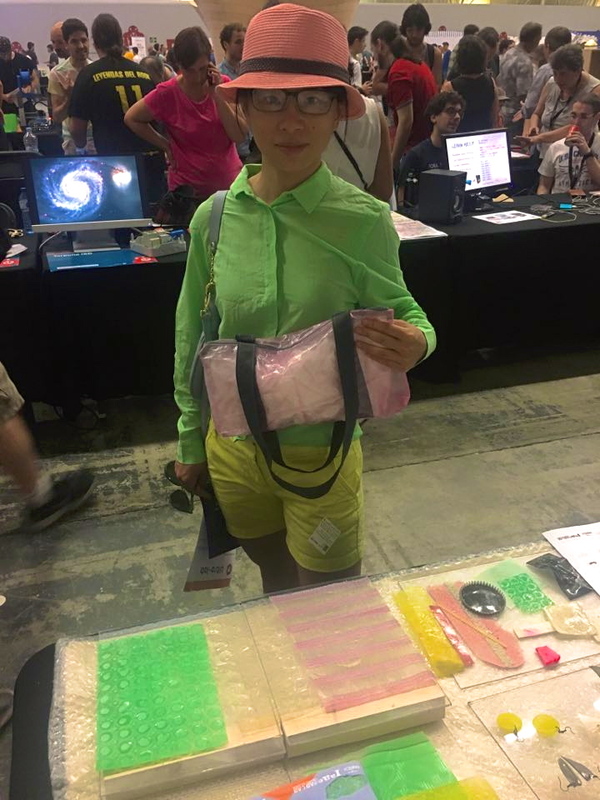 How to make electroluminescent paint circuits? 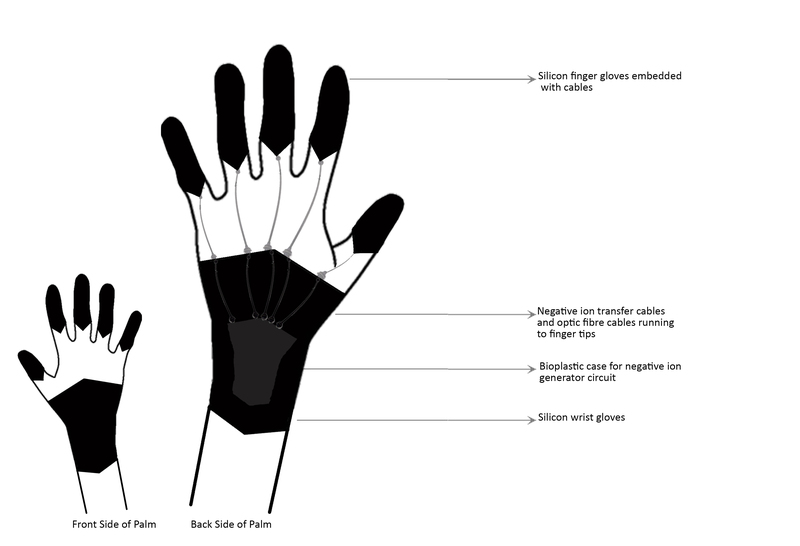 Basically we need to generate a phosphorescent layer between 2 conductive layers. 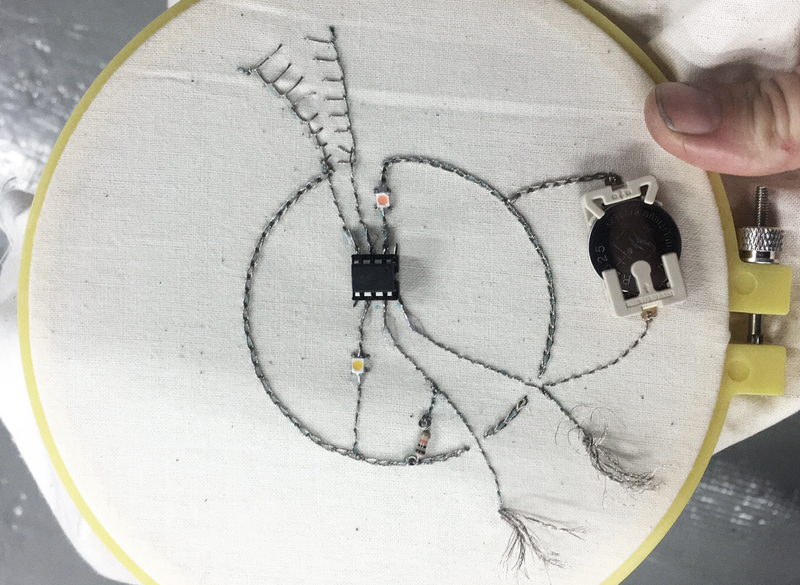 They must not touch each other in order to not generate a short circuit, so an insulating layer must also be added between them. 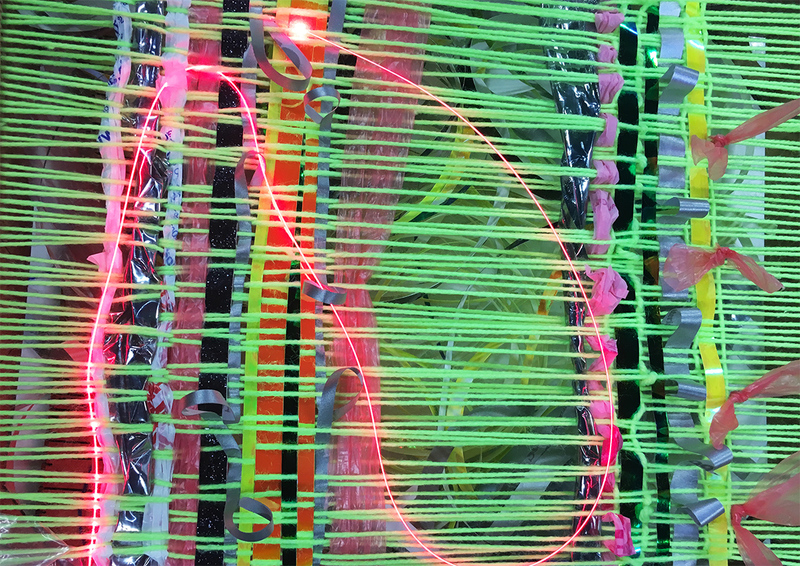 Electroluminescent Paint requires a minimum of 100v of alternating current to emit light. 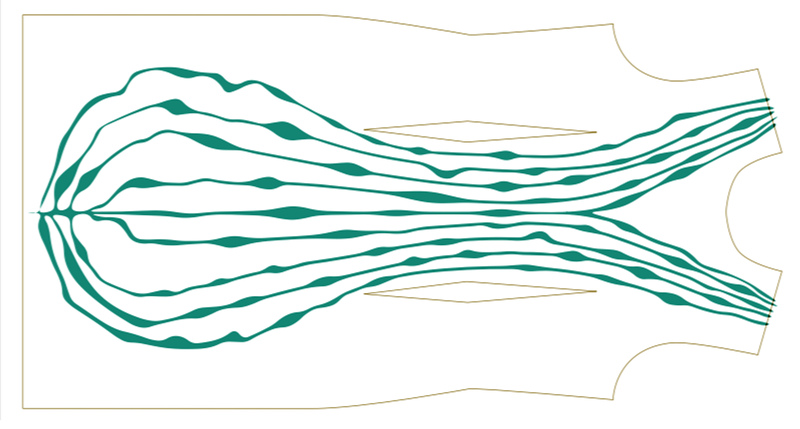 Standard electronics consist of 12-18v D.C inverted to approximately 180v A.C. 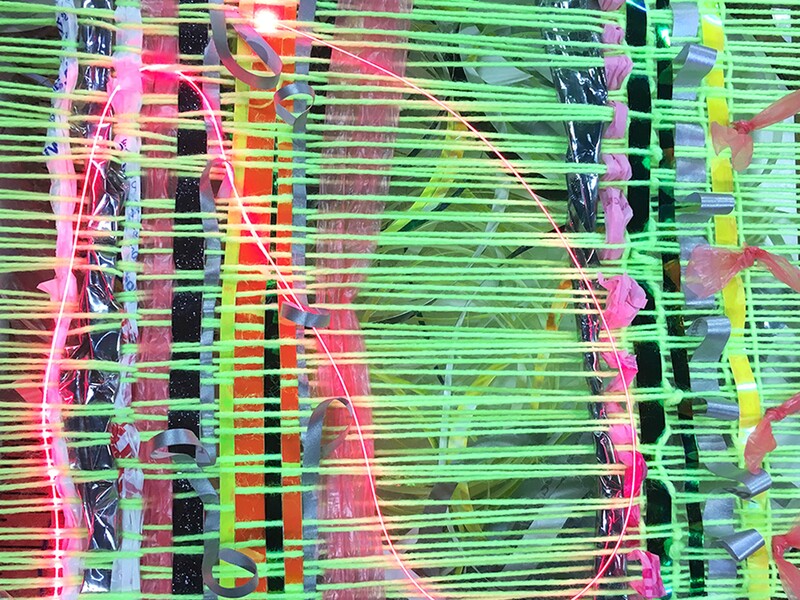 When an inverter applies the proper voltage and frequency, it excites the electrodes contained in the paint and its lights up. 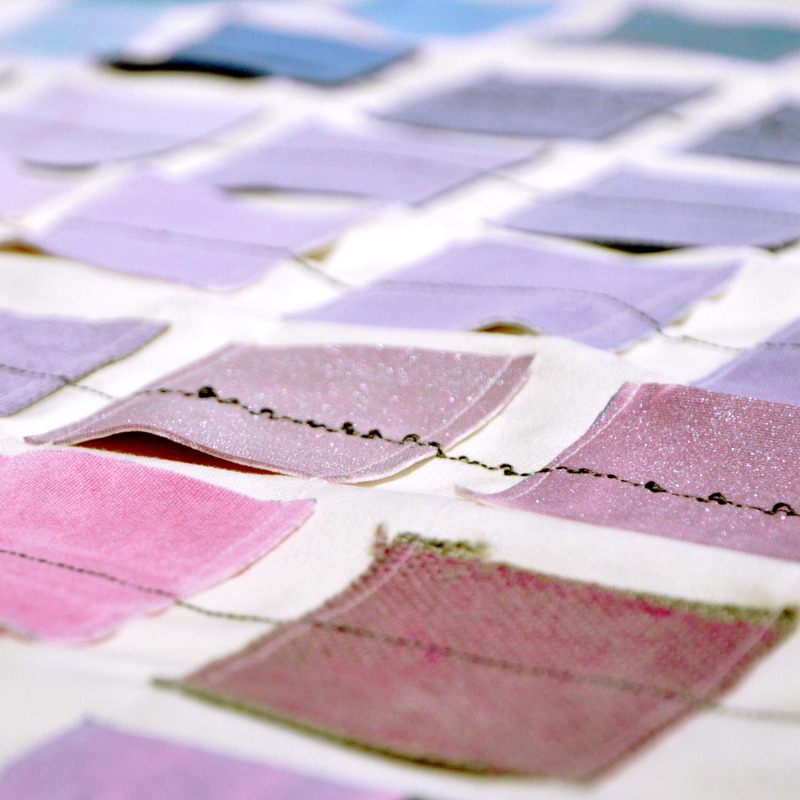 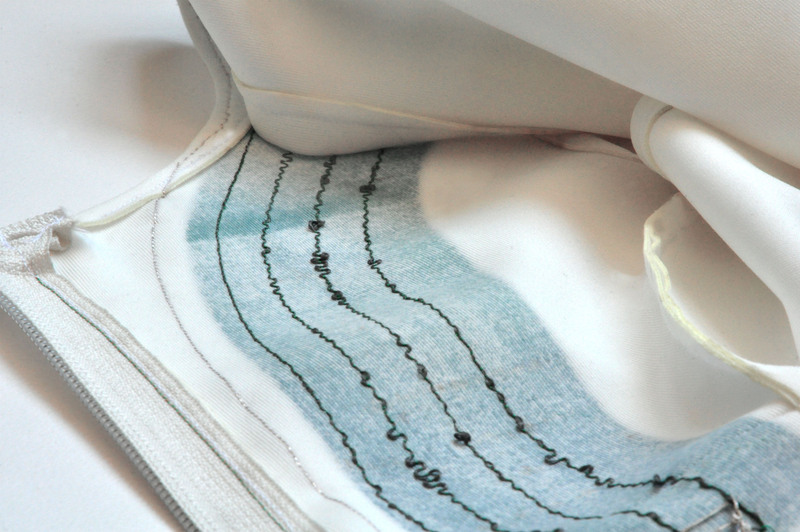 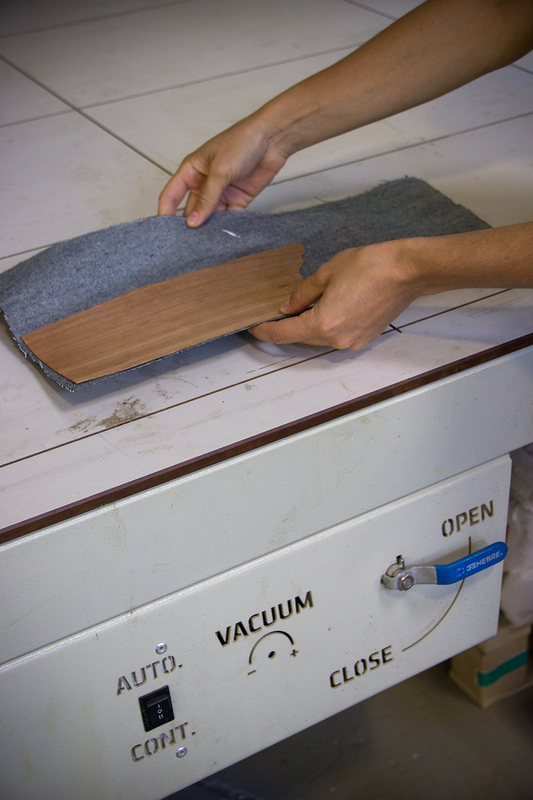 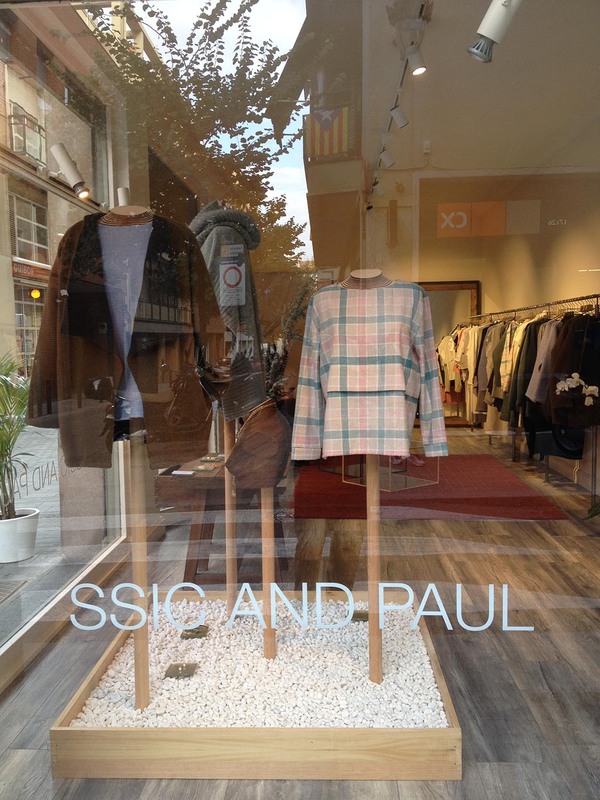 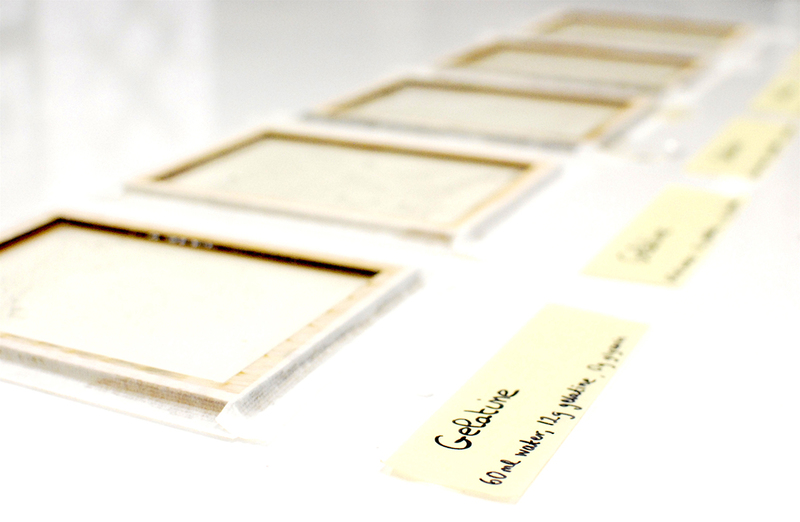 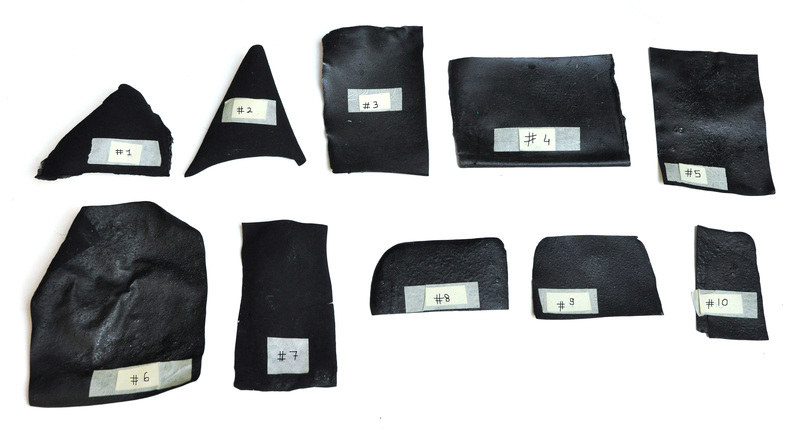 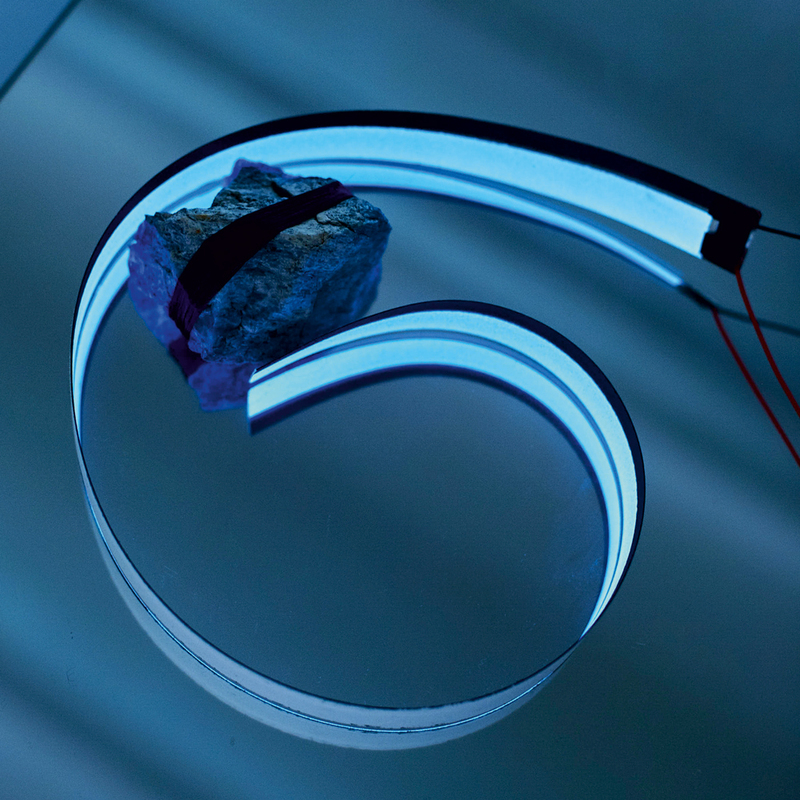 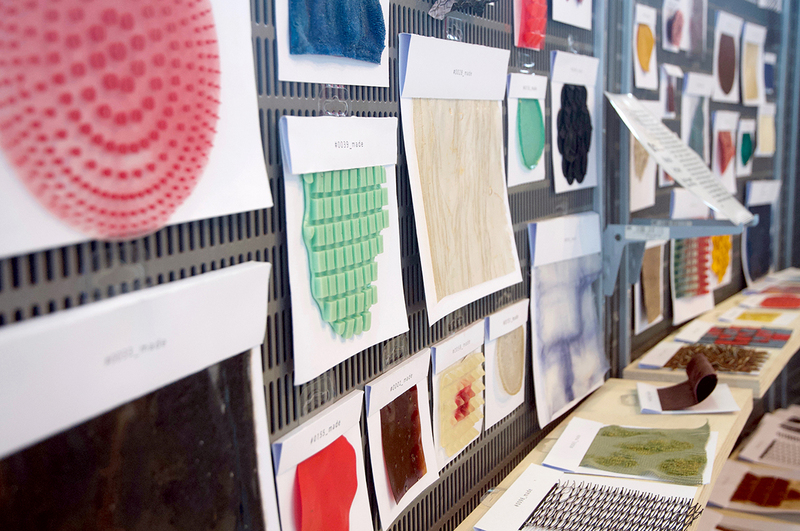 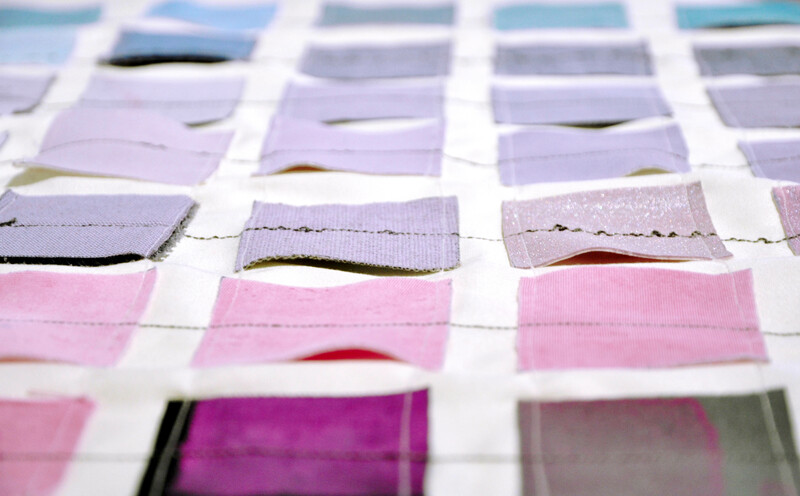 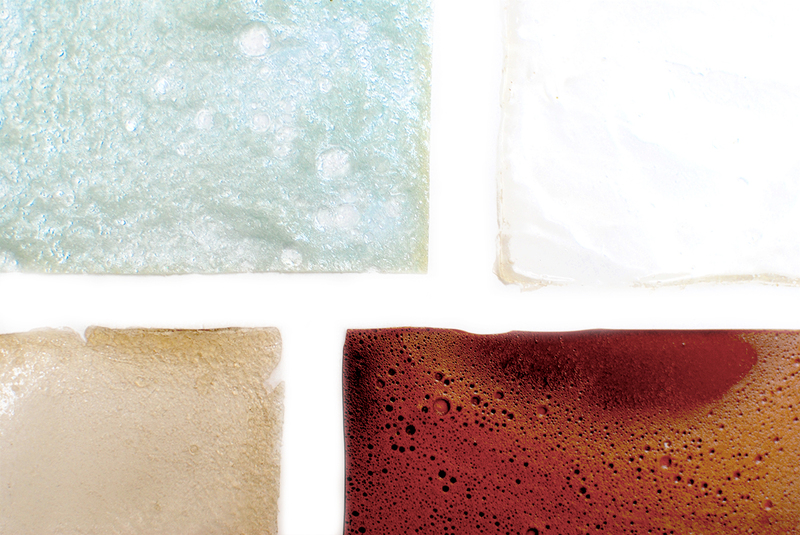 We developed tests on different materials such as fabrics, conductive glass, acrylic, wood and paper. 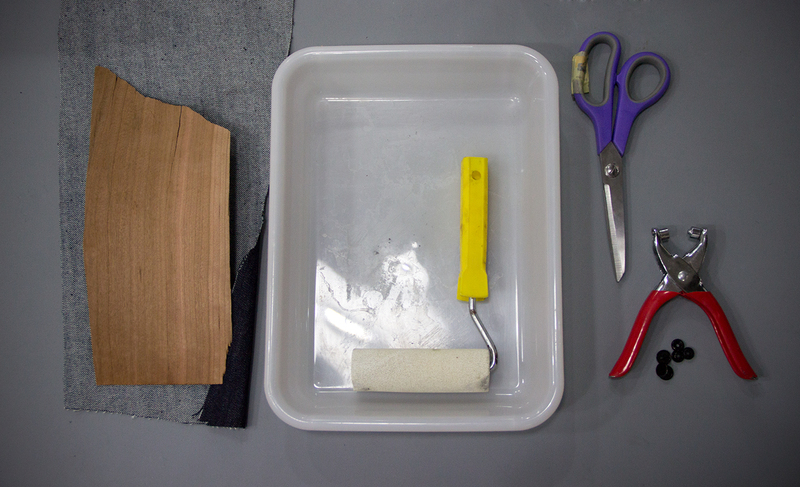 Ideally the material does not to have texture, to avoid the layers cross the material or mix it each other. 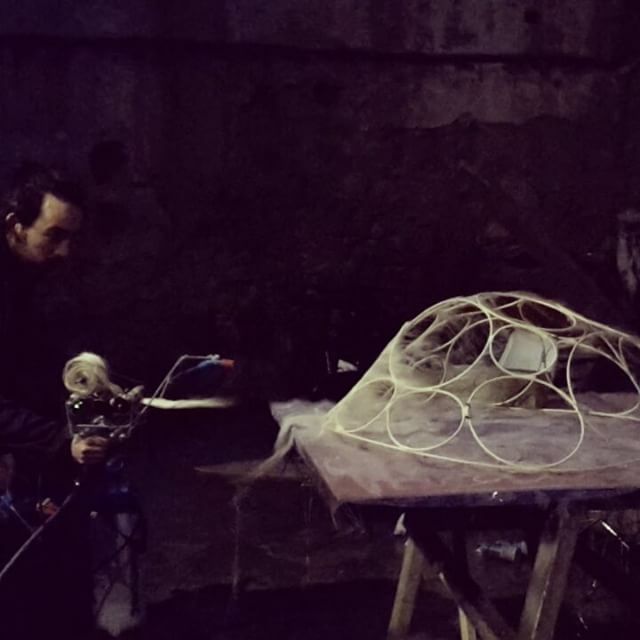 We masked the surface that wouldn’t be painted. 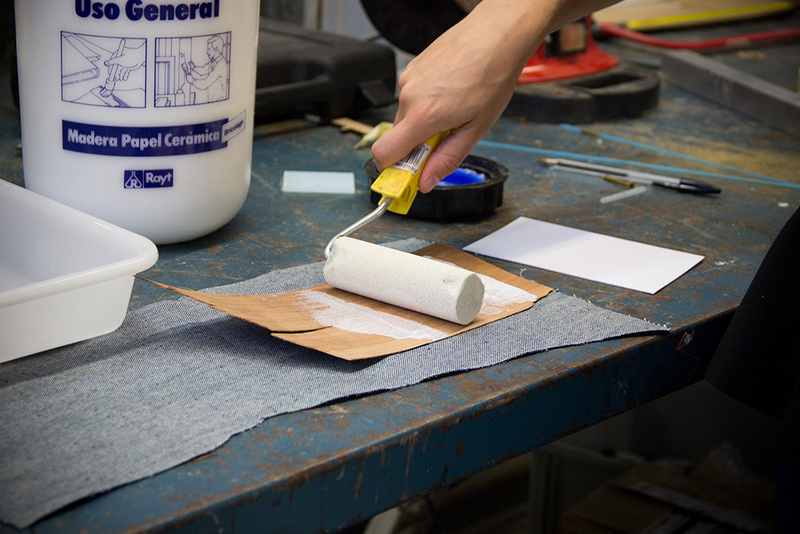 Using a low pressure gun we applied coats in horizontal and vertical way checking that the whole surface was covered. 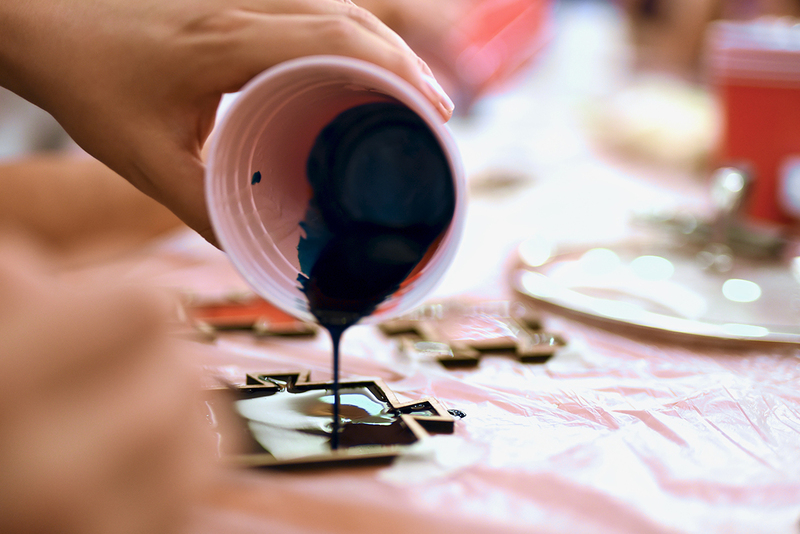 15 to 30 minutes must be waited before applying the next layer to let the paint dry. 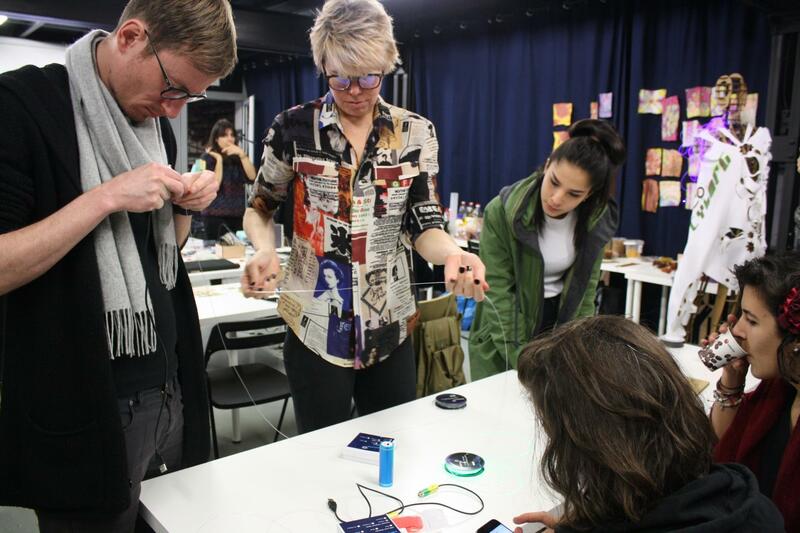 We checked Ohms with a multimeter to ensure that the electricity flowed freely into the whole surface. 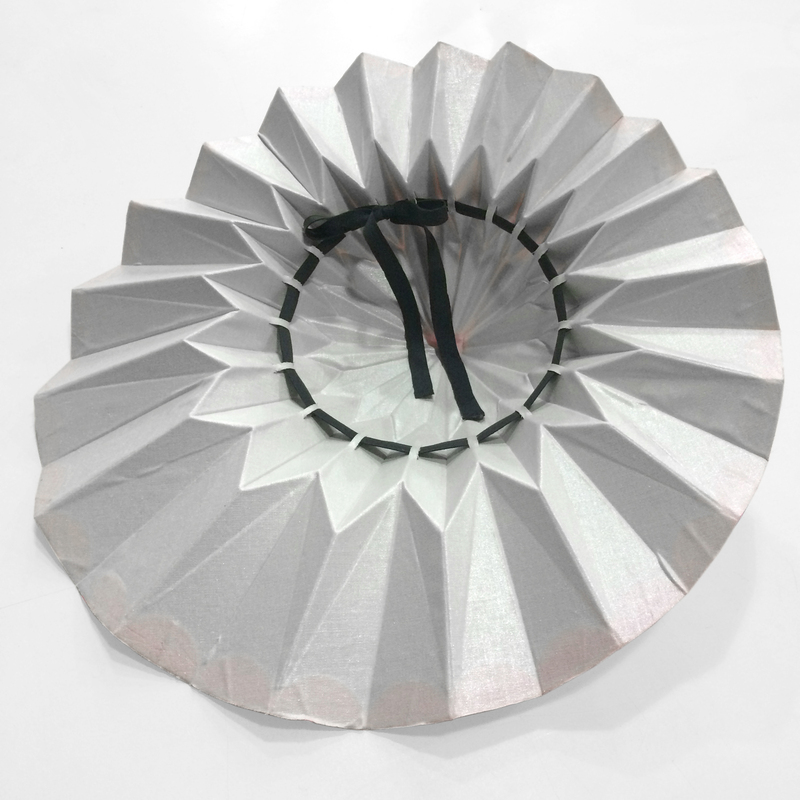 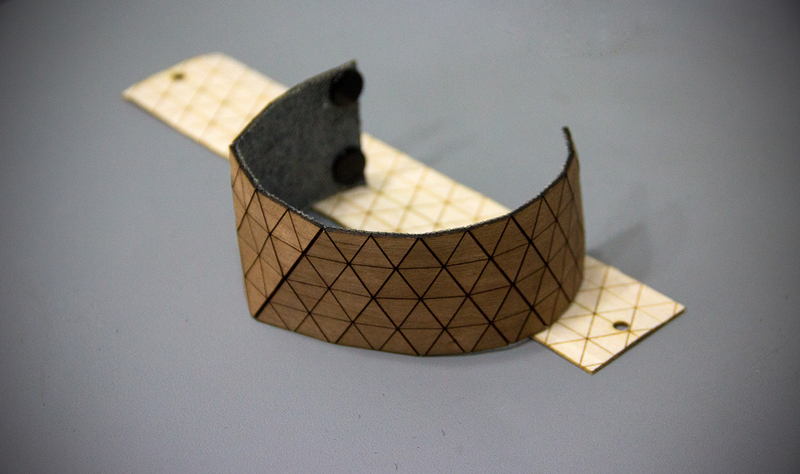 We made a new mask covering the conductive flange. 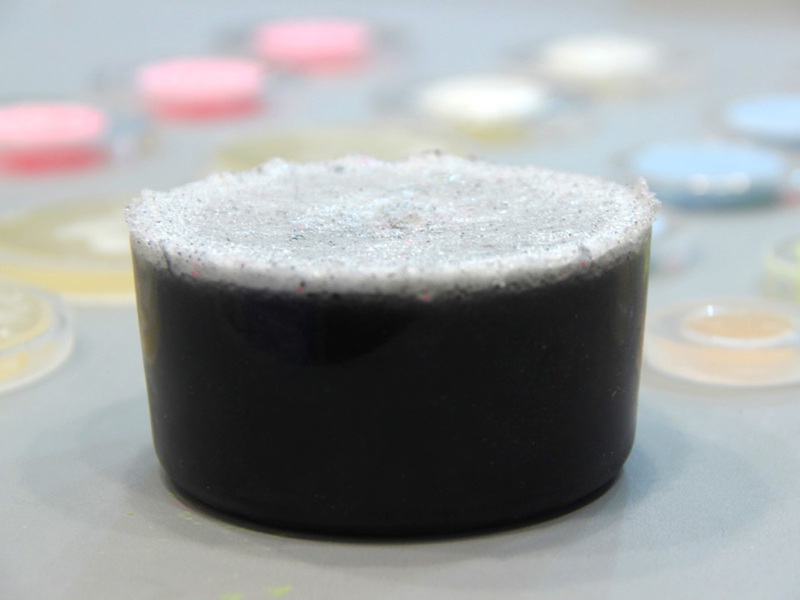 We mixed slowly the paint to avoid bubbles that could cause problems to cover conductive layer (a minimum free point can cause a short circuit between conductive layers). 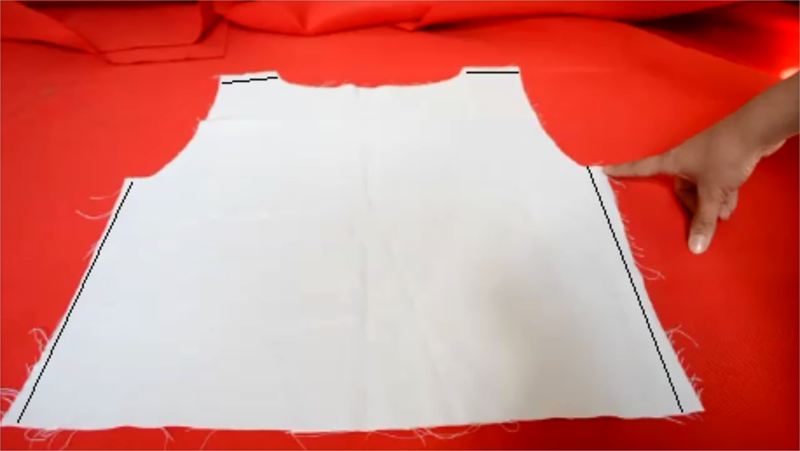 Using a low pressure gun we applied coats in horizontal and vertical way. 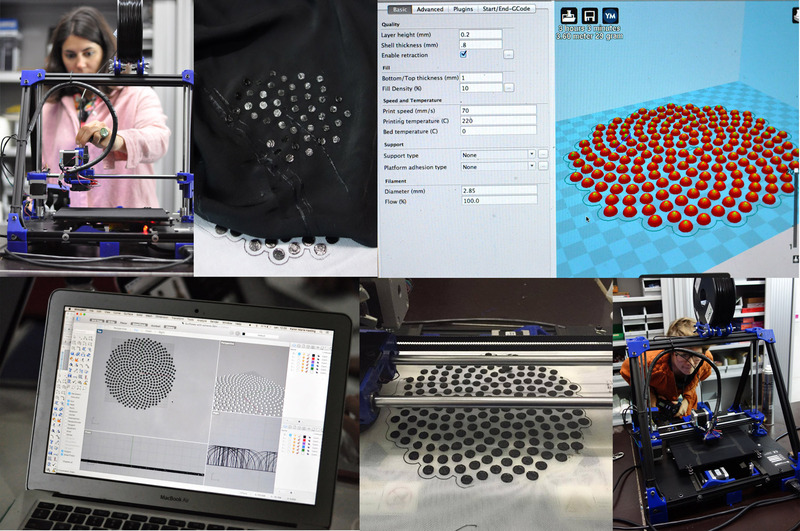 We waited 15-30 minutes before applying the next layer. 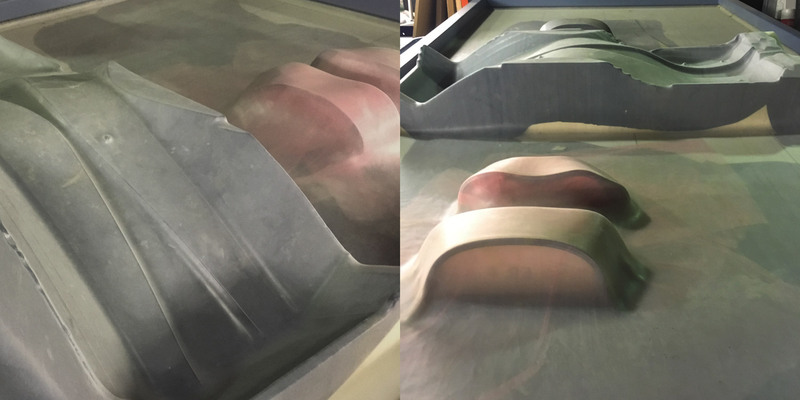 We applied the phosphorescent layer with a low pressure gun under a UV light to check that the paint was applied in an uniform way over the whole surface. 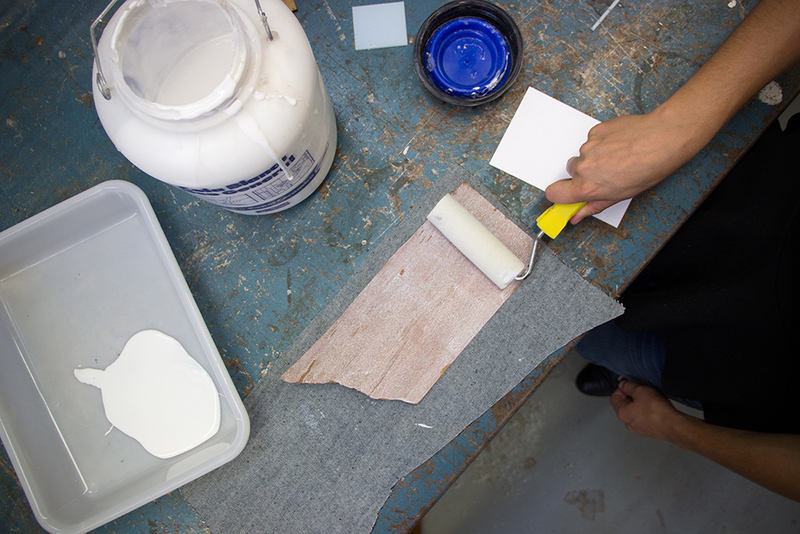 A good rule of thumb its to shake the pressure gun during the process, so that the phosphorescent pigments and the paint do not separate. 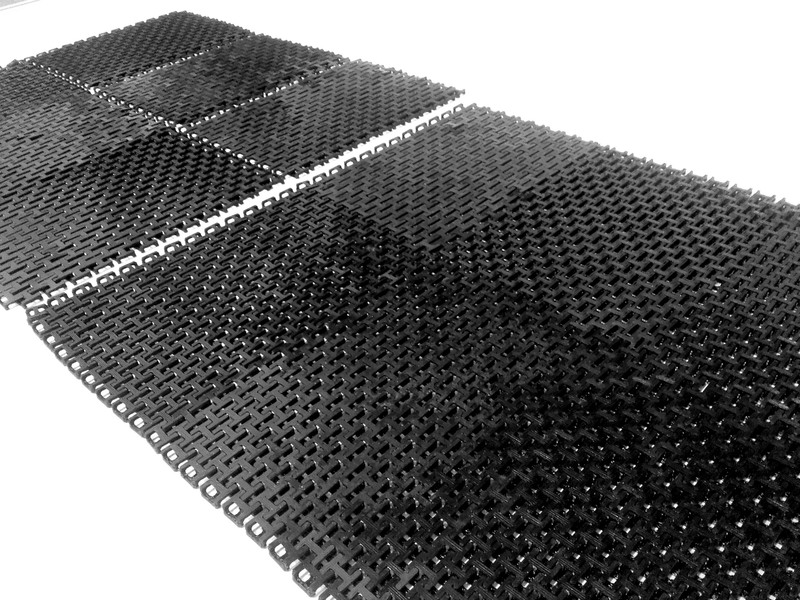 Same materials used at layer 1. 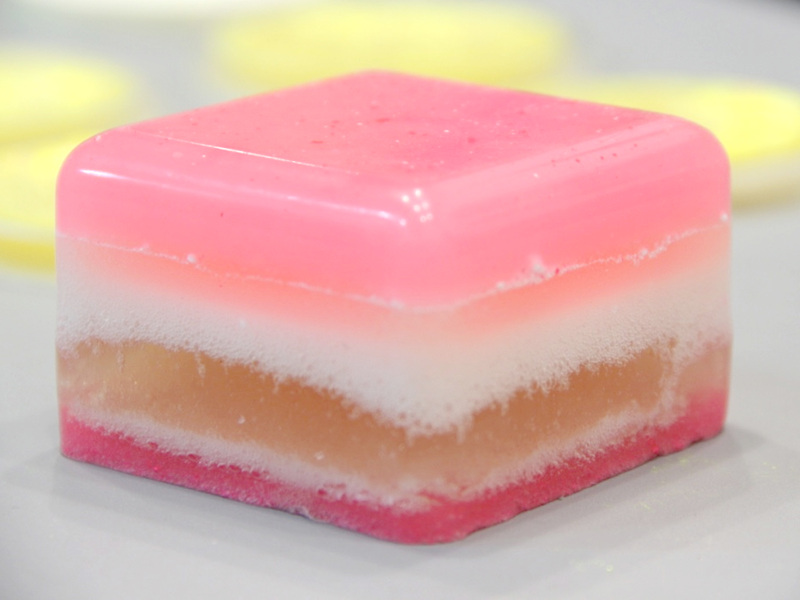 This layer distributes the electric current. 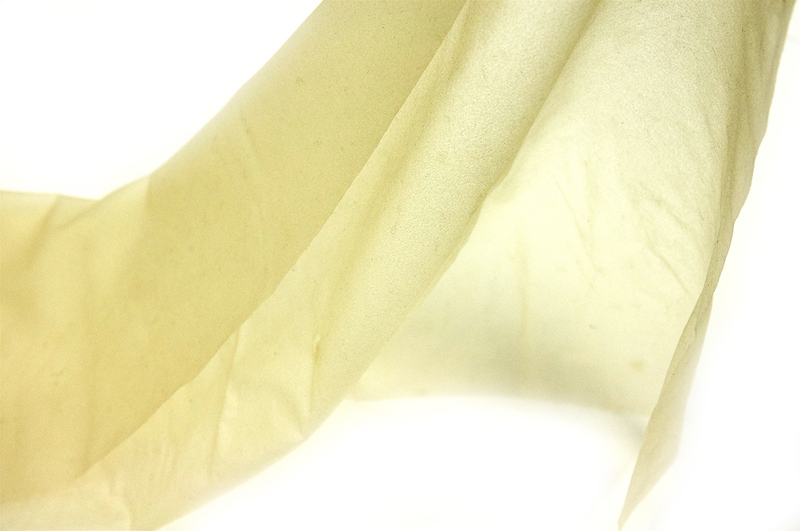 It size has to be  20-30% of the phosphorescent layer. 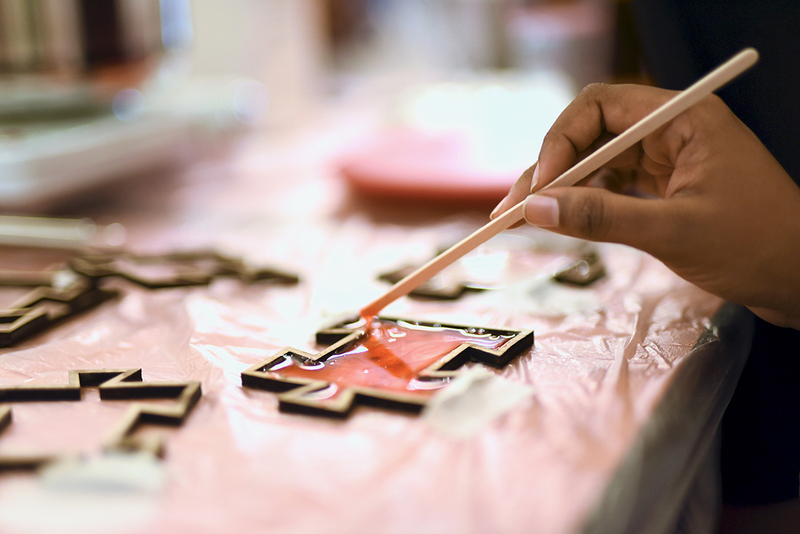 It was the most difficult layer to apply because the paint was very liquid. 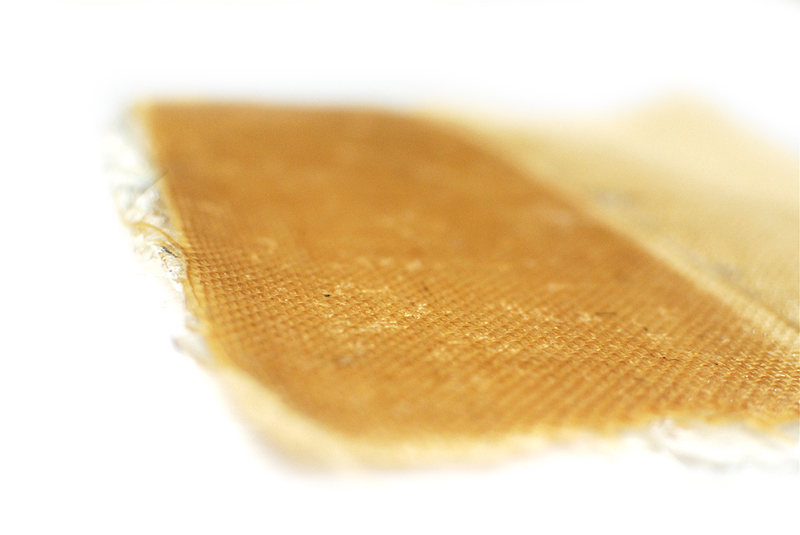 We resolved this issue drying the paint with a heat gun during the process. 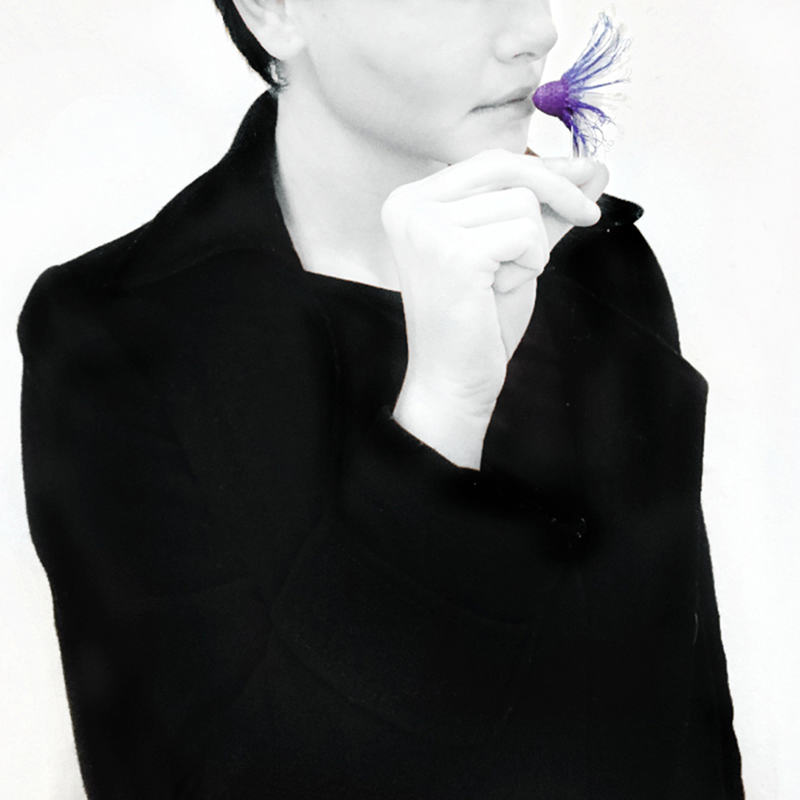 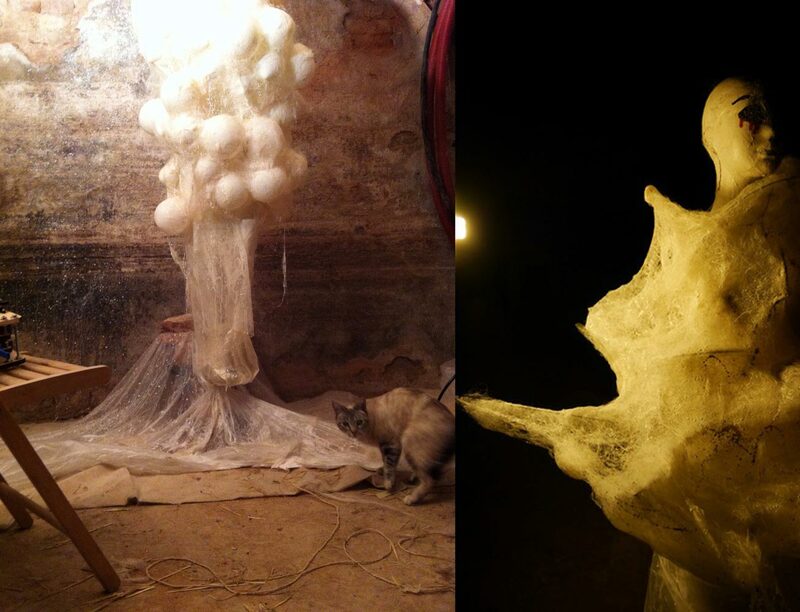 It is necessary to apply a thin coat to let the light be seeing under it. 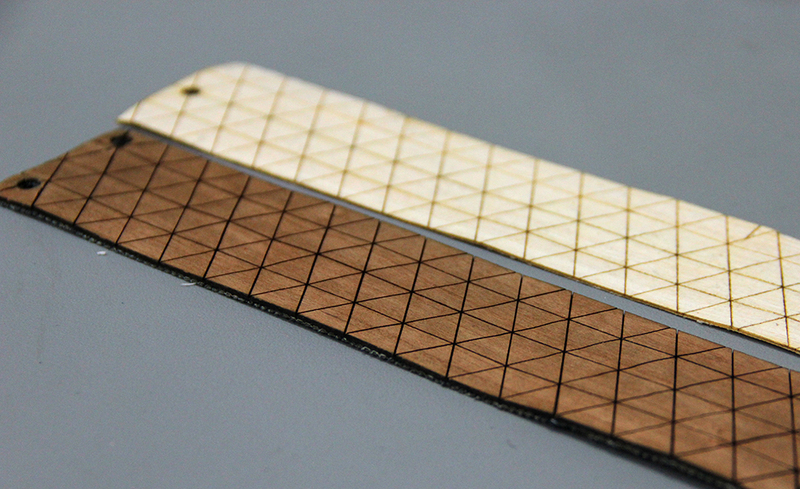 We used a painted material to encapsulated the circuit and prevent electric shock when touching it. 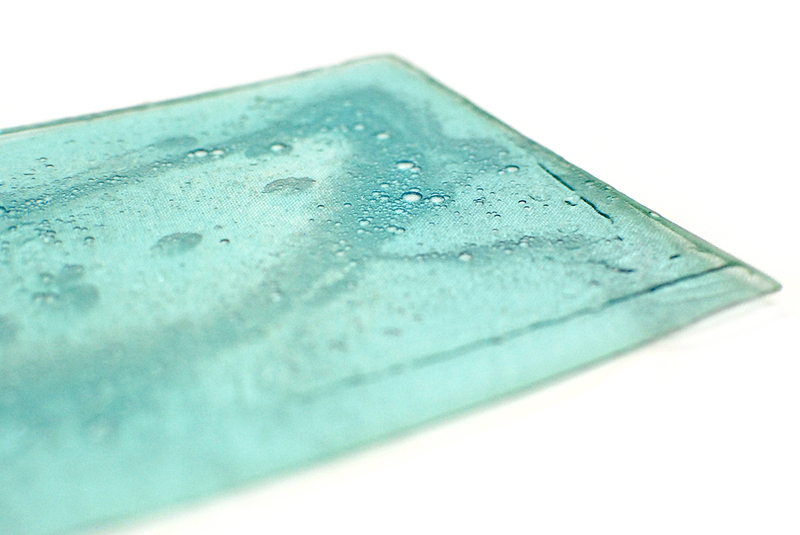 It can be or not a paint material depending on the purpose (for example glass), but always a transparent material to let the light be seeing. 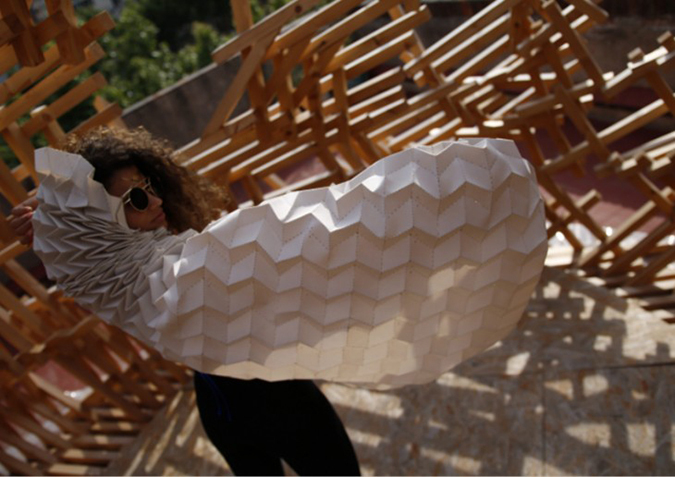 With the Designer Cristina Noguer 2 paper lamps were created and developed for her exhibition Refraccions at Barcelona Design Week- 12ª edition, Design Unique Piece 2017. 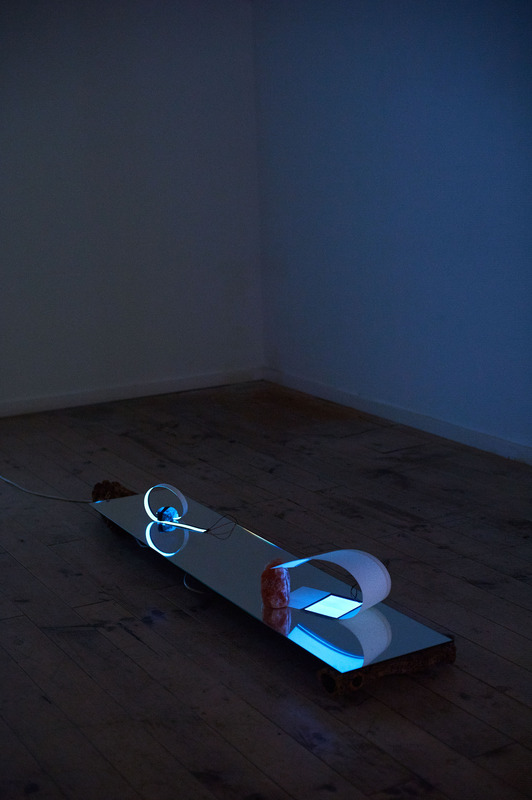 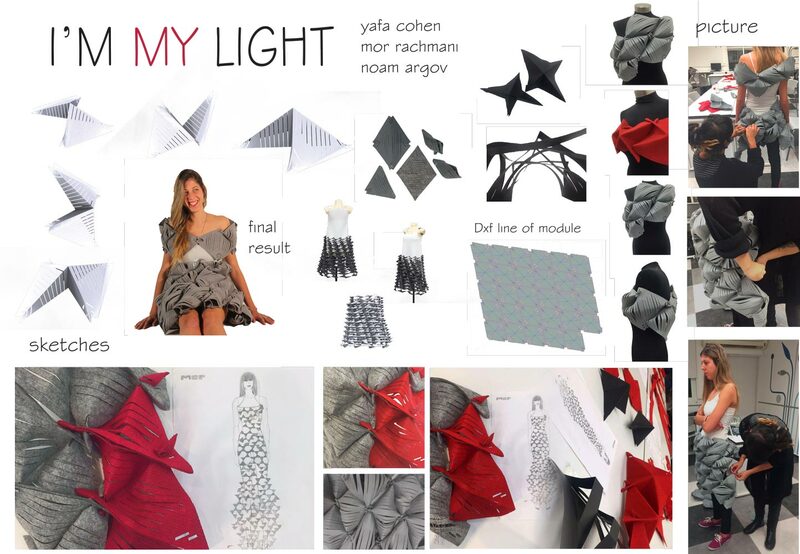 Her exhibition was based on the natural and artificial light as main material. 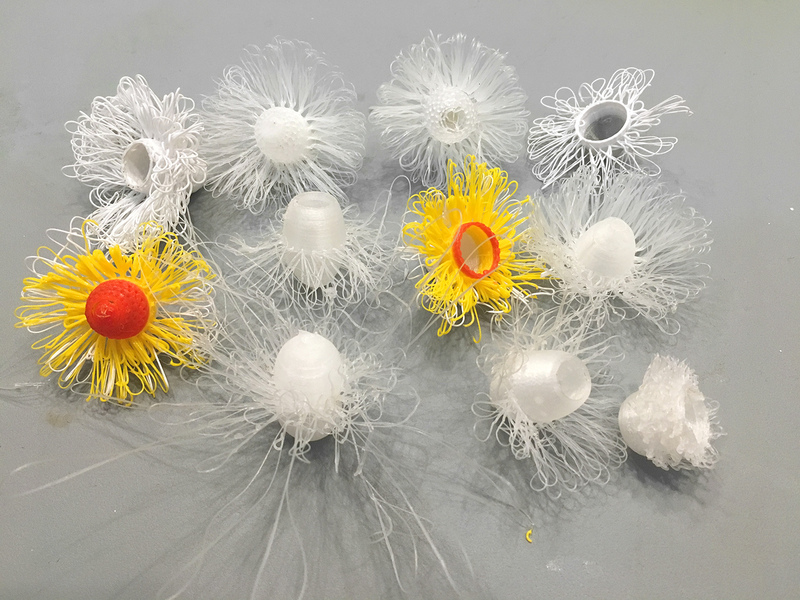 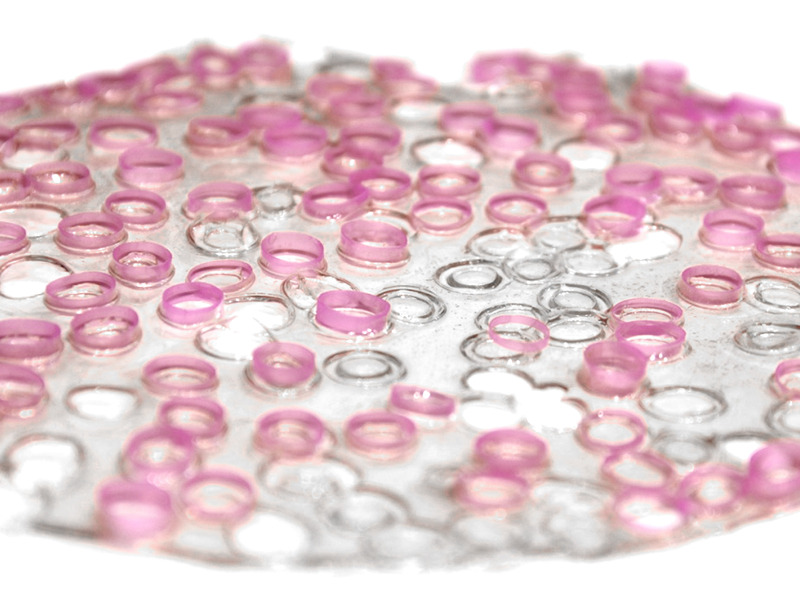 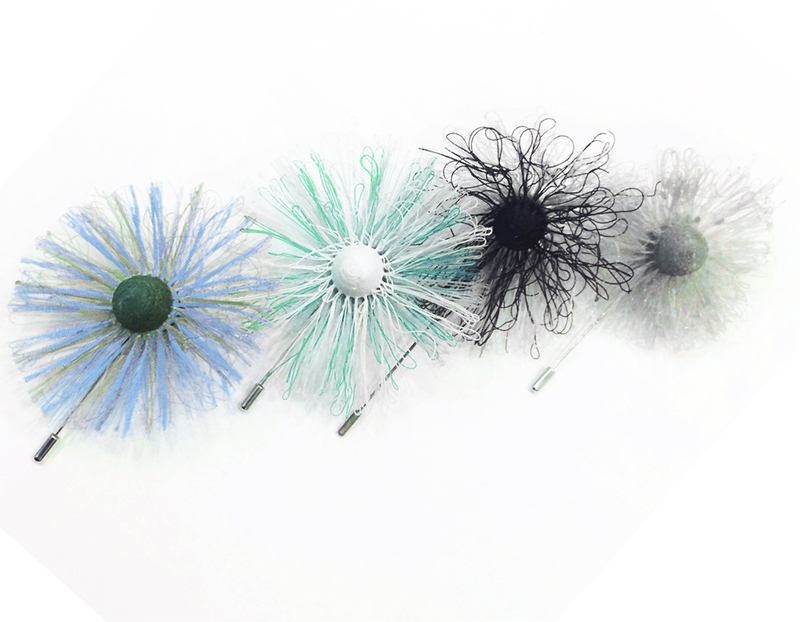 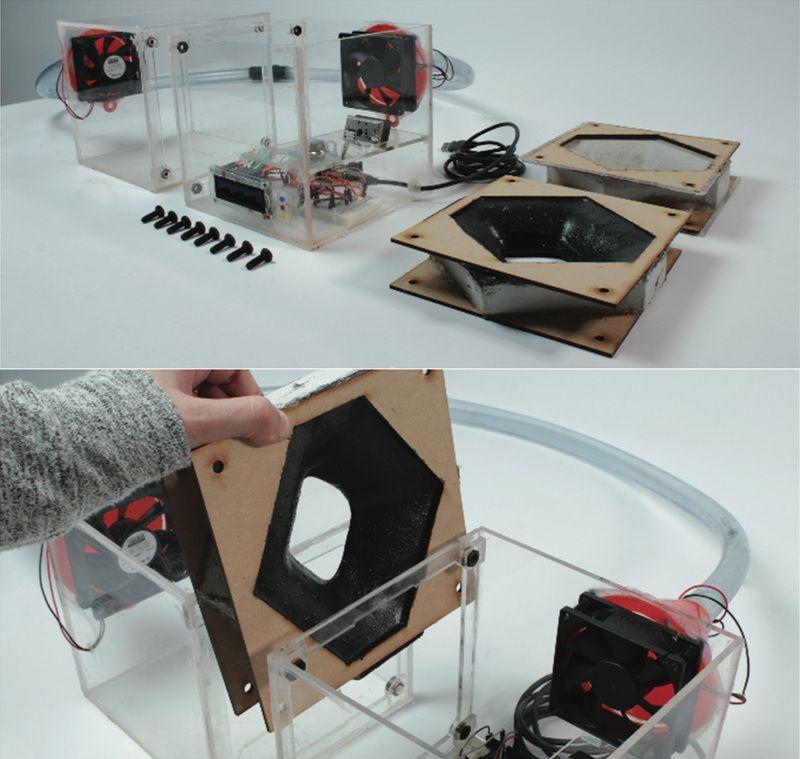 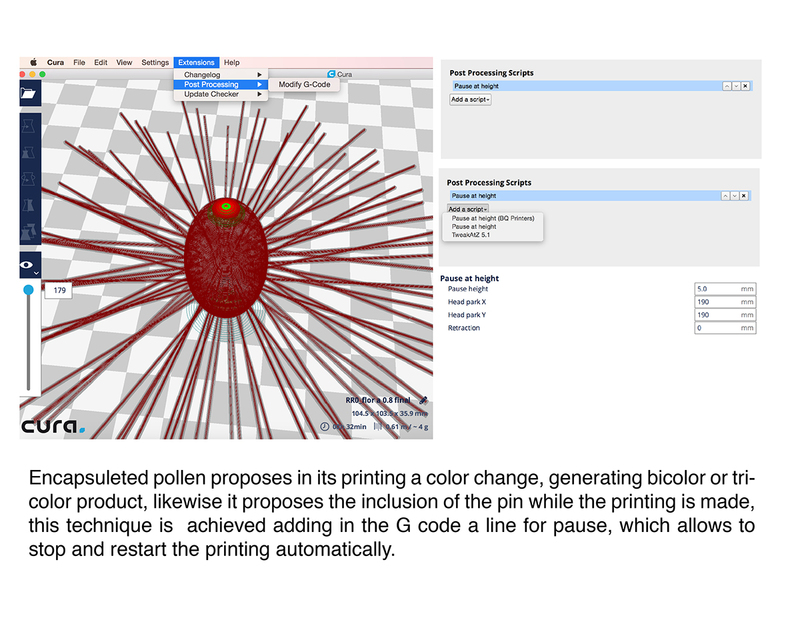 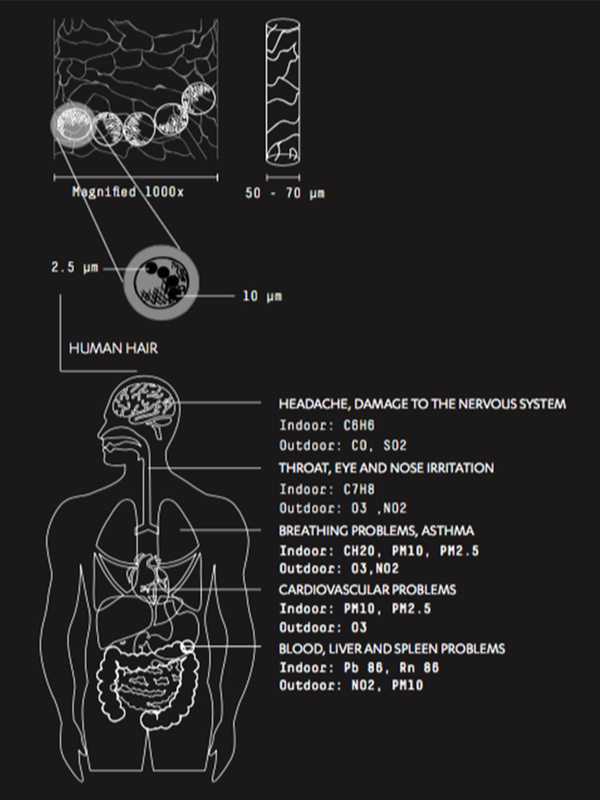 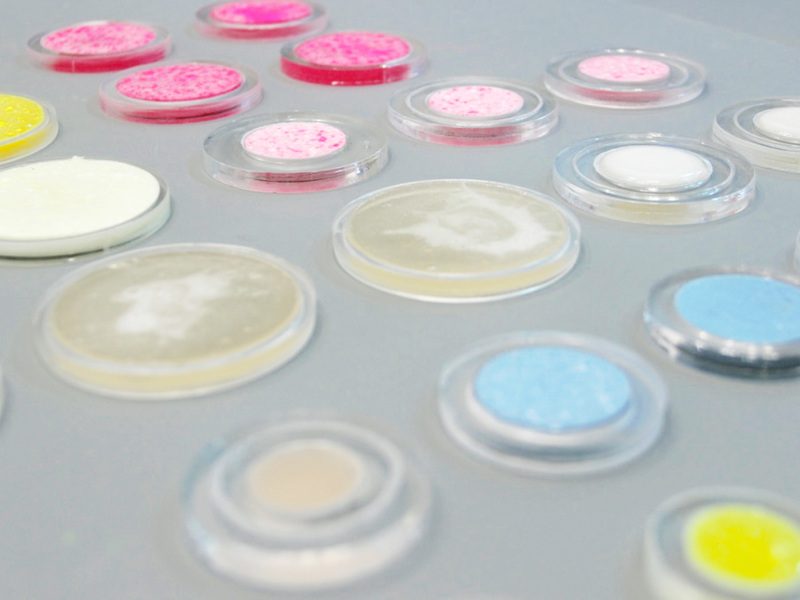 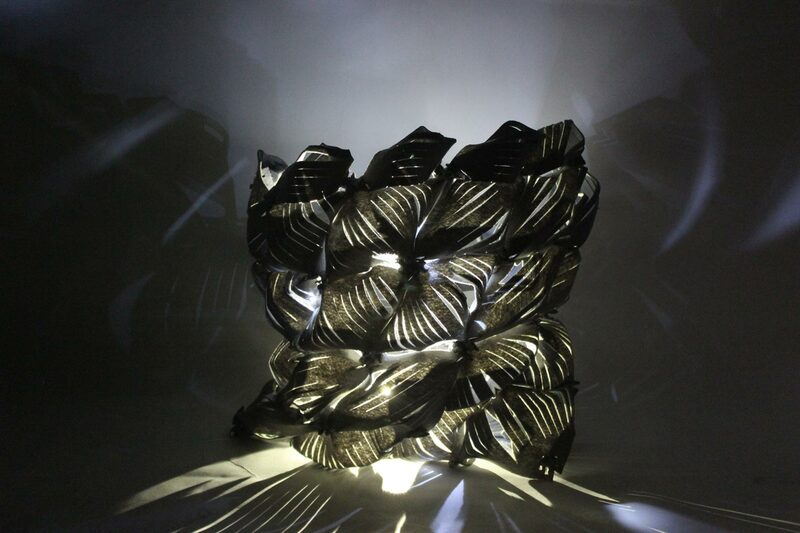 Encapsulated pollen is a project that brings together technology and creativity. 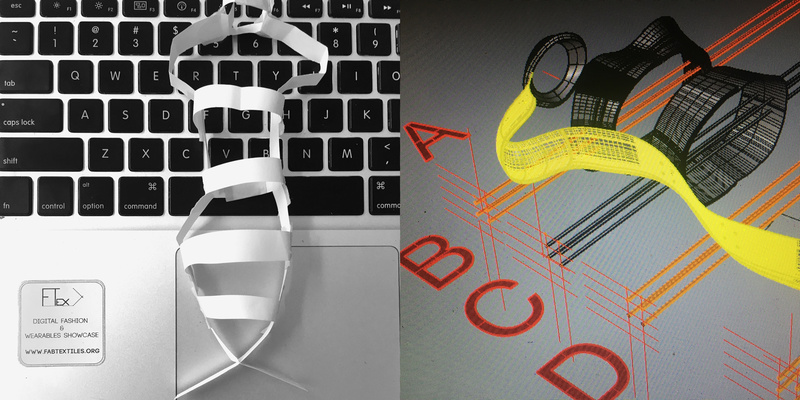 3D printing, jewelry and perfumes.It is a proposal that we made for a workshop on the future packaging of fragrances. 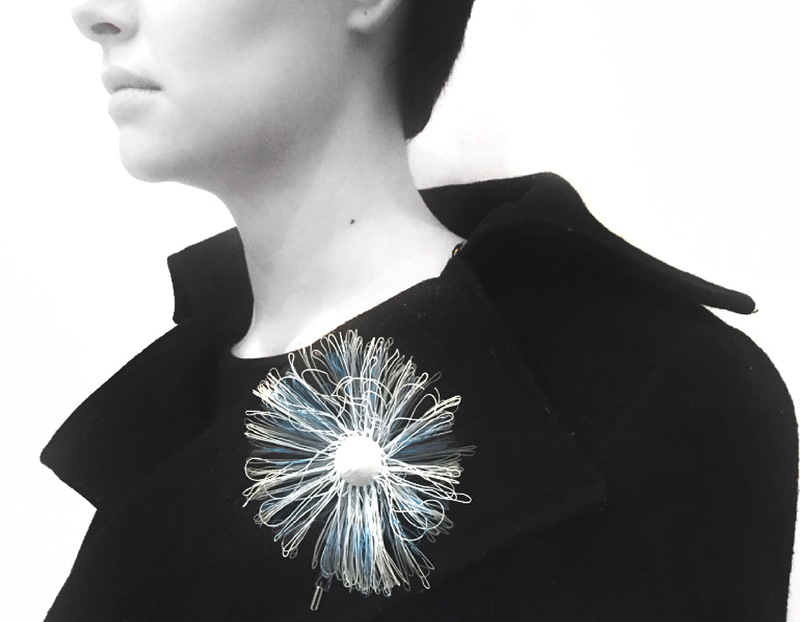 One piece of jewelry entirely 3D printed, inside of it is possible to introduce fragrance capsules made from hydrogel, allowing to carry with you a smell of a perfume and prolong it throughout the day, the week or even the month. 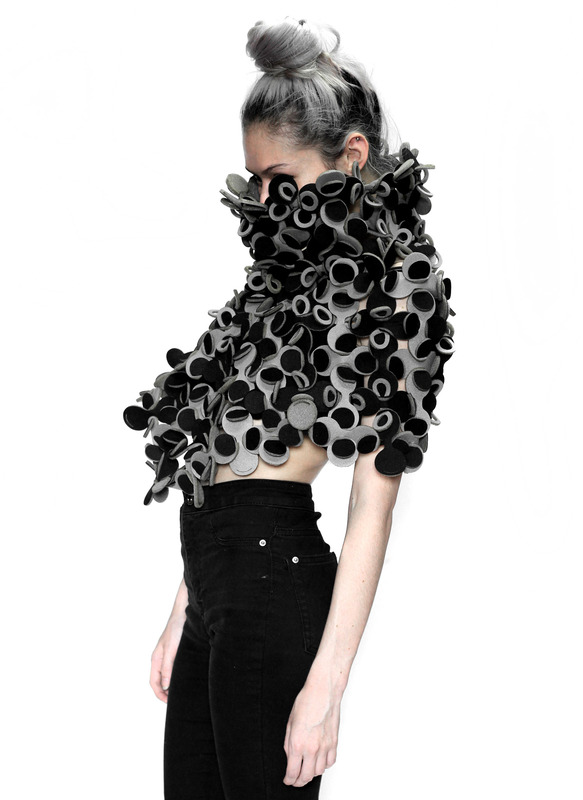 It isn’t just an accessory, it isn’t just a packing more, this prototype allows to include a forgotten public, it couples perfectly with the people who don’t tolerate the perfume in their skin as it generates allergies to them, this is a new option to the people that wish to use perfume not directly on the body but with an accessory that contains our fragrance, needs to be watered and lasts for a month. 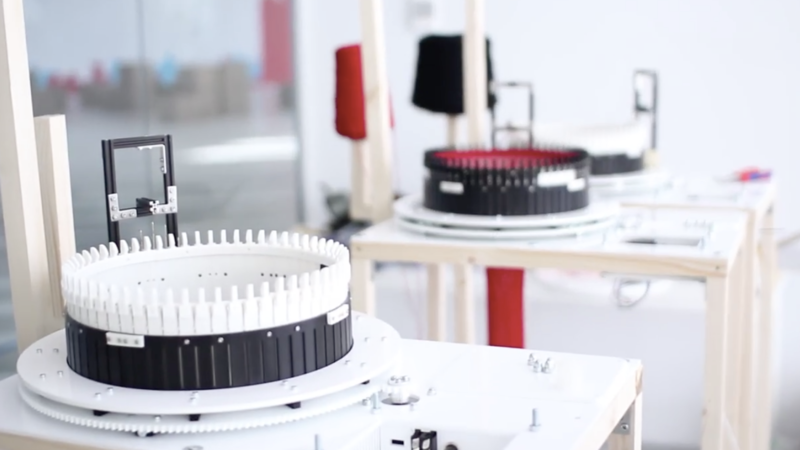 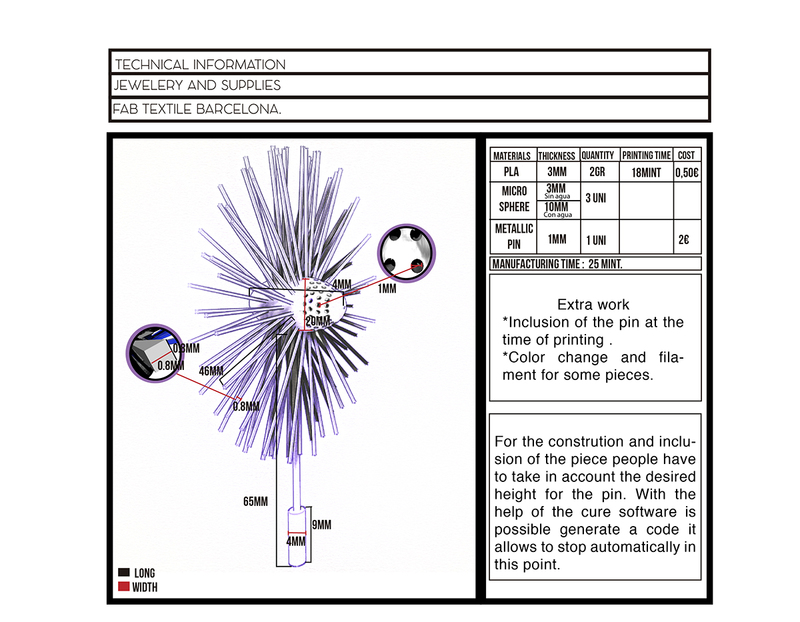 For development this piece is using a technique that is controlling the error of the machine. 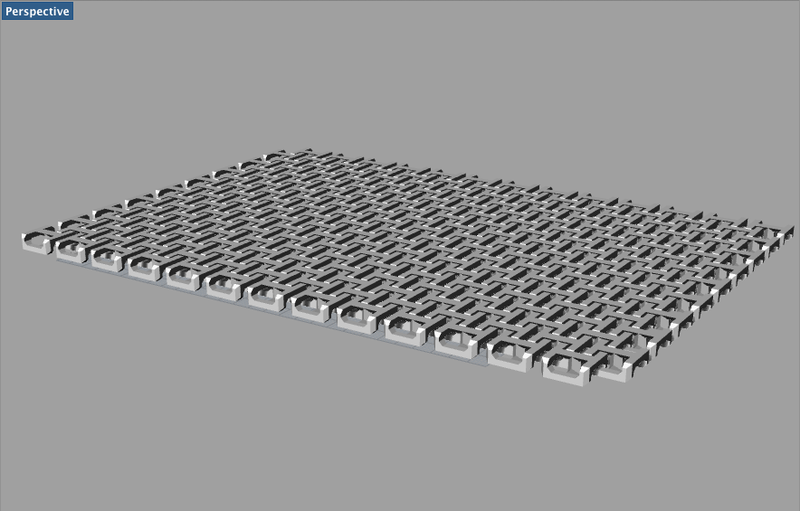 A series of extruded squares are proposed in the digital model, they have a minimal measurements that when the printing is making this really generate an error, they are so thin. 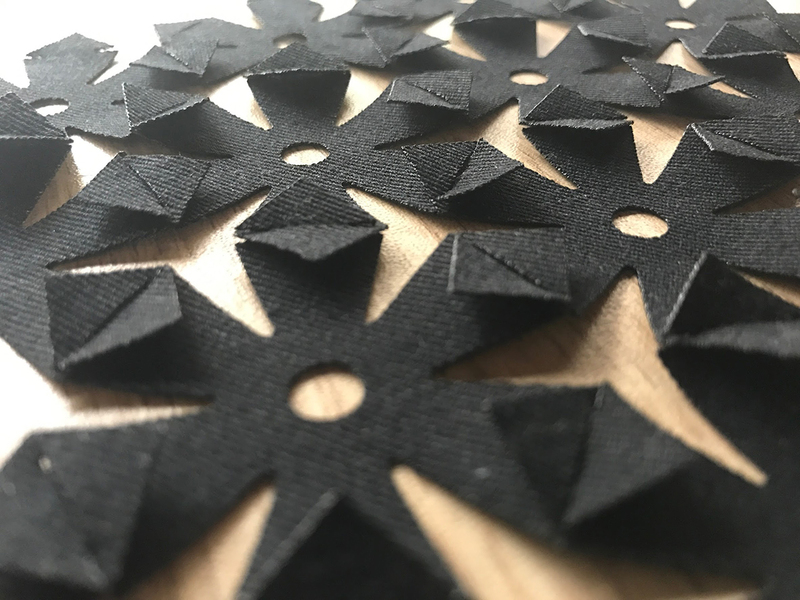 what is extruded are fine threads of filaments,these form petals that are present in the piece, it generates unique pieces for each printing. 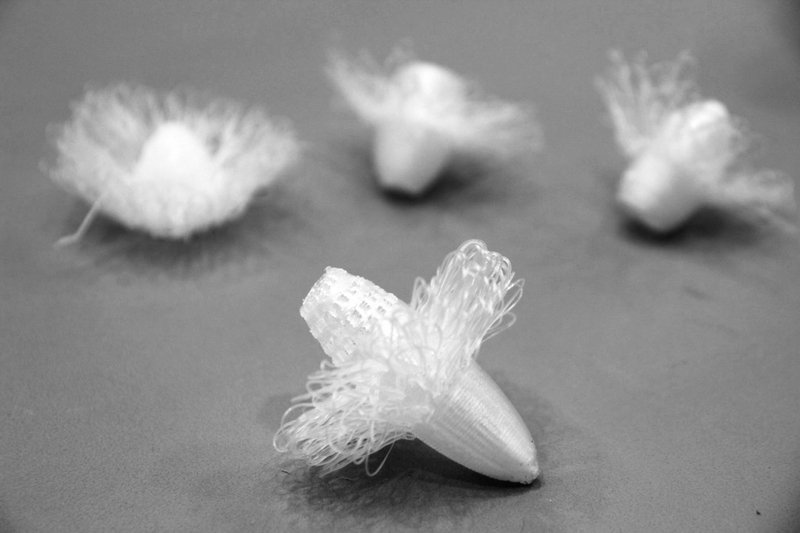 We use FDM 3D printing in order to make the leaves of the flower by extruding thin filament lines without support material. 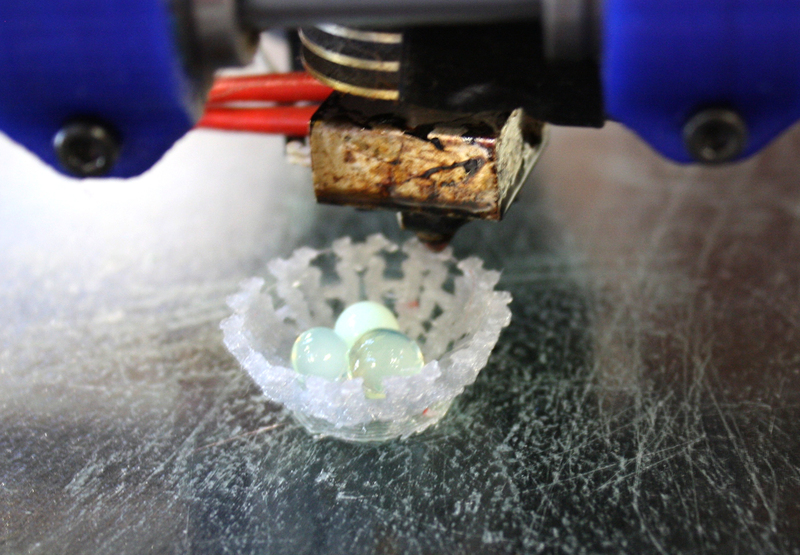 We pause the 3D print in specific height in order to introduce the hydrogel spheres and the metallic pin that stays encapsulated in the flower. 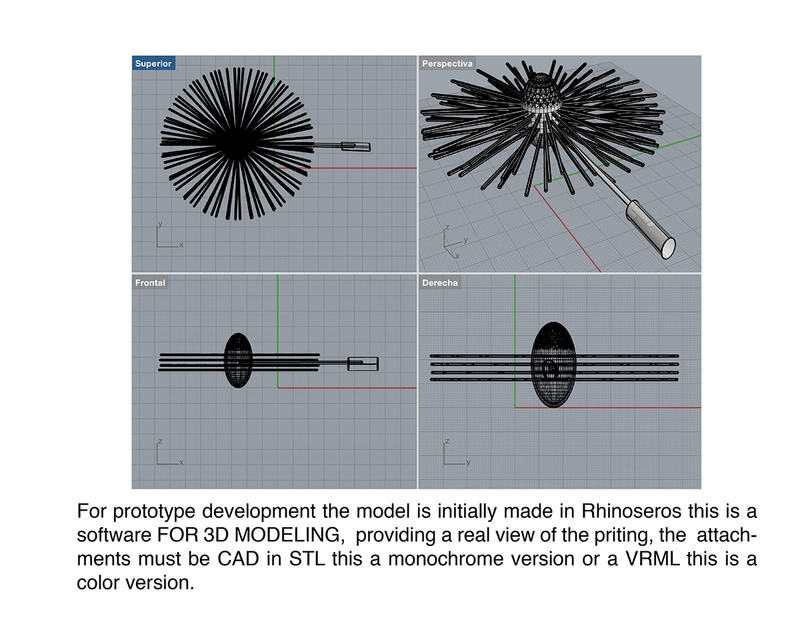 For prototype development the model is initially made in Rhinoceros this is a software FOR 3D MODELING, providing a real view of the printing, the attachments must be CAD in STL this a monochrome version. 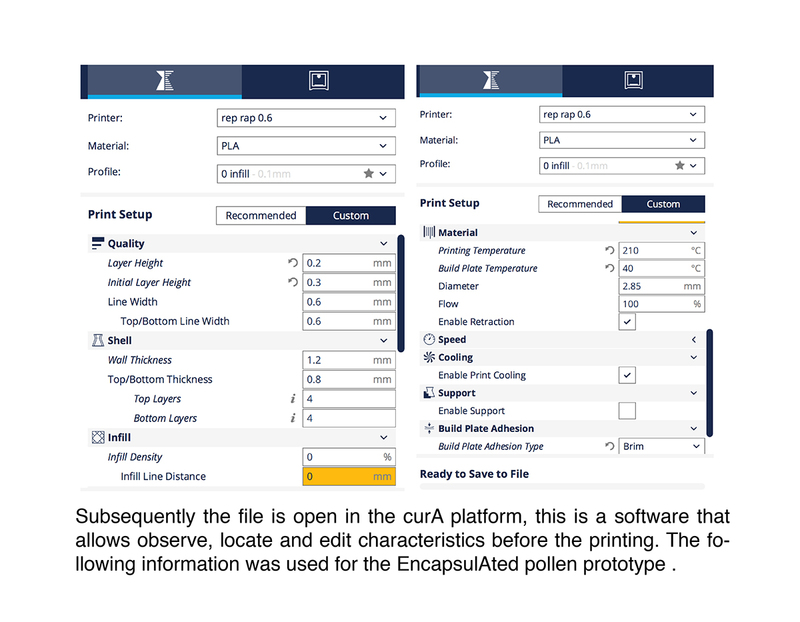 Find our complete documentation here! 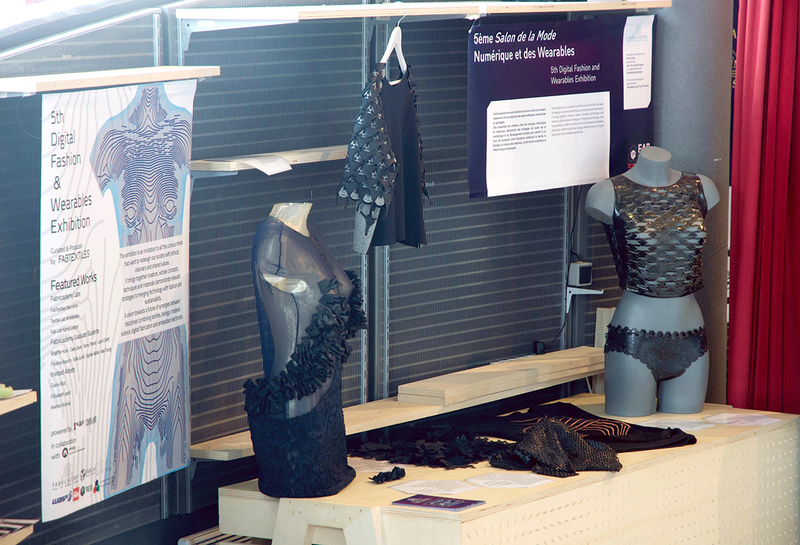 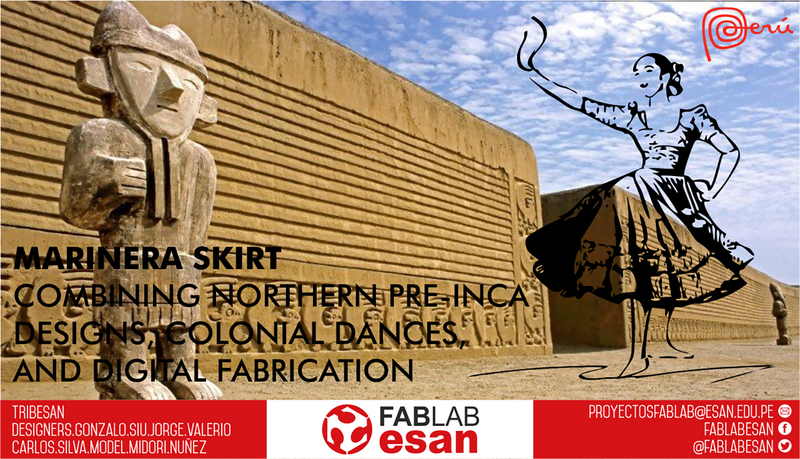 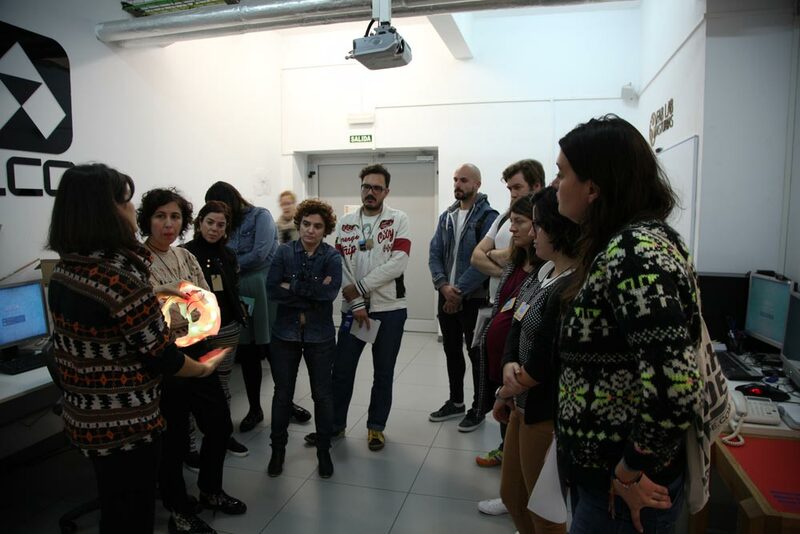 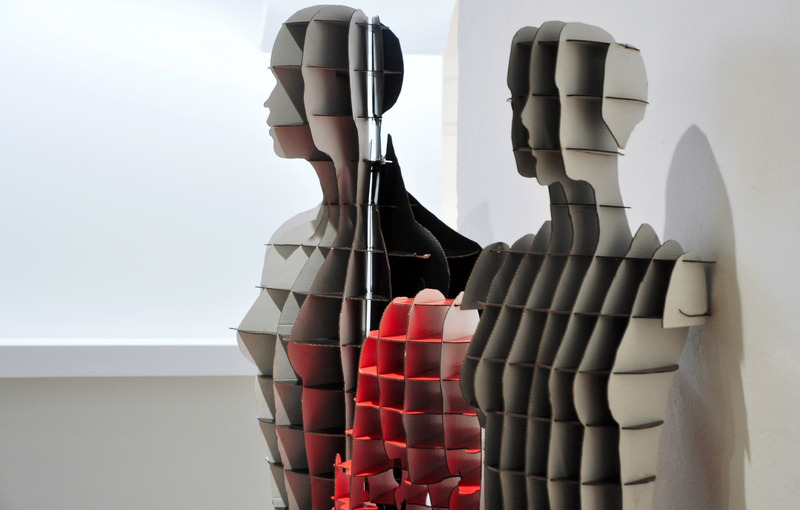 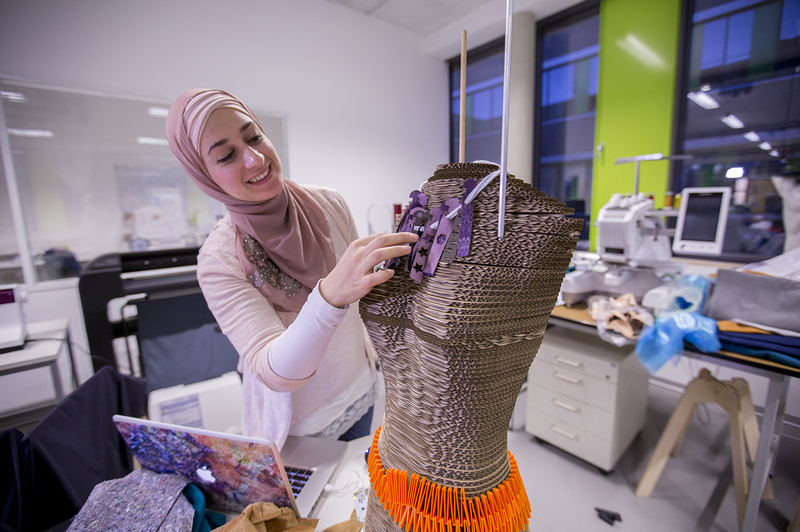 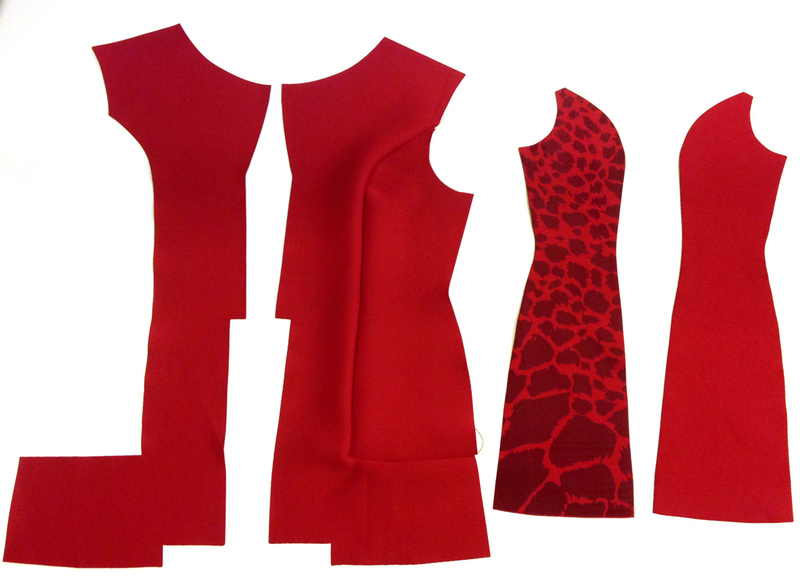 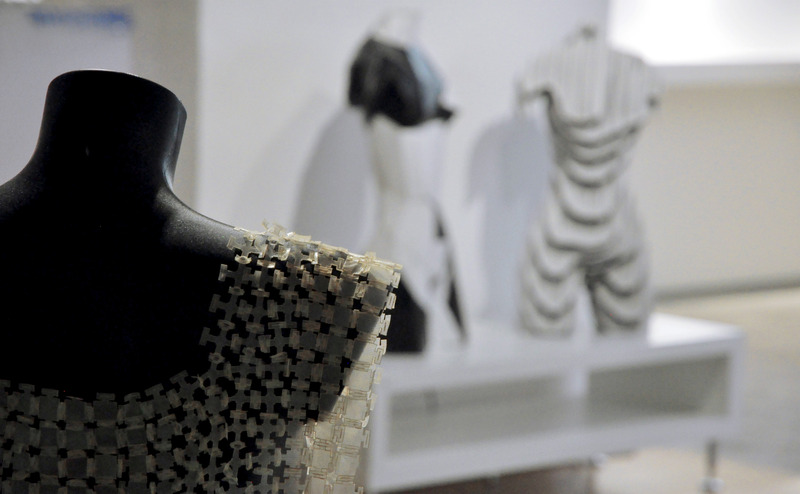 One of the lab´s research themes is the design and production of digital mannequins as an abstract representation of the human body using different fabrication processes and materials. 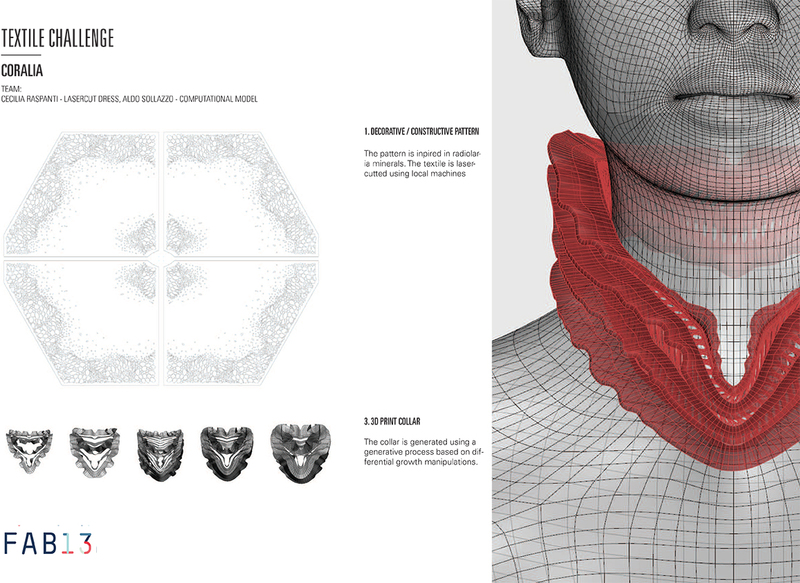 In order to obtain the body you can either scan yourself – even using 123d catch of skanect or you can make your proportions replica with MakeHuman freeware. 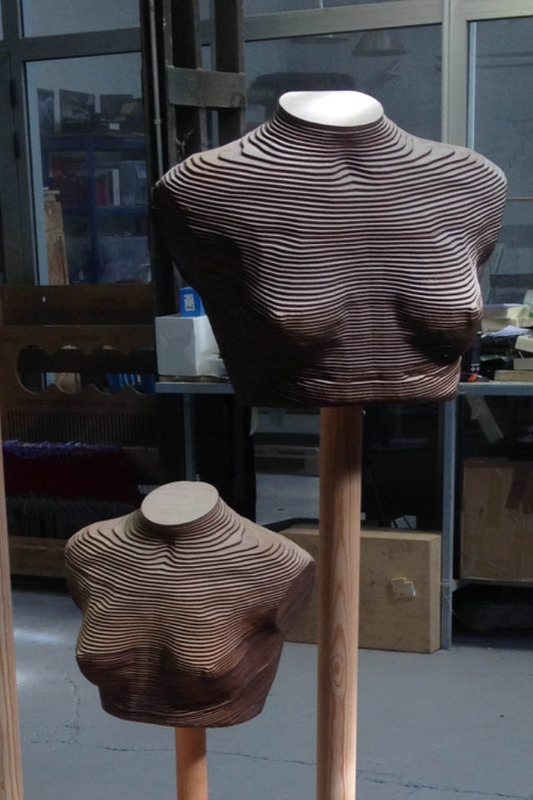 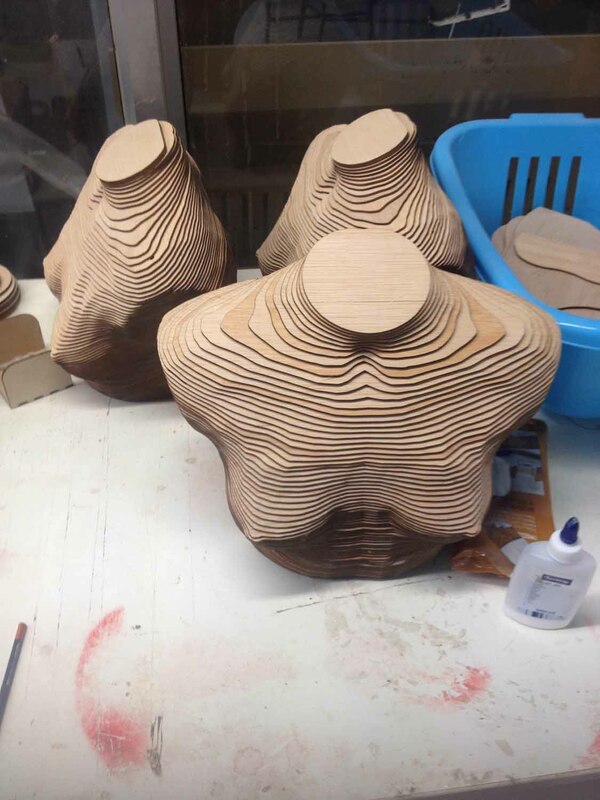 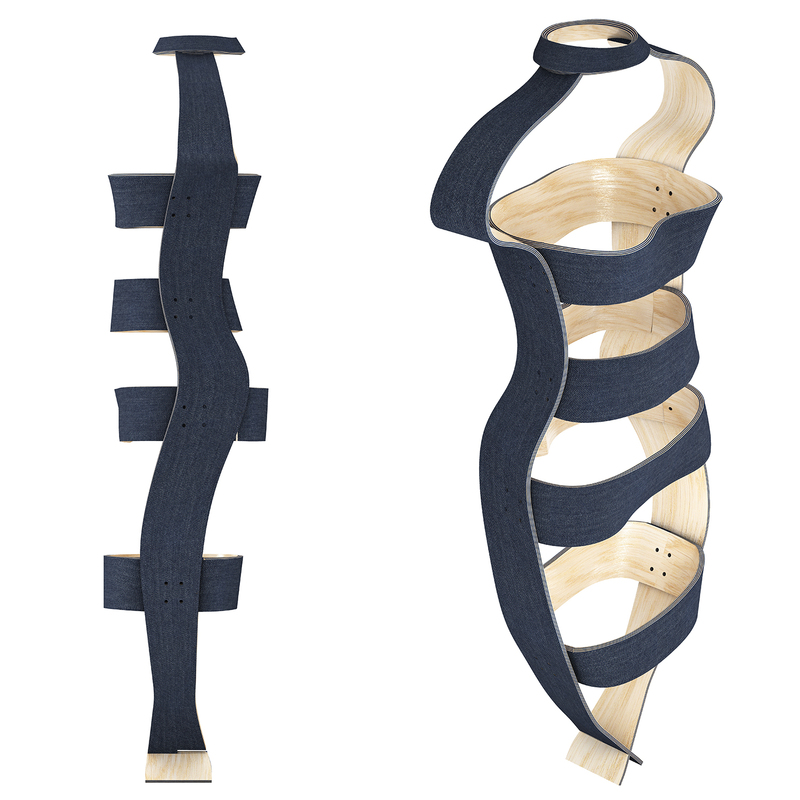 Up to now we have a waffle mannequin and various stacked mannequins using 123 make application but this year we decided to focus on the creation of a laminated composite of textile and thin wood bending process on a high density foam mold. 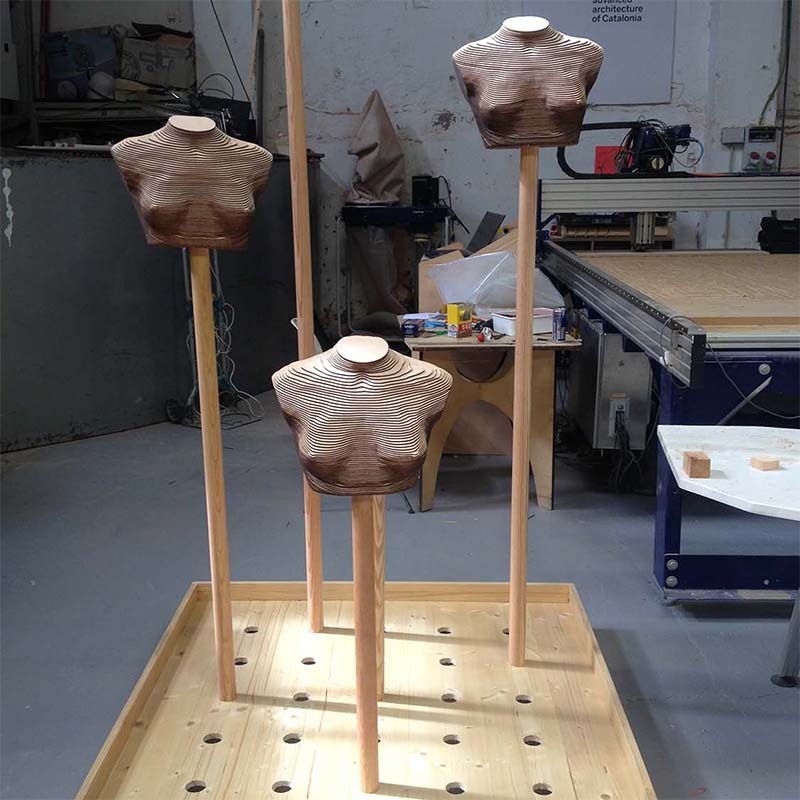 The idea of a soft-hard mannequin like skin and bones that is sketched with few lines but at the same time maintains structural properties. 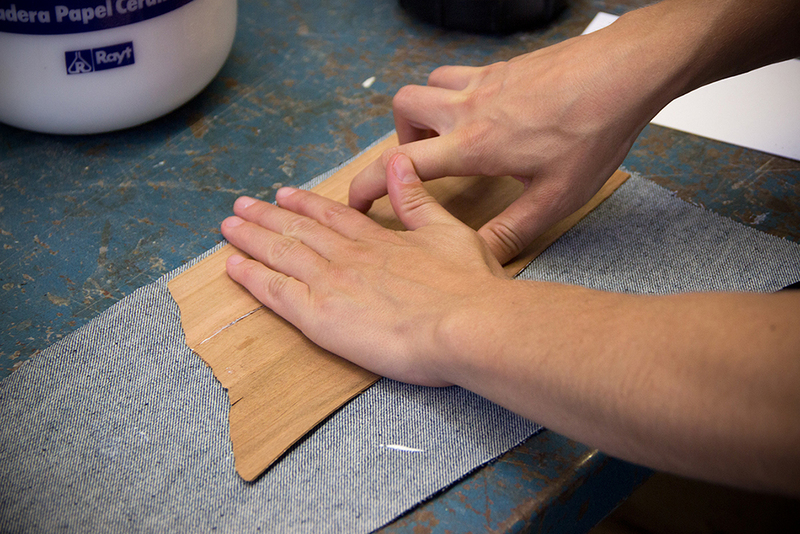 The composite is made of 3 layers of wooden stripes and 3 of textile alternating and glued with cascamite wood glue, layers over the CNC milled molds and vacuum pressed for 5hours. 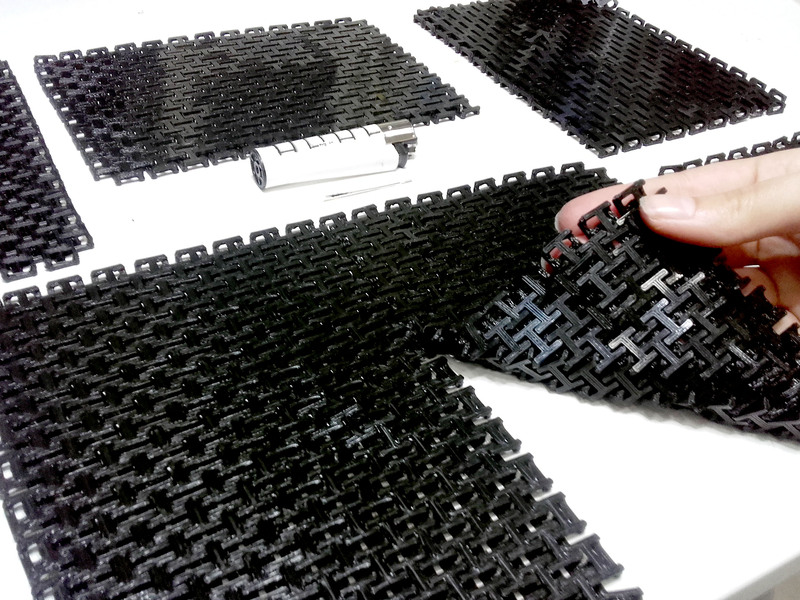 The final pieces are joined with screws. 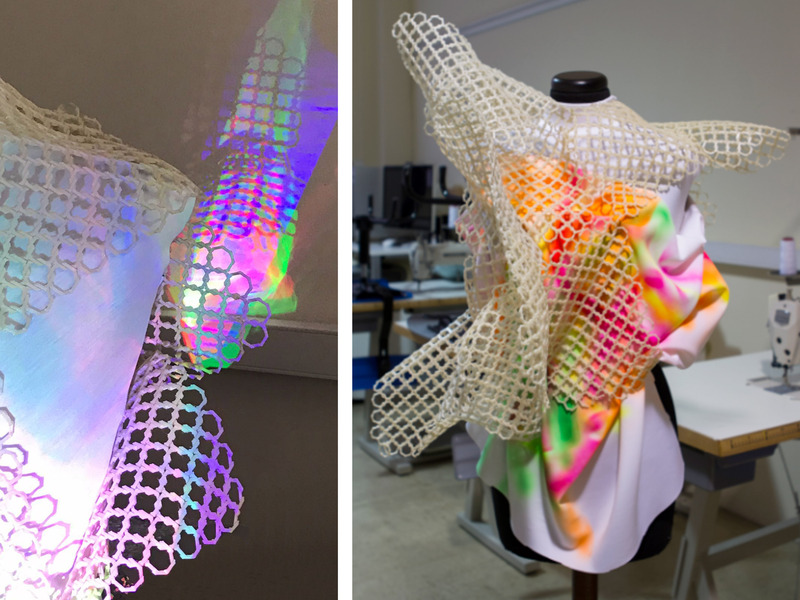 This project is a series of garments made as a collaboration between FabTextiles and Roland DG, using Texart RT-640 Dye Sublimation Plotter. 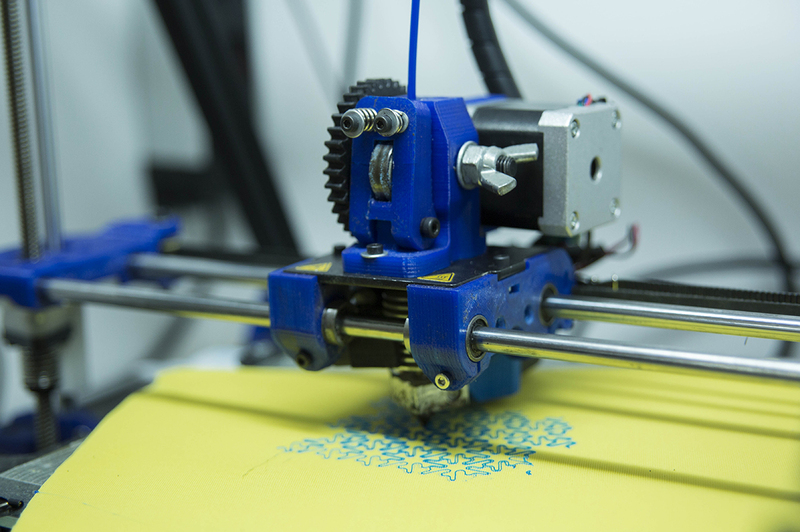 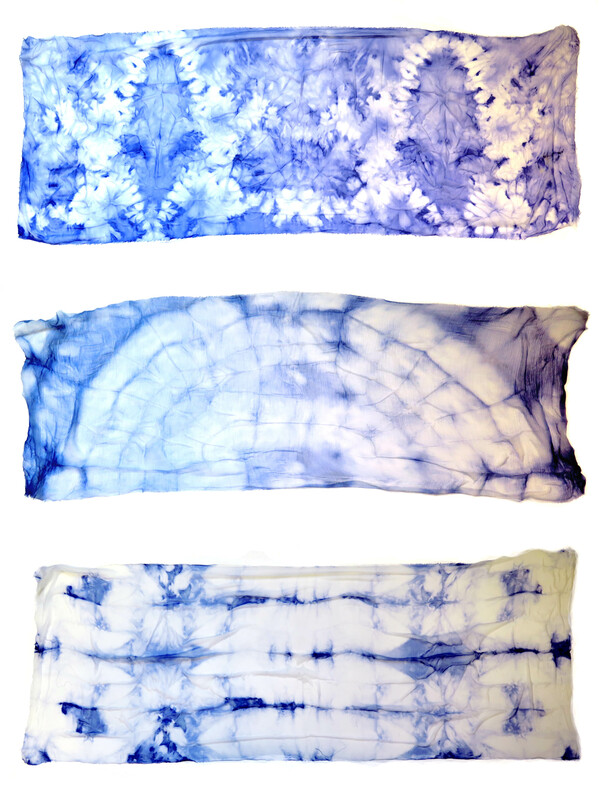 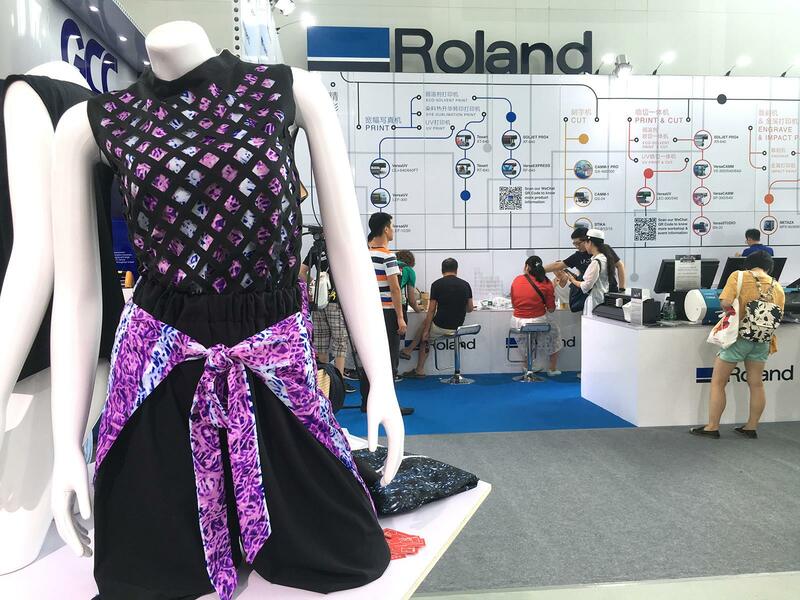 The collaboration is based on the possibility of providing the fab lab community with the access to a ready to print textile plotter and encouraging everybody to get to learn the process and the different fabrics that are available of the market for Dye Sublimation Transfer printing. 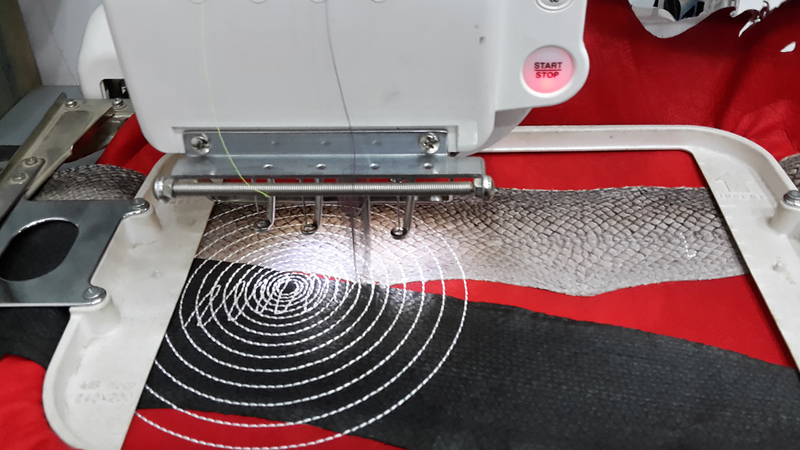 Custom digital textiles prints are existing in the market as online services, still they is a problematic of the designer not being able to touch and chose the desired fabric, which eventually creates a limited variety and potential in customization. 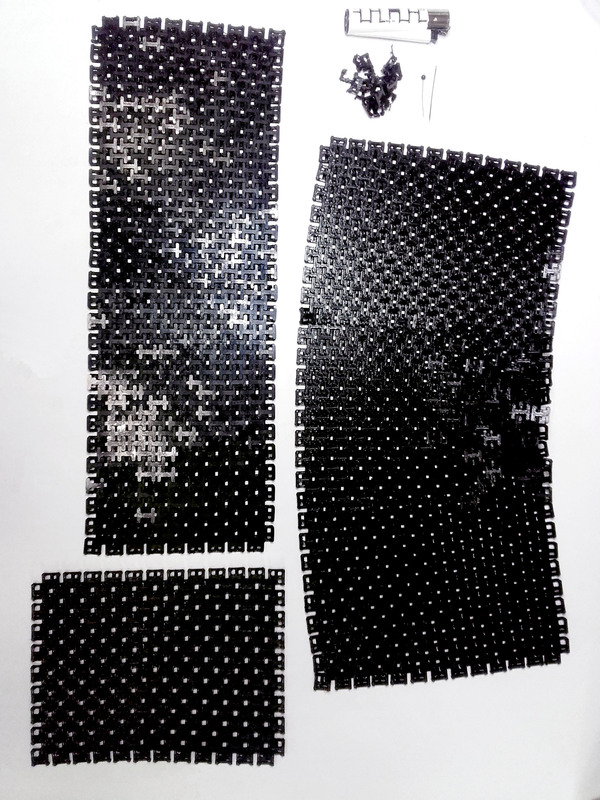 The printed patterns are a glitch generated by an old mac computer before shutting down forever generating a pixelated 2 dimensional landscape. 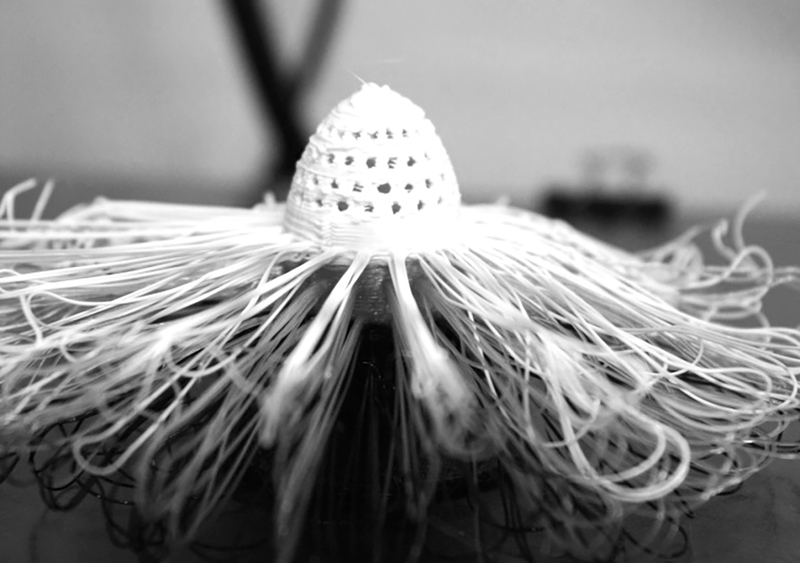 Other prints are based on a series called Spaghetti Art, ¨glitches¨ made by an FDM 3D printer, where the printed object resulted a failure. 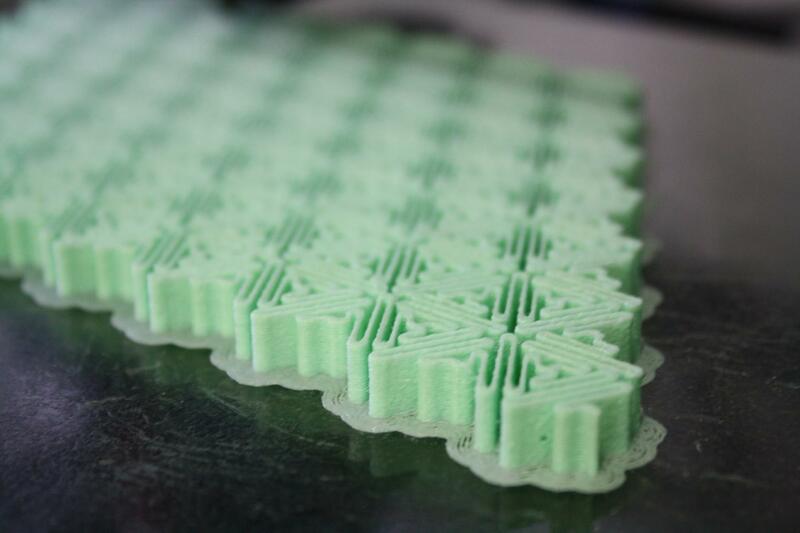 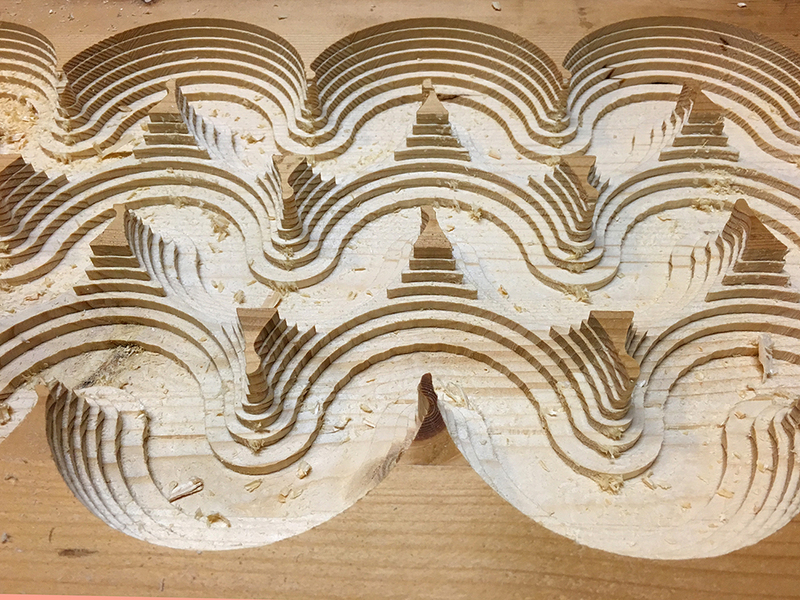 Images of failed 3D prints were processed and converted to repetitive patterns. 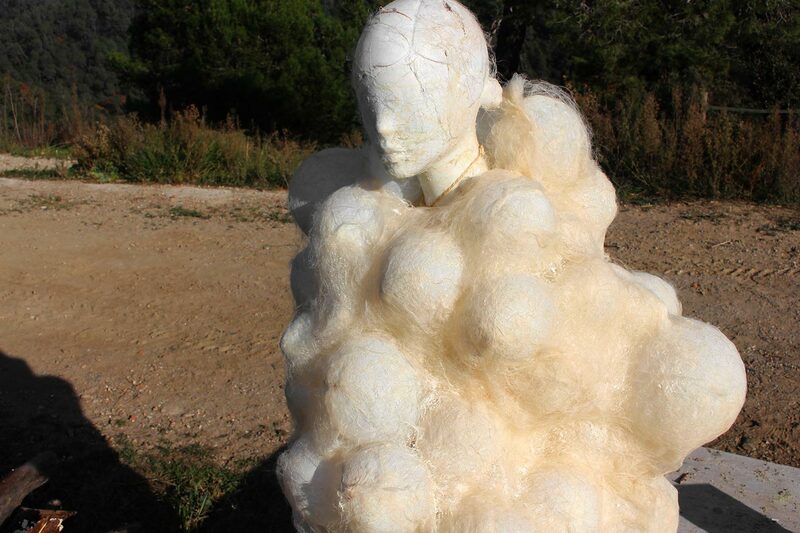 Soft Space is a seminar that explores new relationships between our body and the surrounding environment. 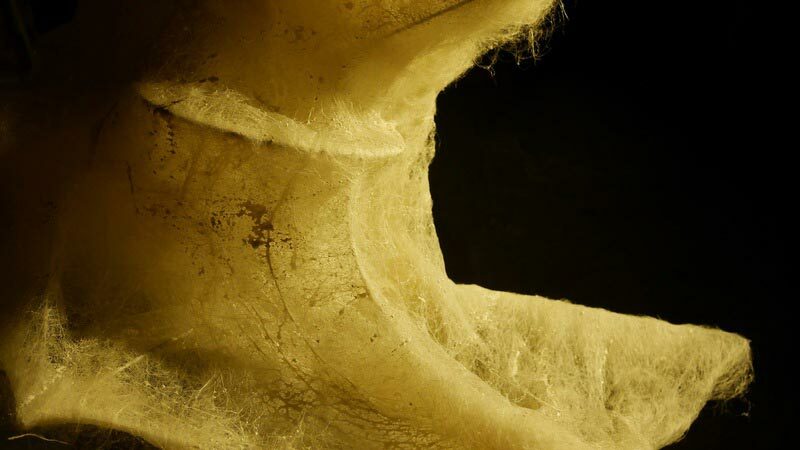 Even if our body is 90% of the times enveloped in soft materials, we cannot declare the same with space and its architecture. 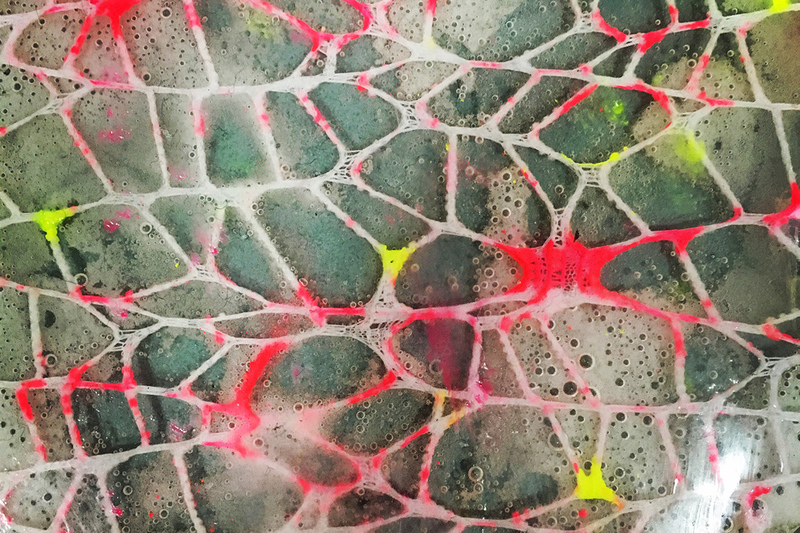 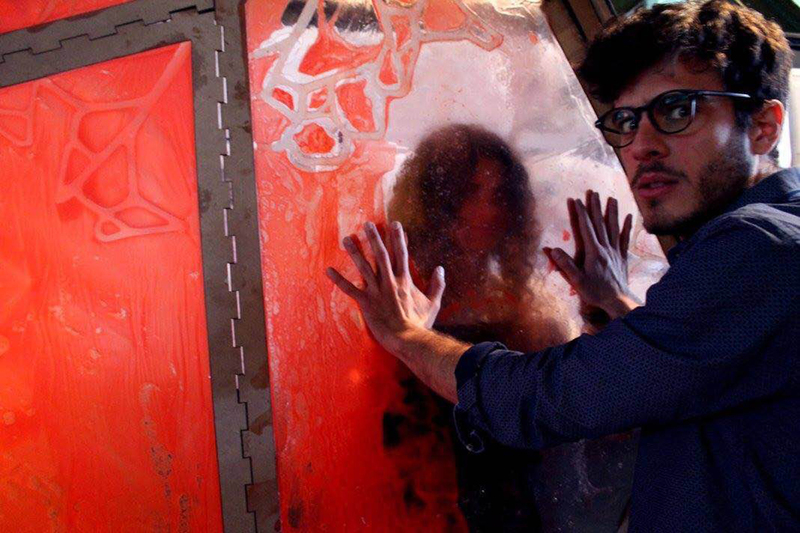 What if we imagine a fluid , soft, maleable , interactive surrounding as an extension of our body? 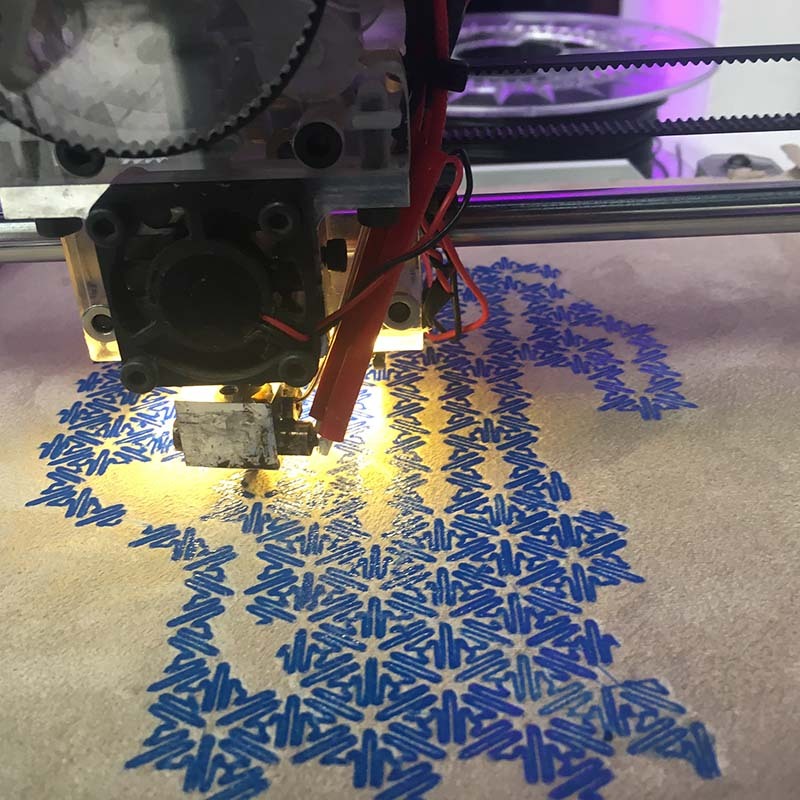 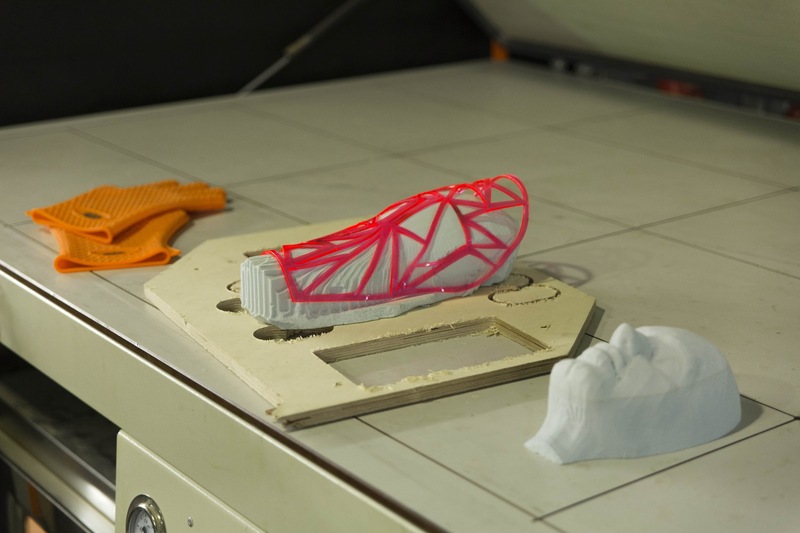 Digital Fabrication and CAD-CAMM technologies give us easy and direct access to tools and create a fertile ground for experimentation. 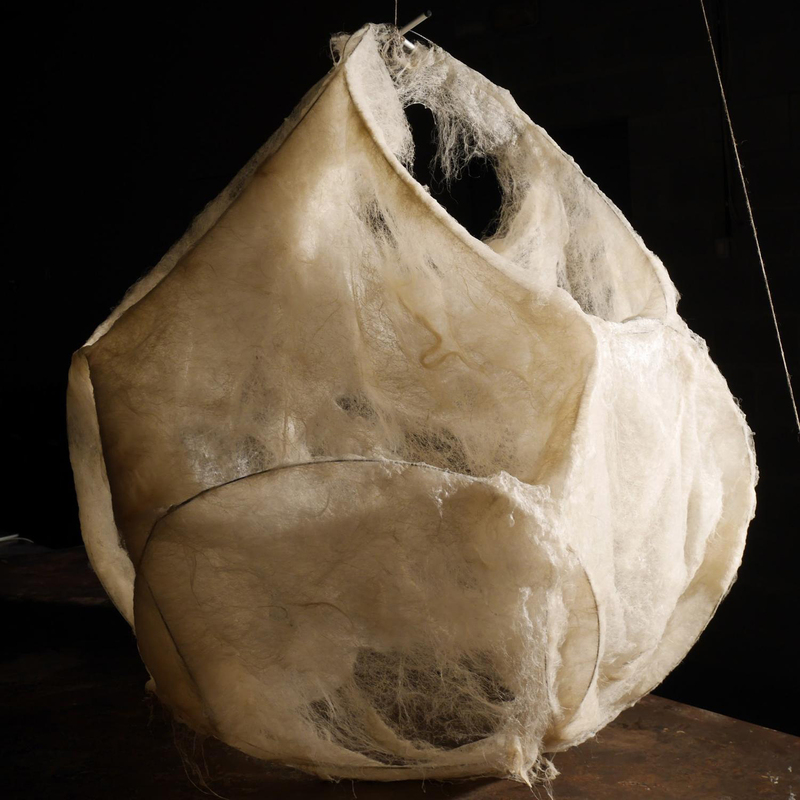 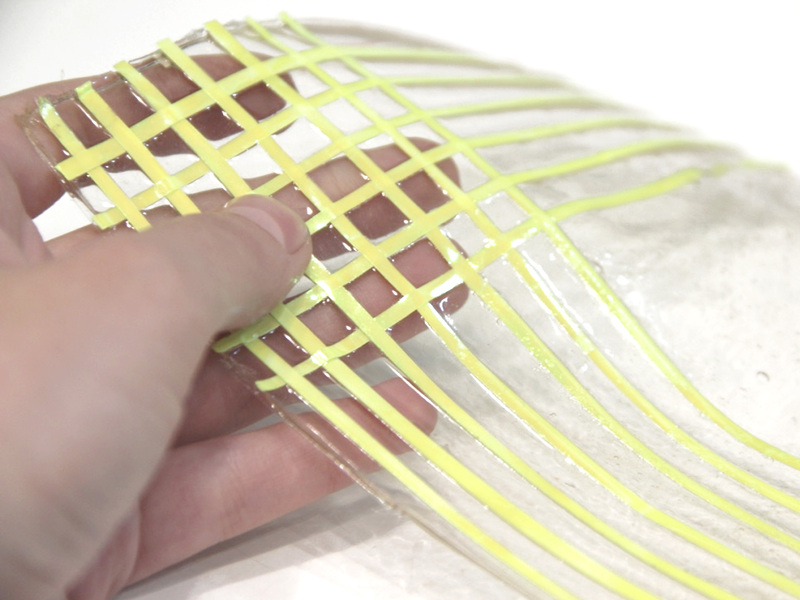 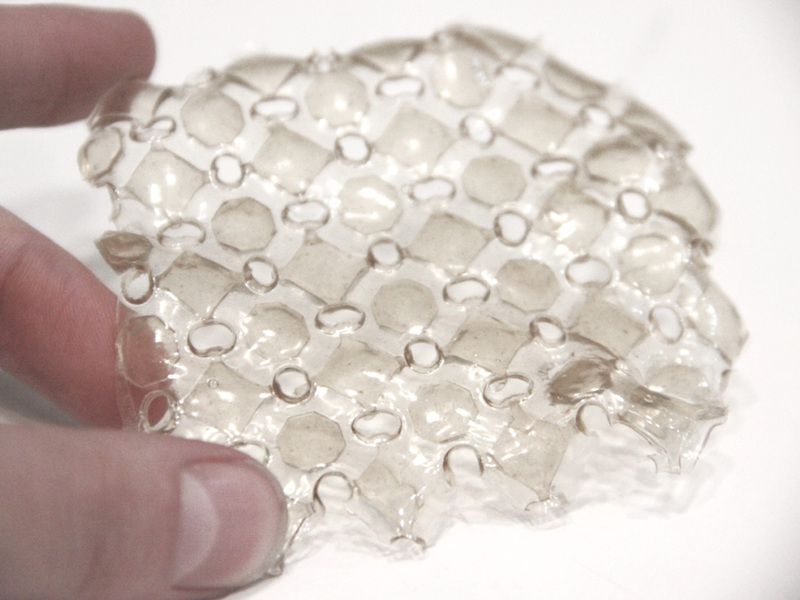 Through the exploration of soft materials and different fabrication techniques we can design new interactions and perspectives about objects, our body and space. 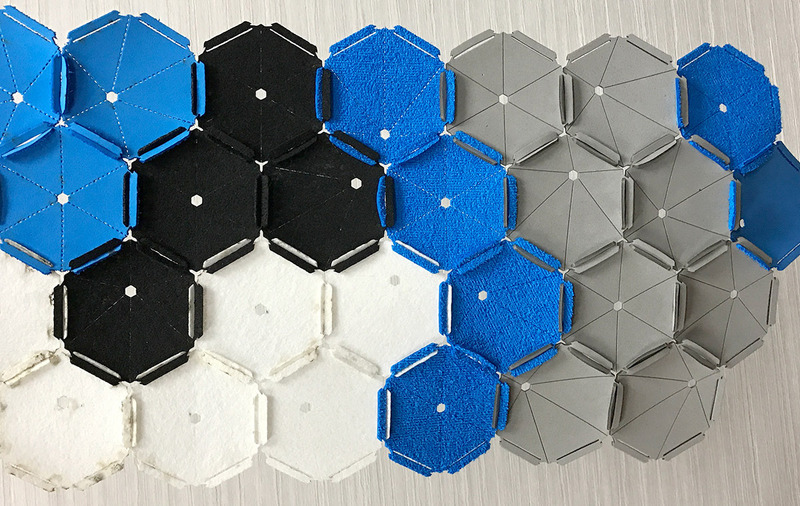 Ece Tankal & Ilkim Er worked on the exercise “Modular Systems” where one geometry can assemble with the other to create a seamless form of textures. 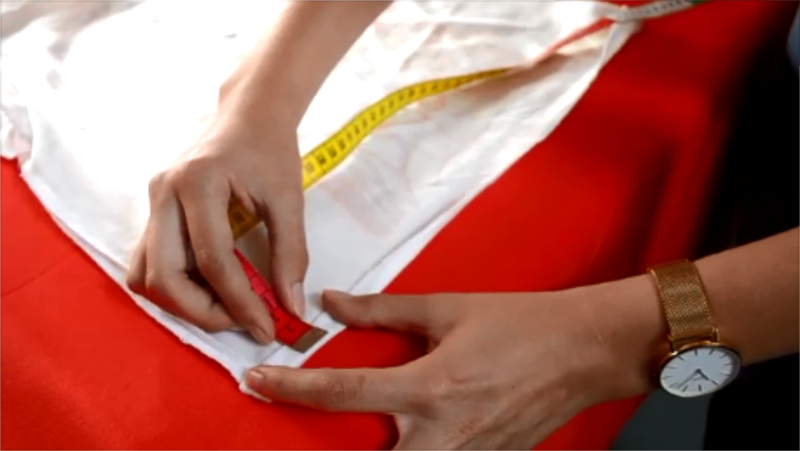 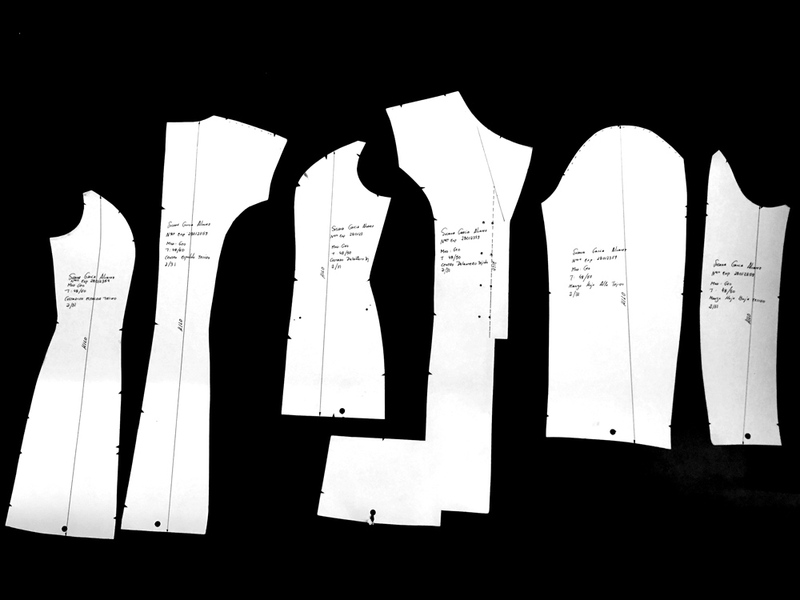 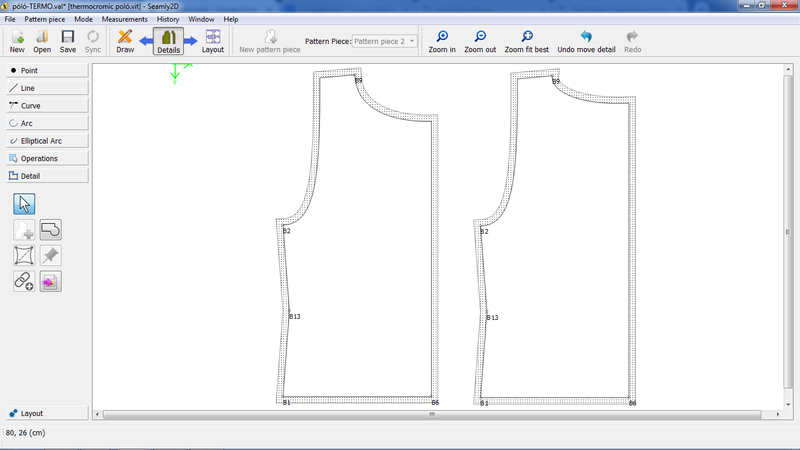 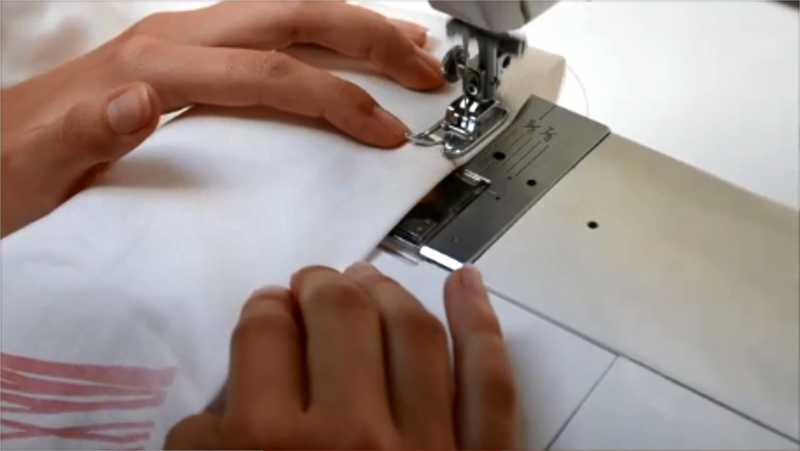 There are many Fashion Designers as well as product designers that work with unit repetition. 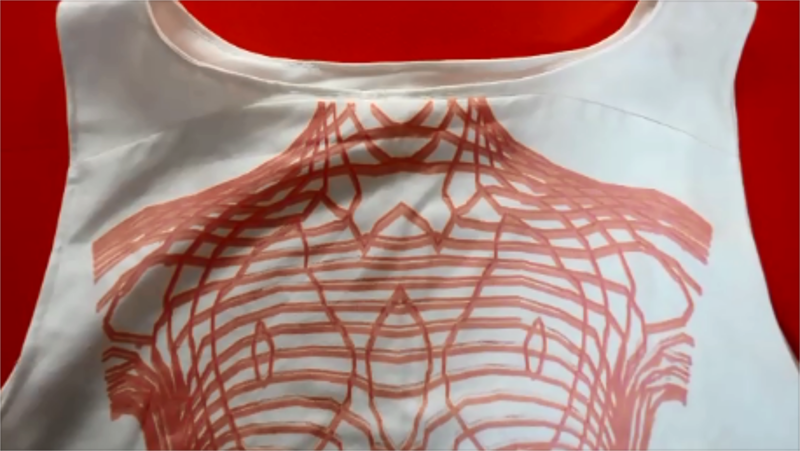 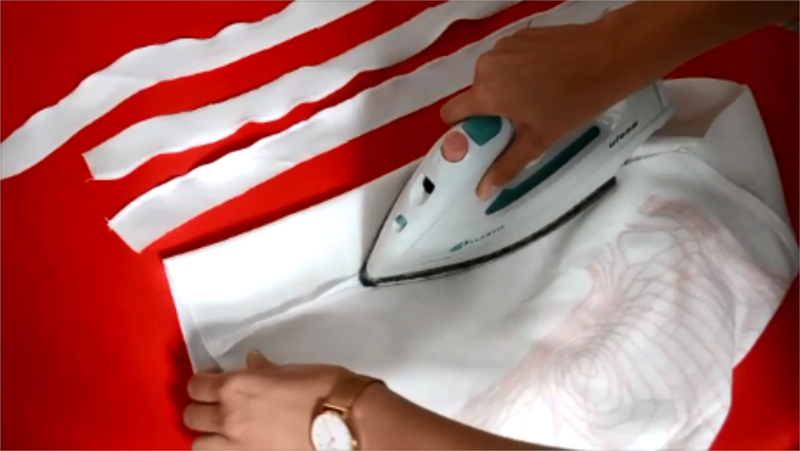 We can imagine clothes that are multifuncional and you can reconfigure with this technique. 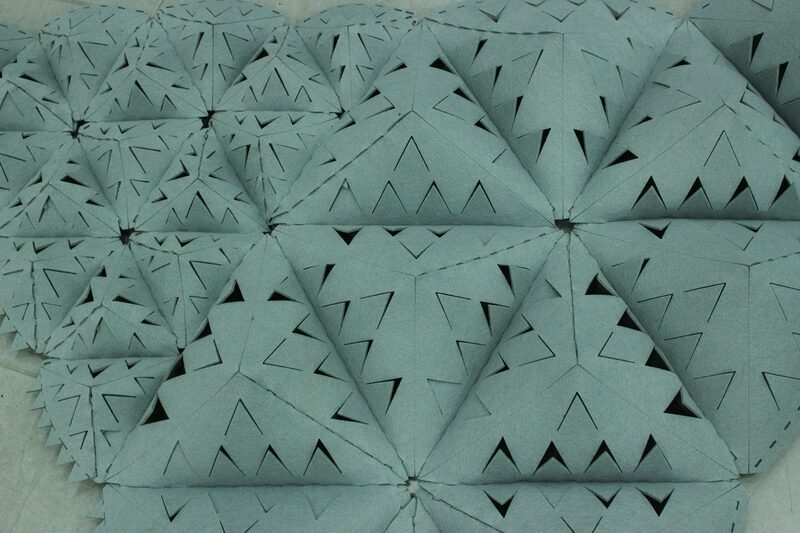 They chose a triangular form that once it’s assembled it stays bent in a 3d shape that creates volume and rotation. 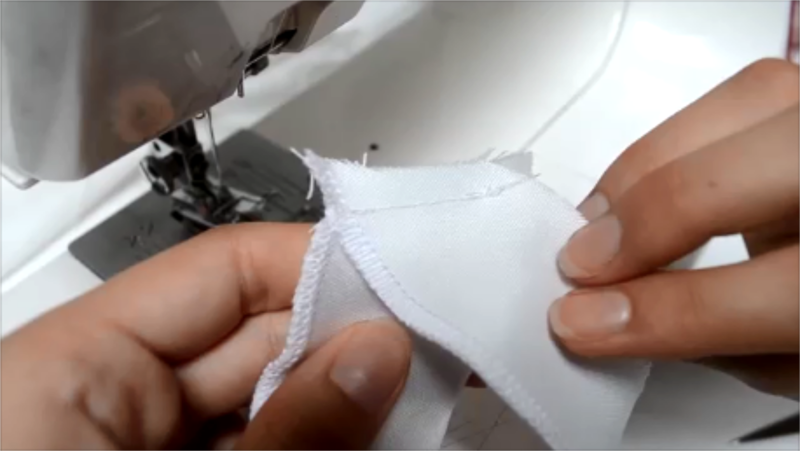 The distance of the hole of the triangule can vary and form less or more volume and mold. 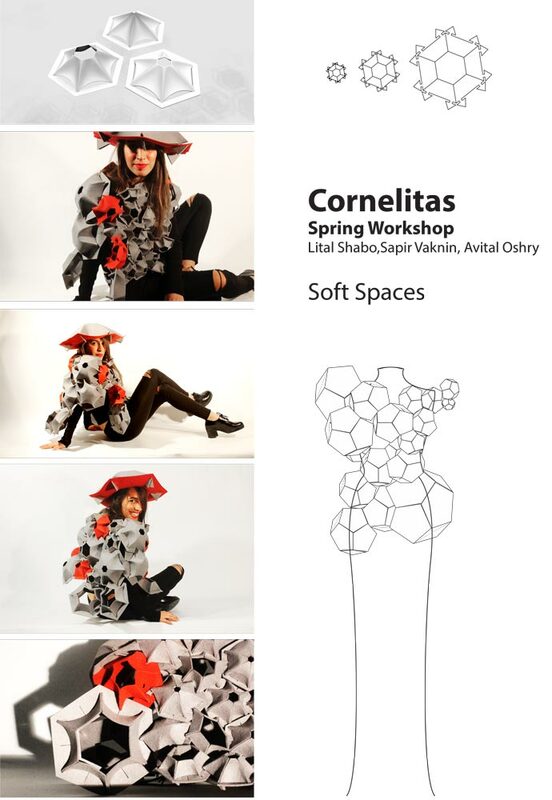 The seminar is taught to students from the 1st and 3rd year of fashion school at Veritas University in Costa Rica,, in collaboration with Fab Lab Veritas, CINNO. 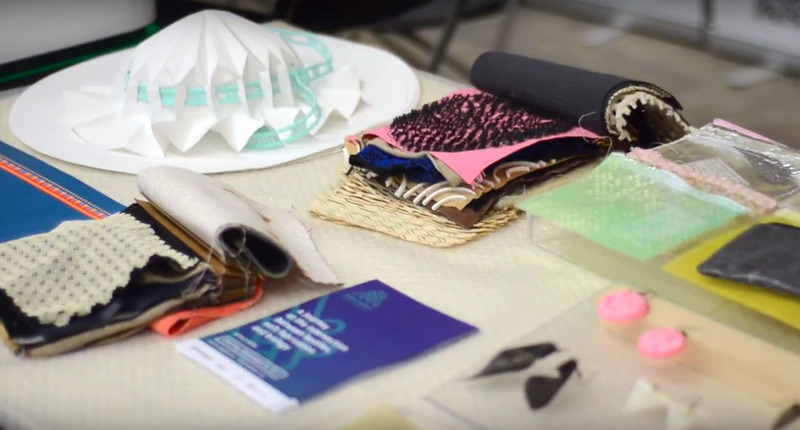 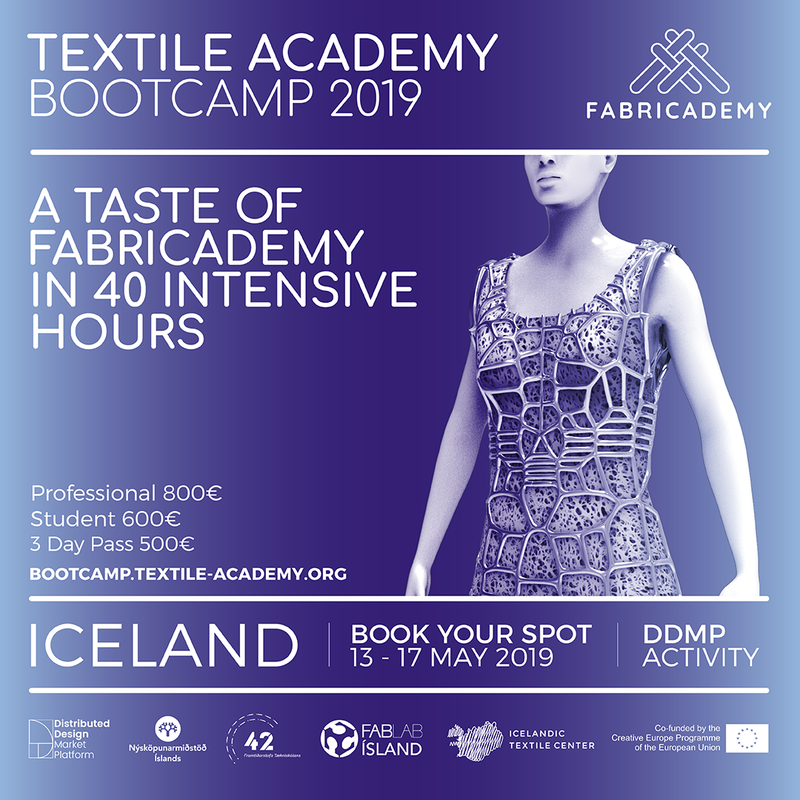 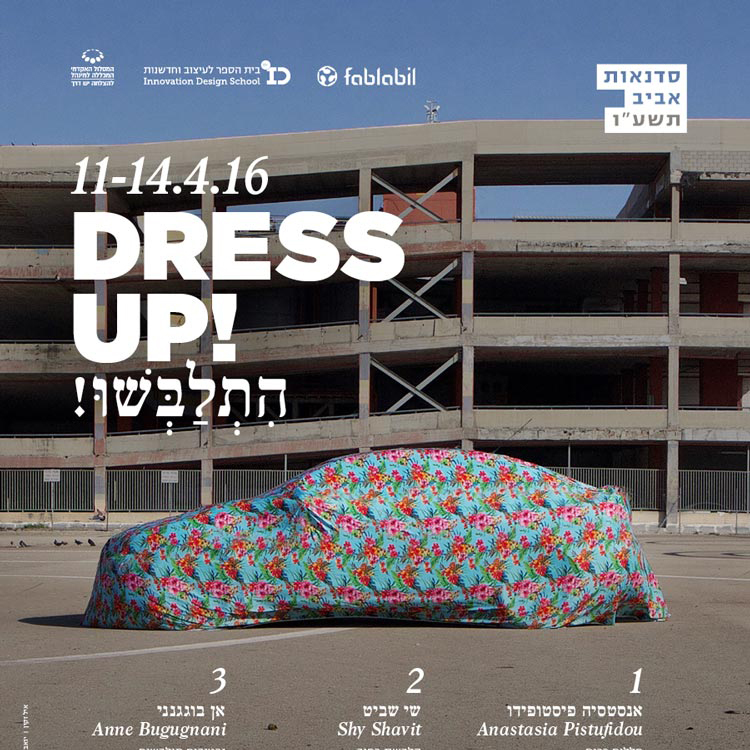 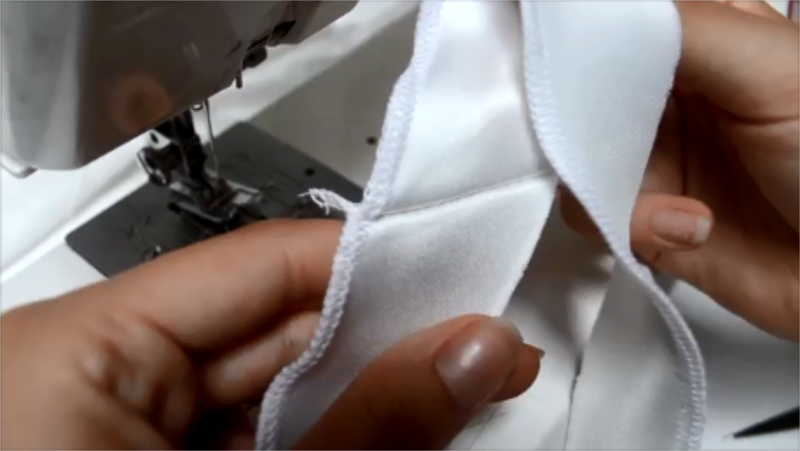 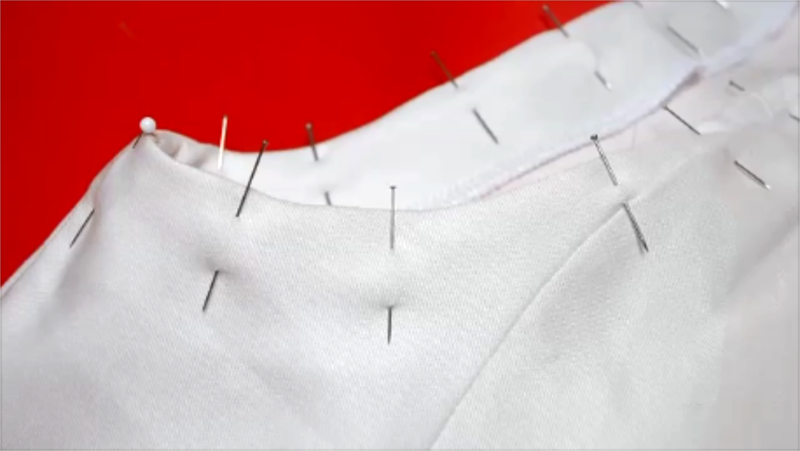 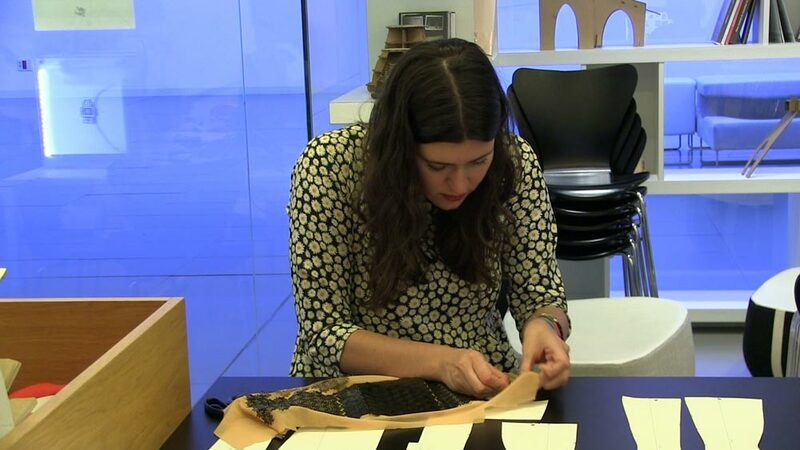 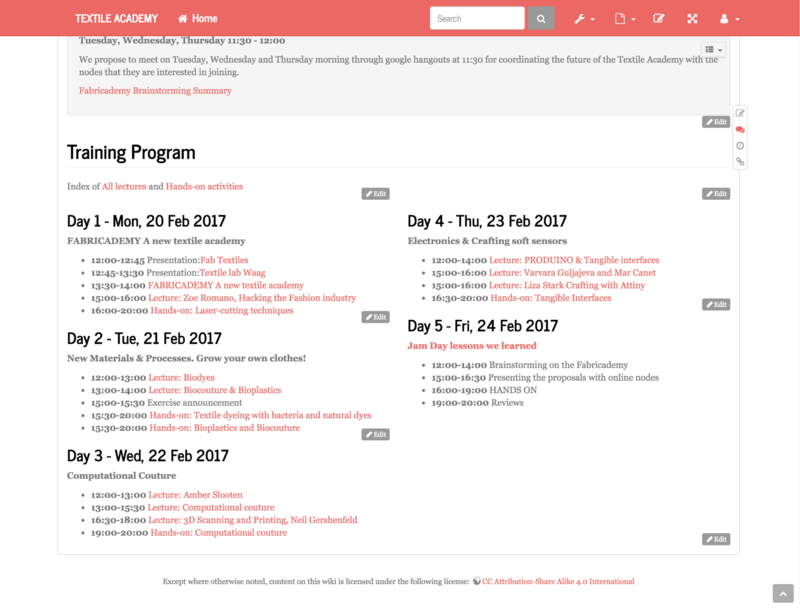 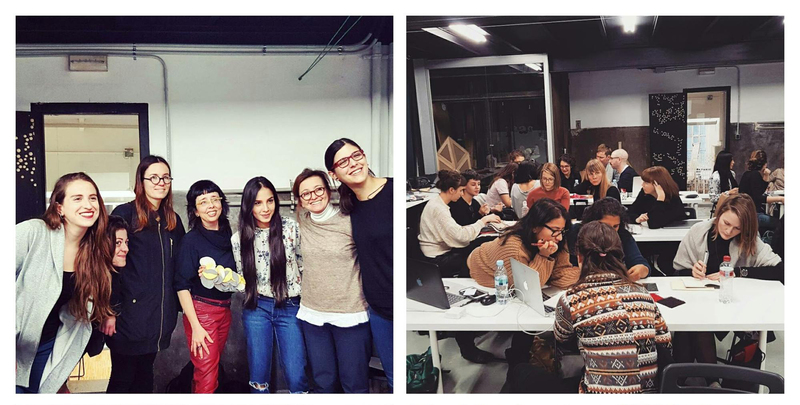 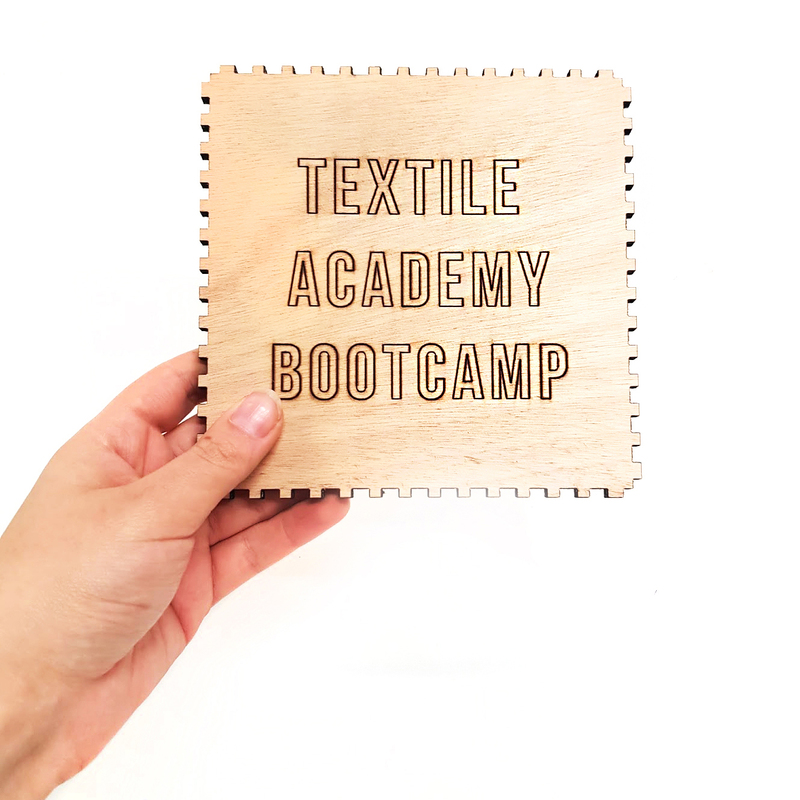 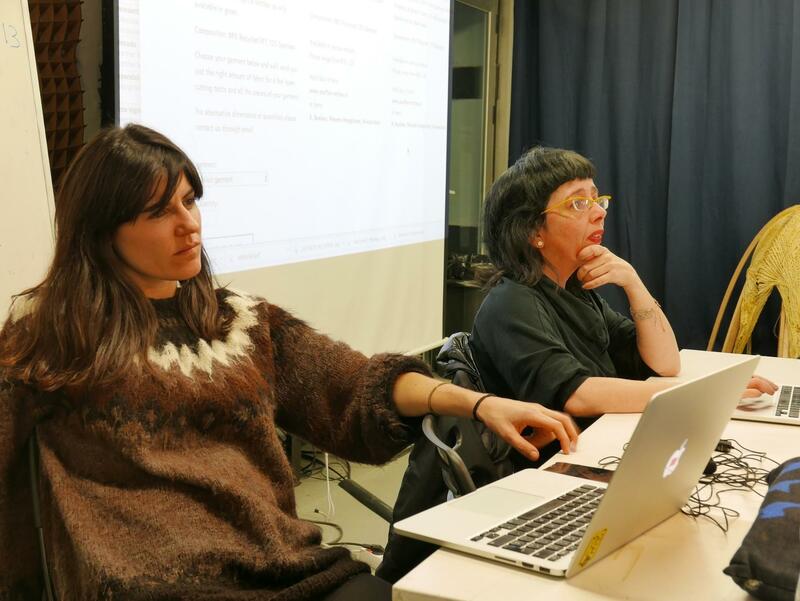 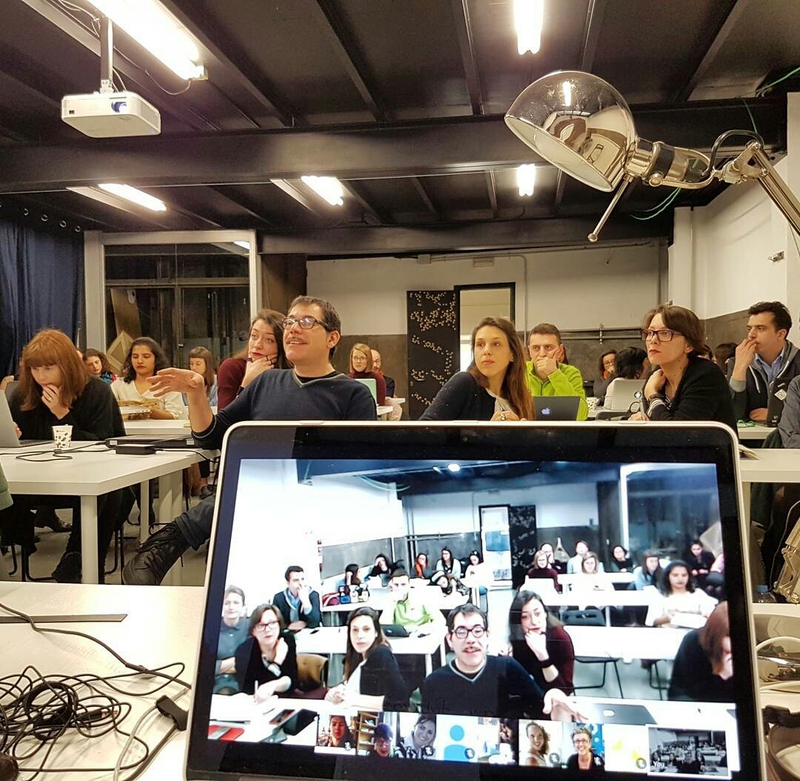 In this 20hour seminar the students of fashion are introduced to the possibilities, the techniques and the processes of digital fabrication applied in fashion. 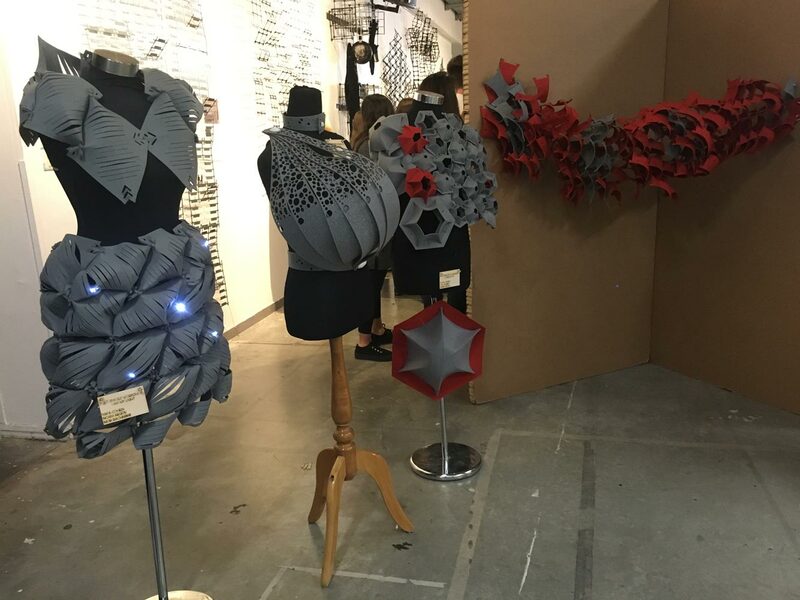 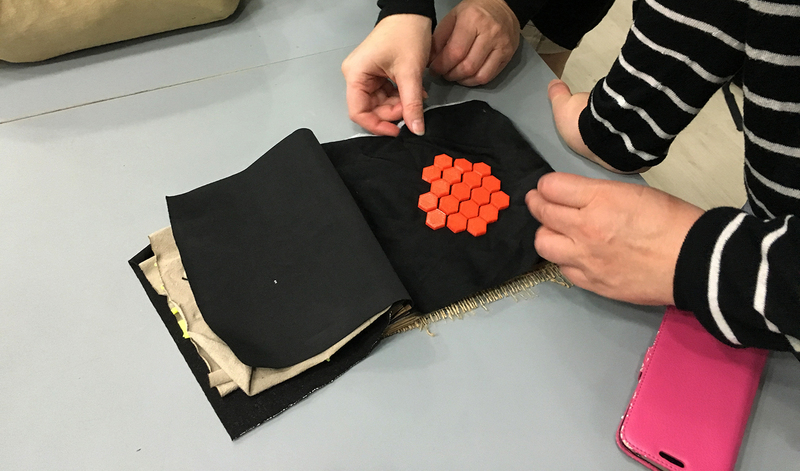 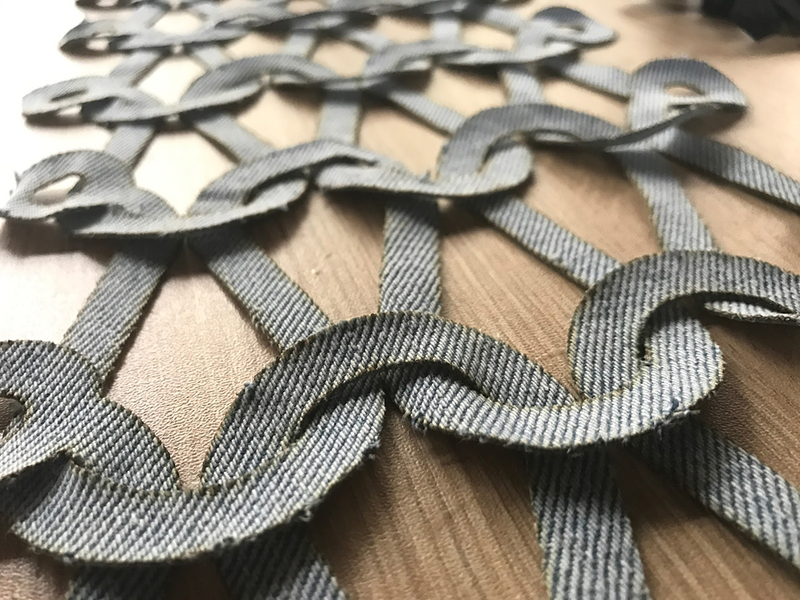 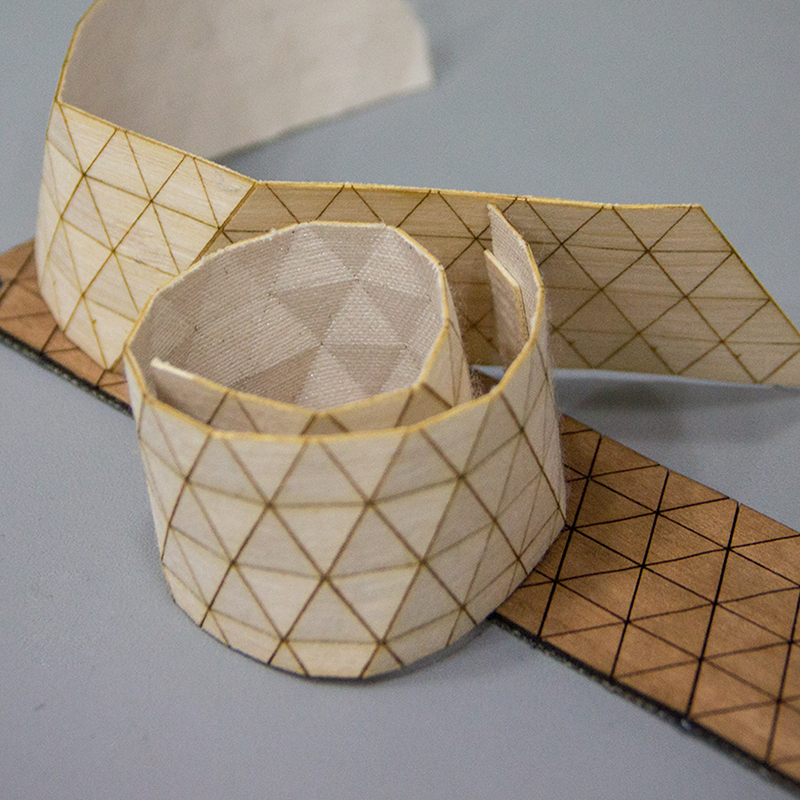 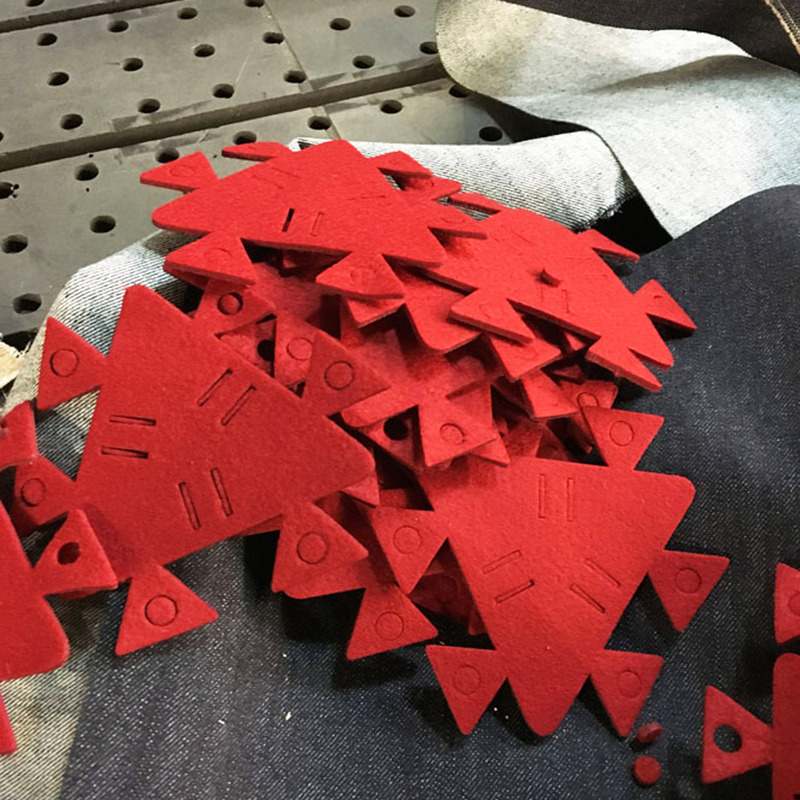 They get to understand what is the procedure from design to production, how different materials can be manipulated through laser cutting and what kind of 3D geometries can printed to imitate textiles. 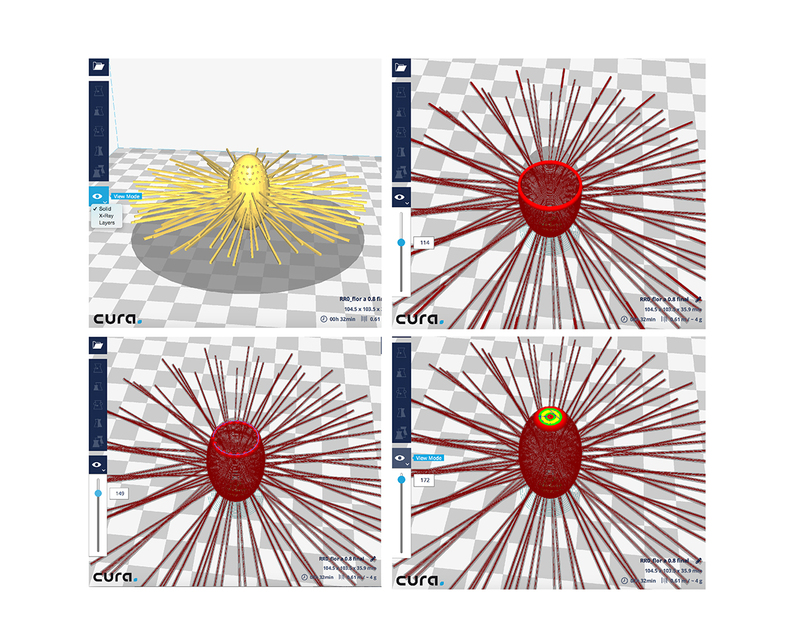 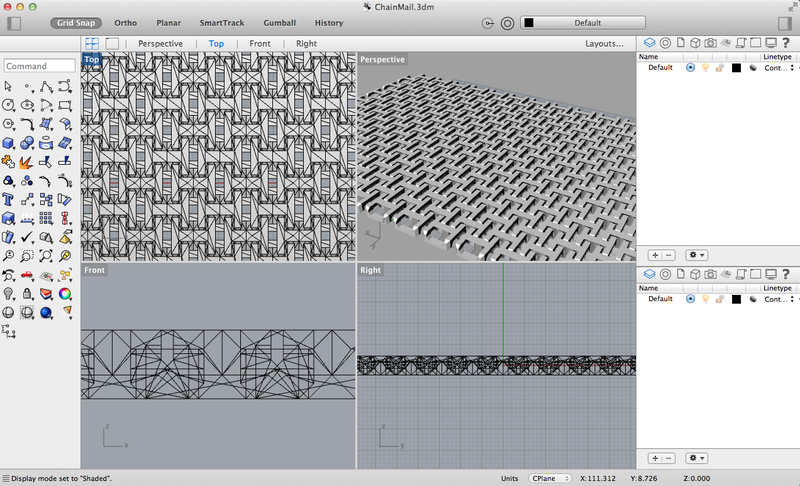 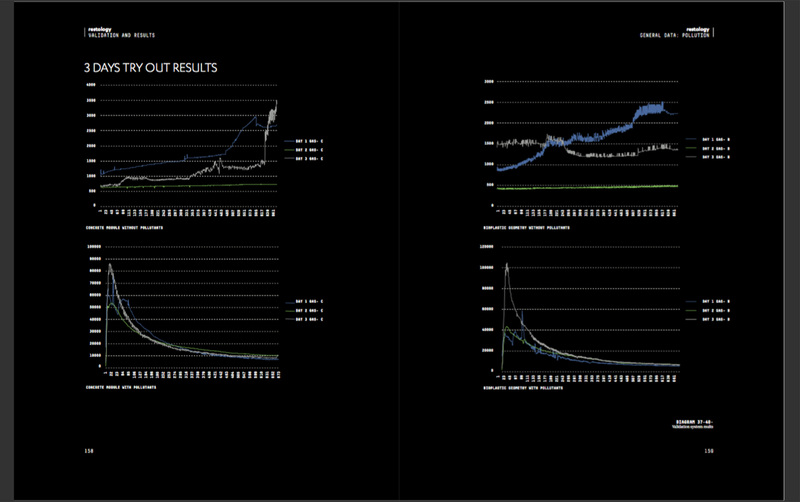 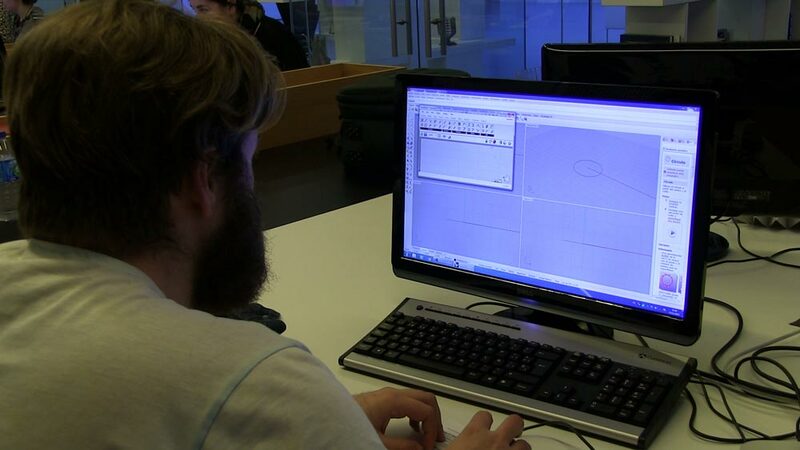 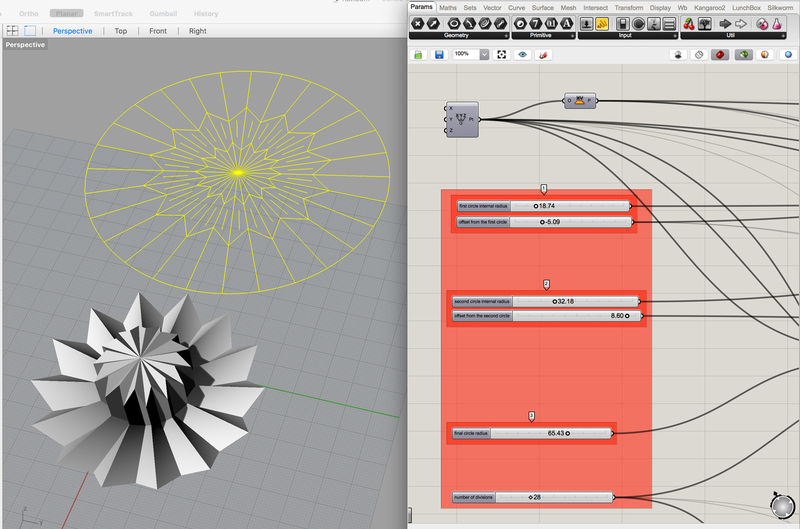 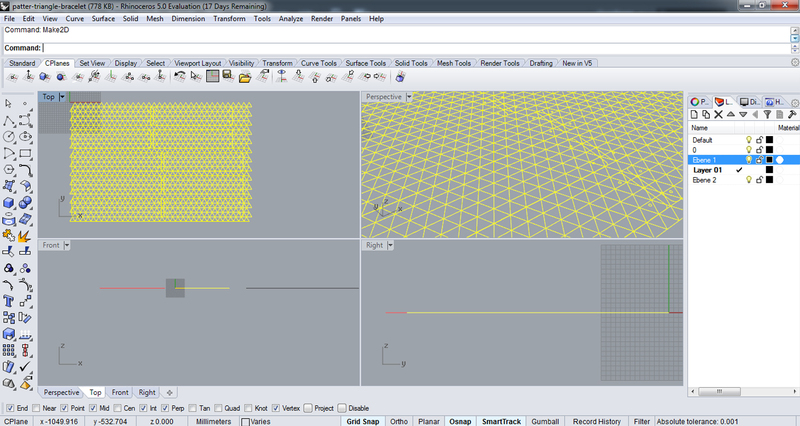 The exercises imply the use of open source tools, such as Make Human, 123d make,rhinoceros, grasshopper,illustrator. 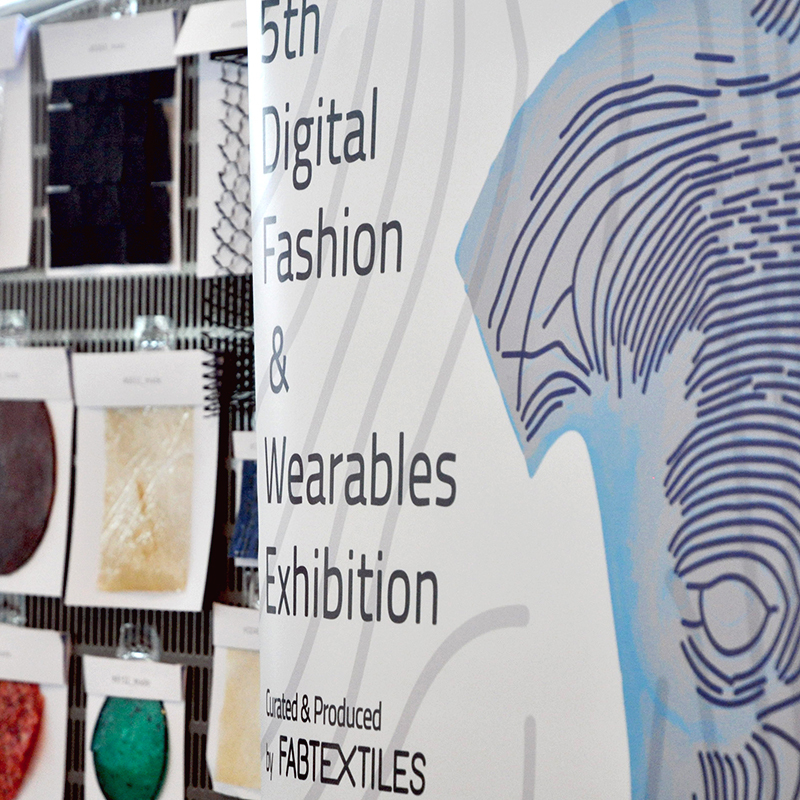 15 participants showcased their works during Fab11 Conference in Boston. 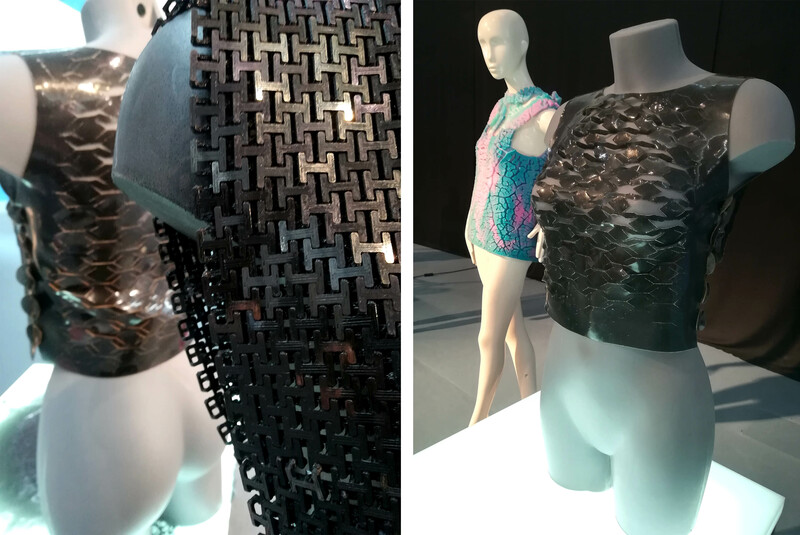 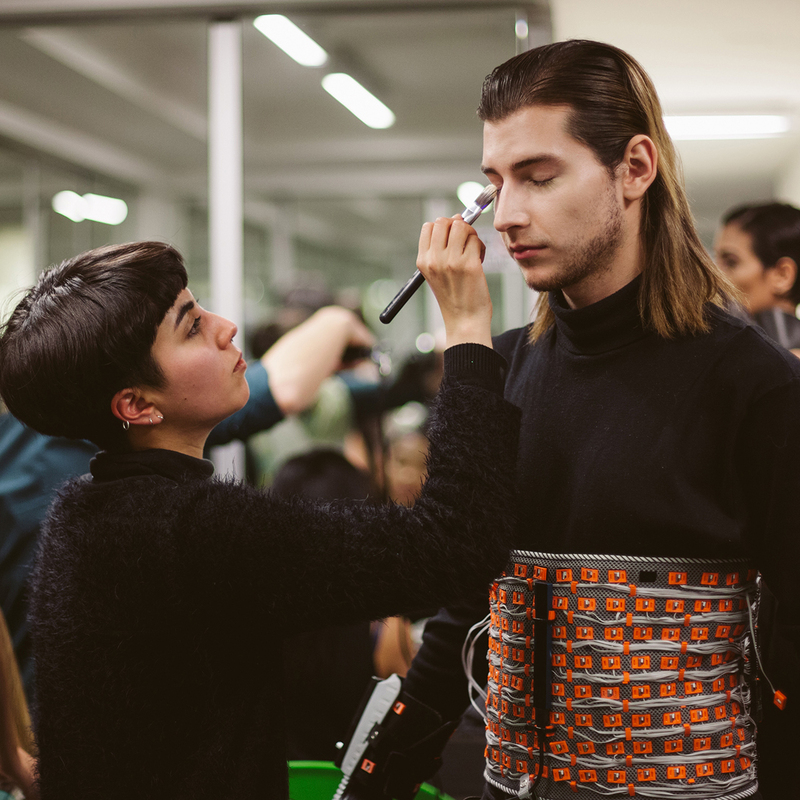 From performance garments, prosthetics, experimental couture made in fab labs all over the world to brands that have introduced 3D printing to their collections and clothes that measure your pulse and express themselves. 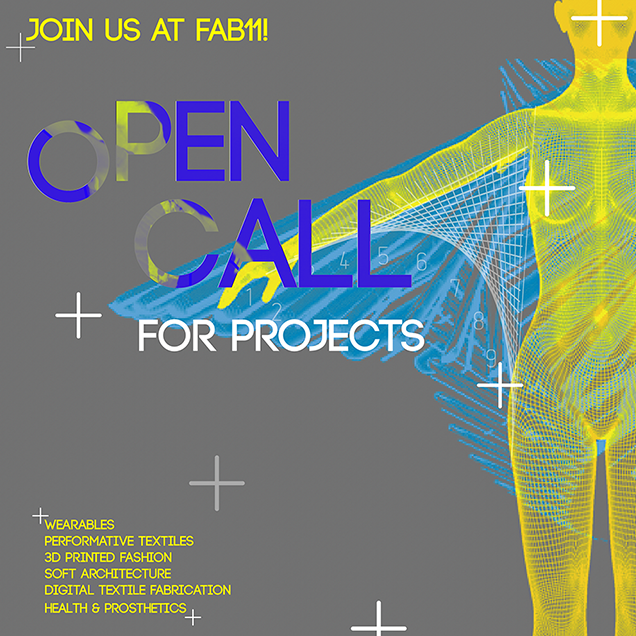 Have a look at the projects presented!